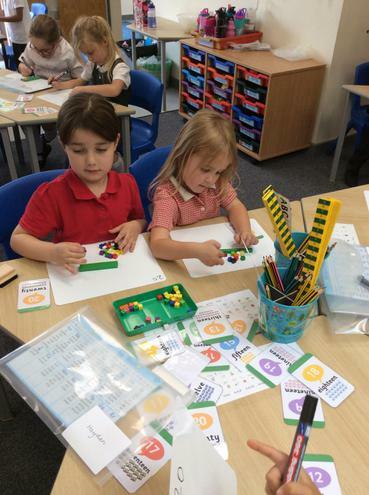 This term in maths we are going to have a big focus on problem solving. 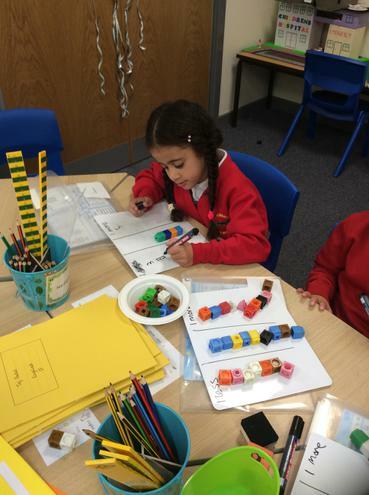 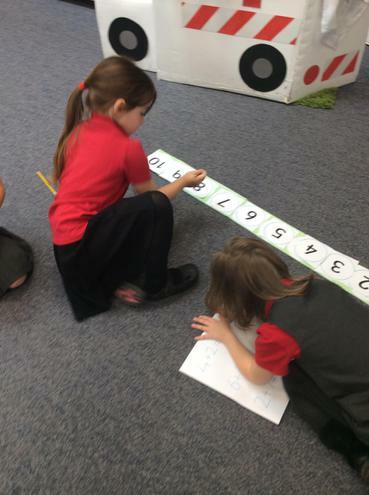 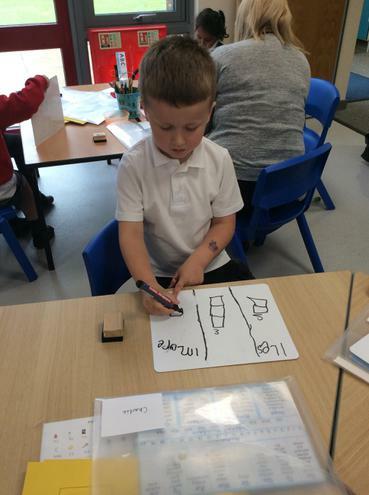 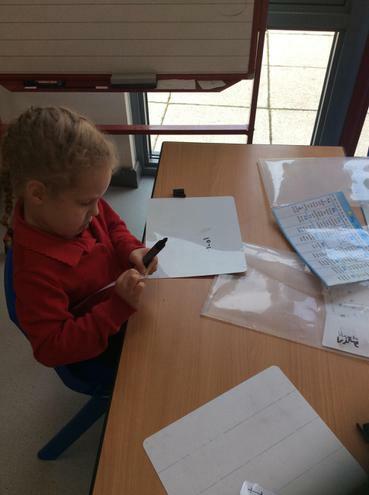 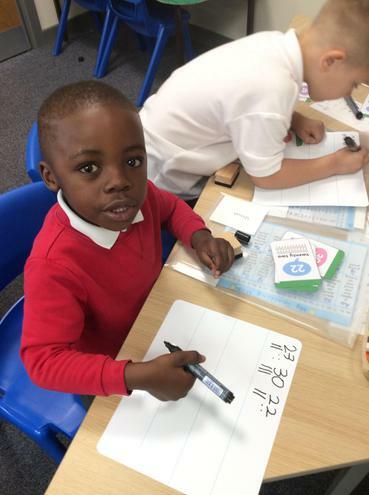 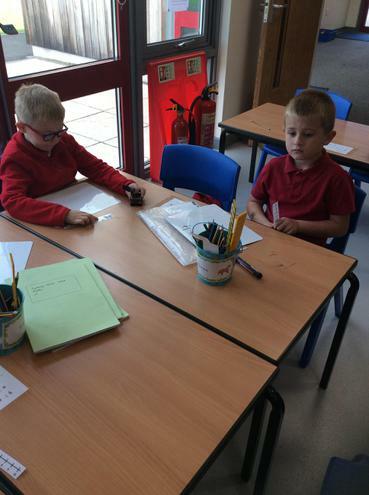 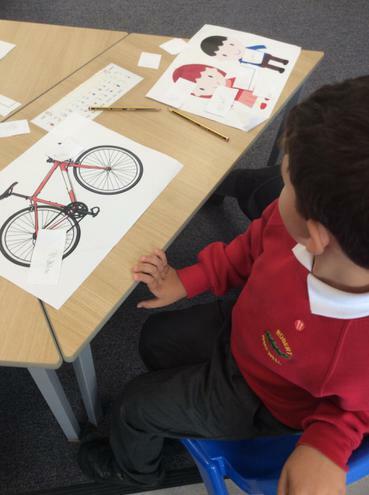 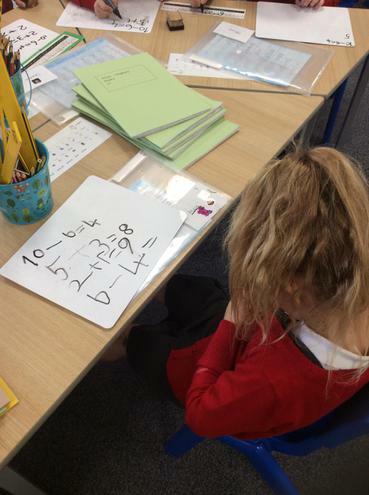 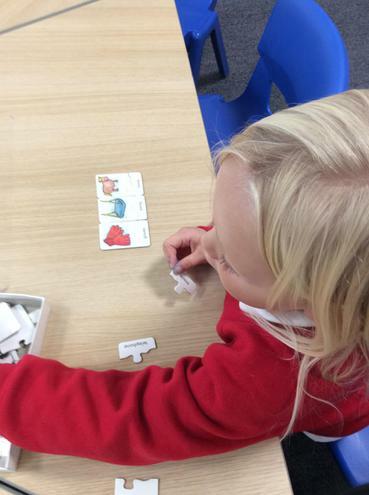 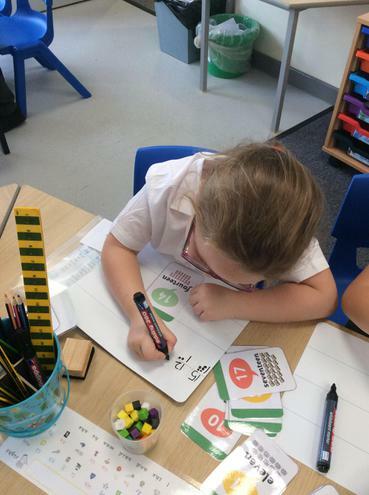 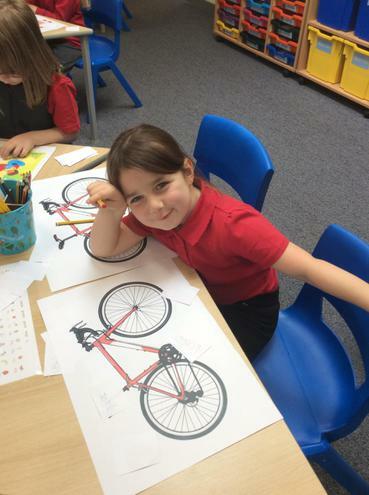 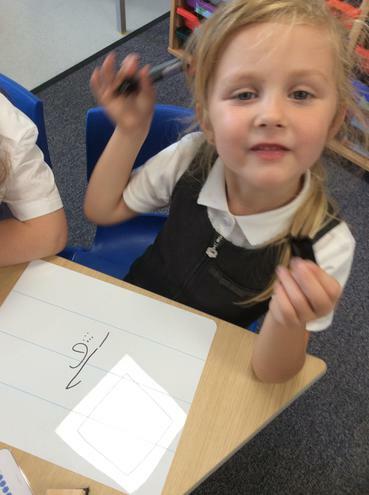 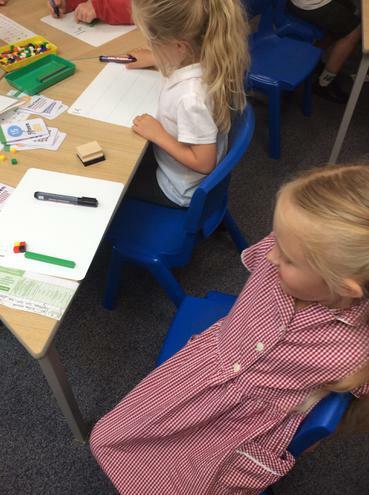 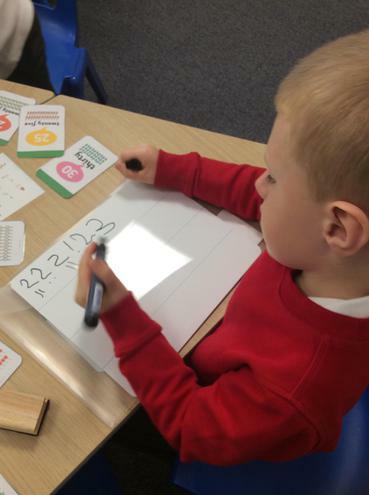 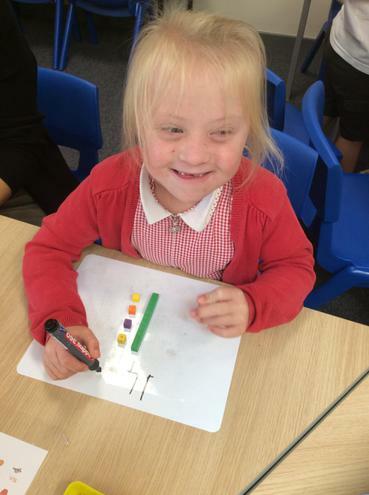 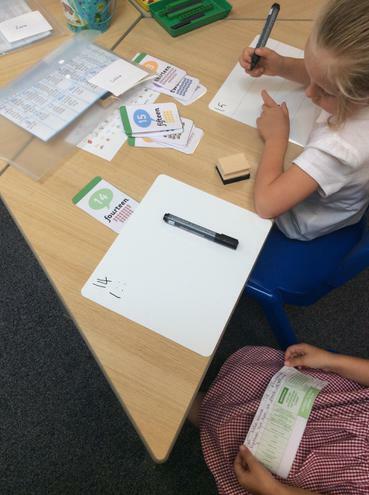 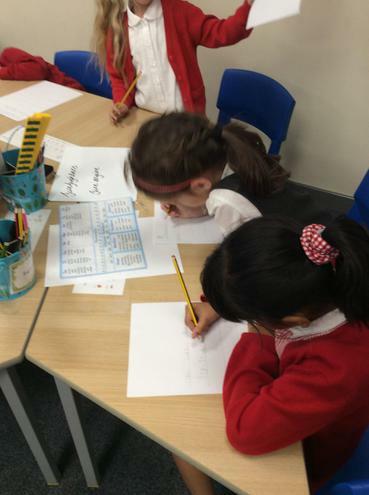 The children will be carrying out a range of activities where they will have to use their perseverance and many maths skills in order to solve some tricky problems. 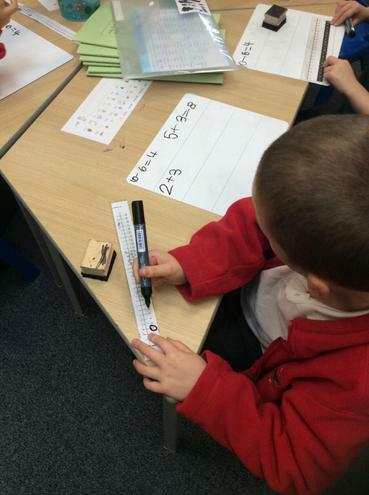 These may be in the form of word problems or sometimes trial and improvement type problems. 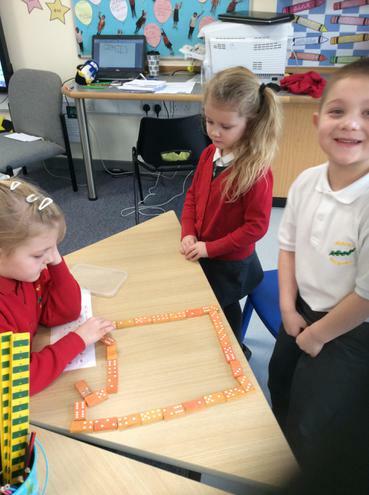 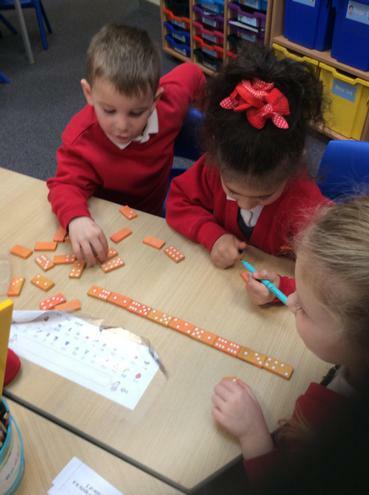 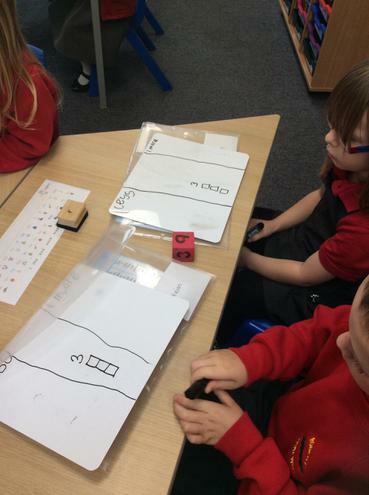 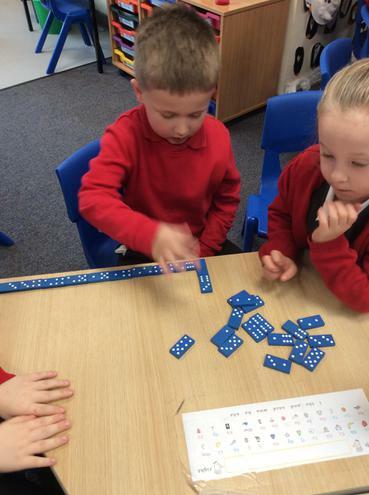 The children did a fabulous job of problem solving this week where they were given a set of dominoes and they had to work as a team to use all of the dominoes but each side of the domino touching needed to add up to 6. 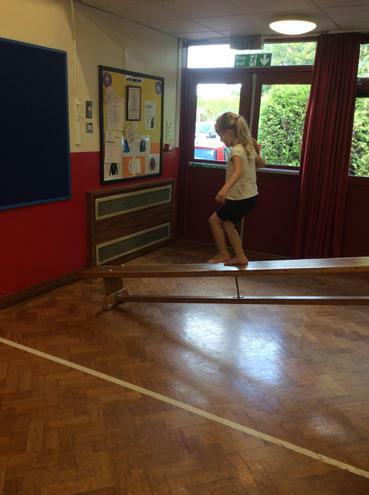 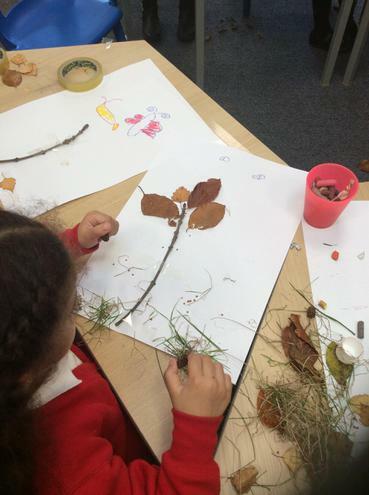 The children had to use a lot of their skills in order to make this work and a lot of trial and improvement. 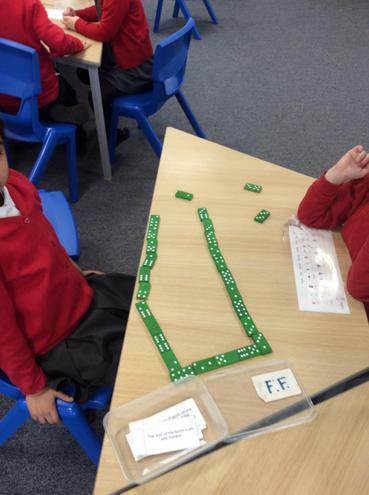 They did a fabulous job and many of the groups were able to complete their circle using all of their dominoes! 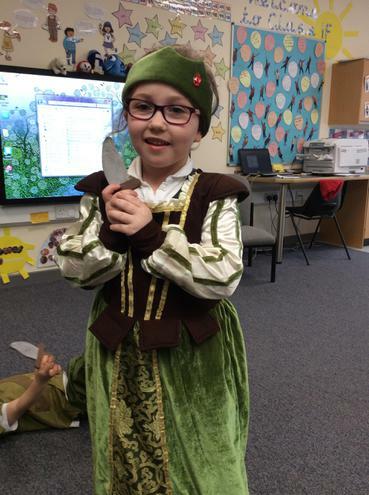 We are very busy stuck back into our new term learning all about Robin Hood! 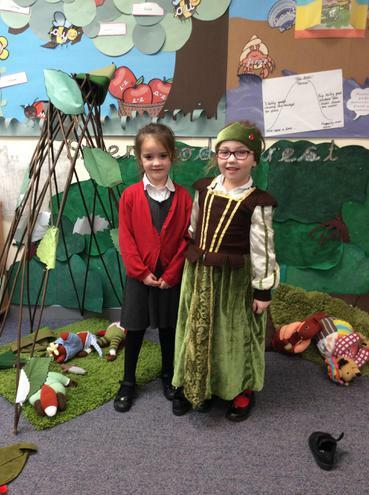 During this term we will have a history focus learning all about folk tales and the story of Robin Hood. 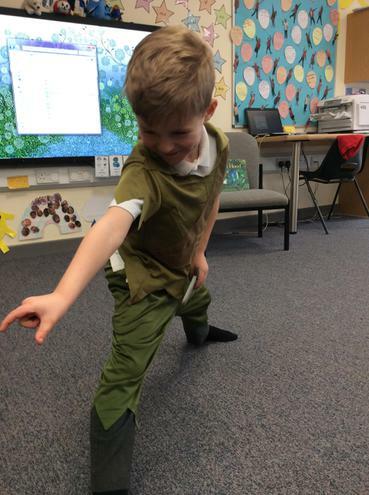 We are very lucky as we have our very own Sherwood Forest in our classroom where we are able to tell our own folk tales and also dress up as the characters from Robin Hood! 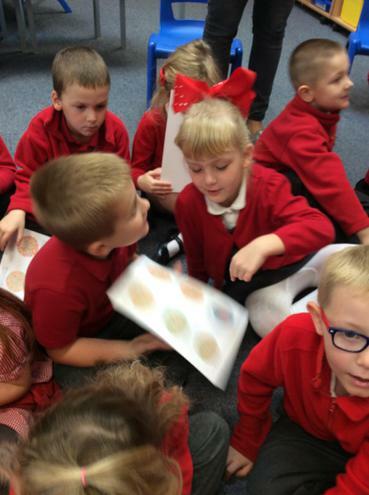 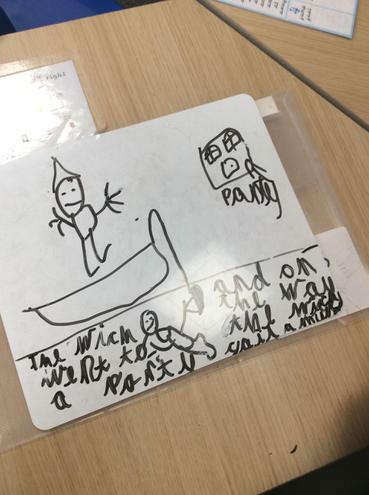 The children have already been working really hard in English learning the story of Robin Hood and writing their own tales, keep looking on the website as in the coming weeks we are going to be learning the story of Little Red Riding Hood and retelling the story with our own little twist! 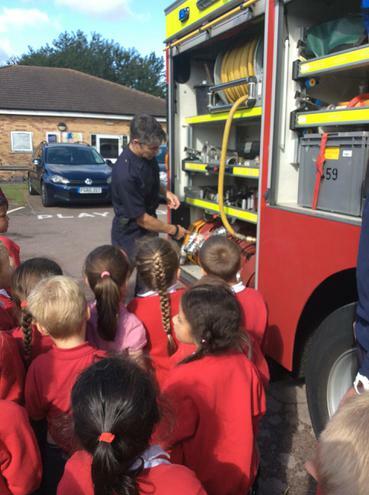 The children are very excited about this! 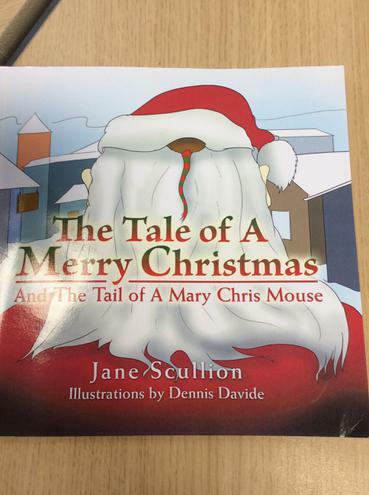 We read a fantastic story today called 'The Tale of A Merry Christmas and The Tale of A Mary Chris Mouse' by Jane Scullion. 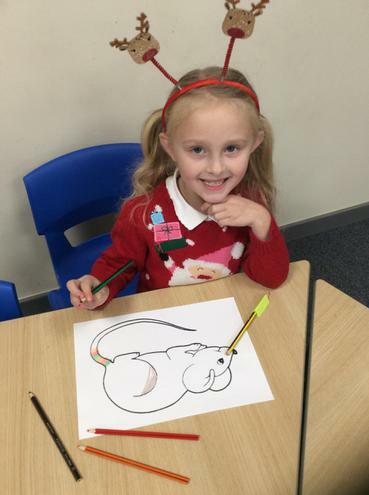 It is a lovely story where Mary Chris Mouse helps a grumpy Father Christmas learn the true meaning of Christmas with her red and green and red and green tail. 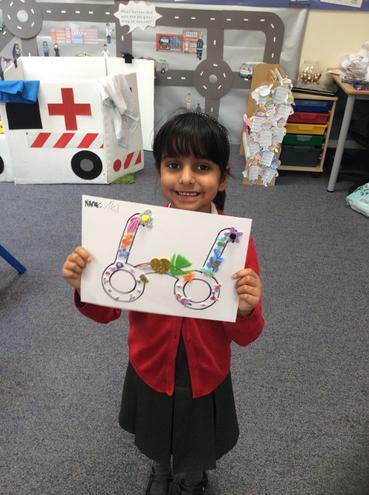 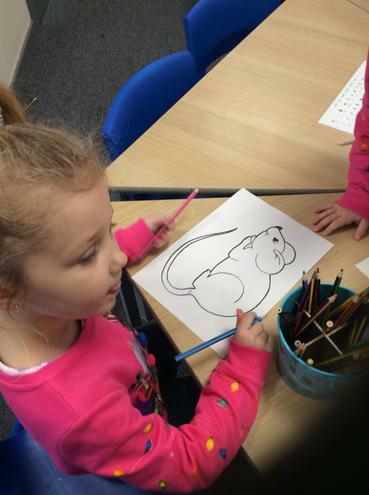 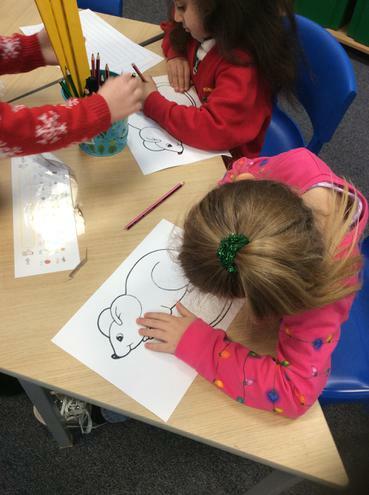 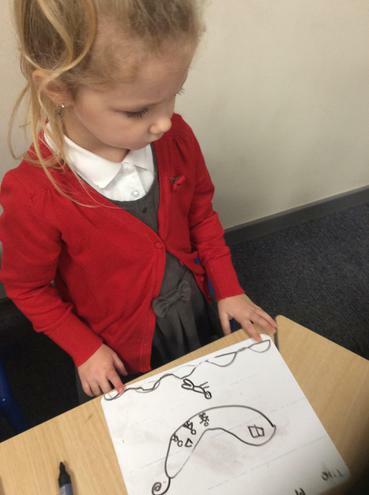 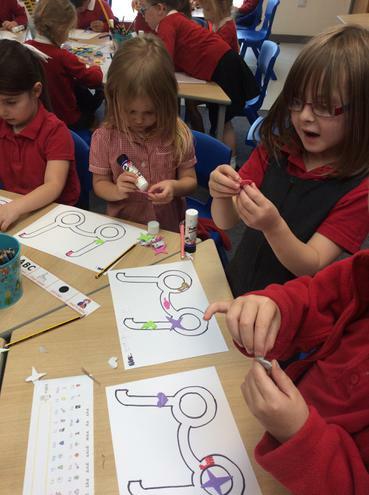 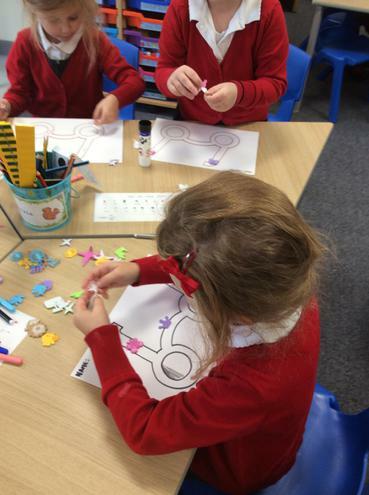 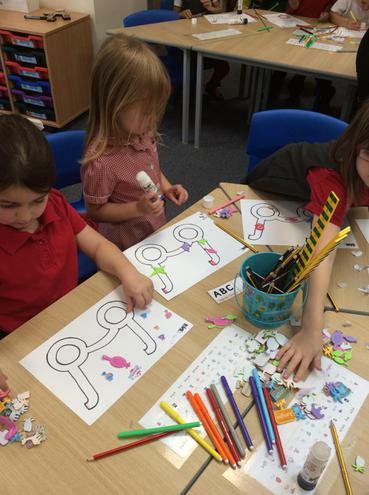 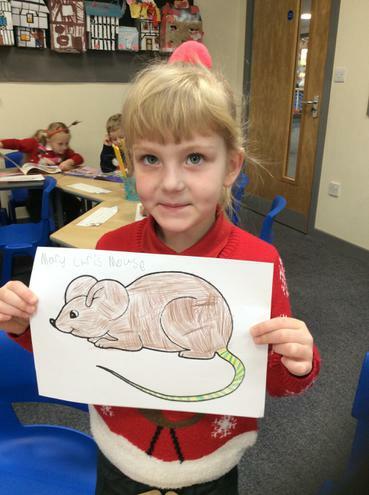 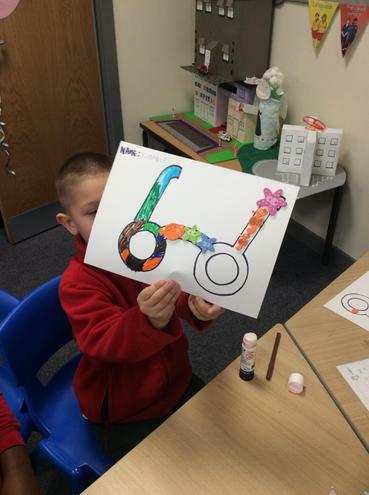 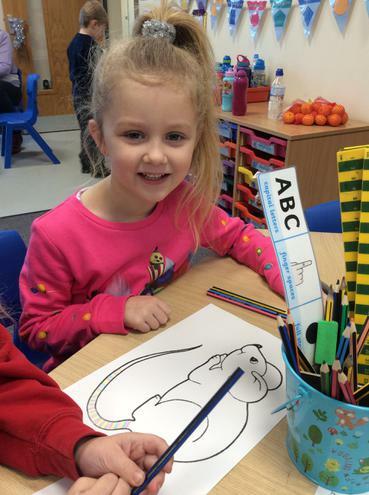 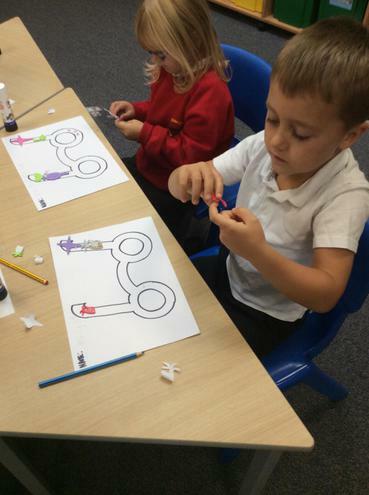 We enjoyed the story so much that we decided to create our own mouse with a repeating pattern for the tail! 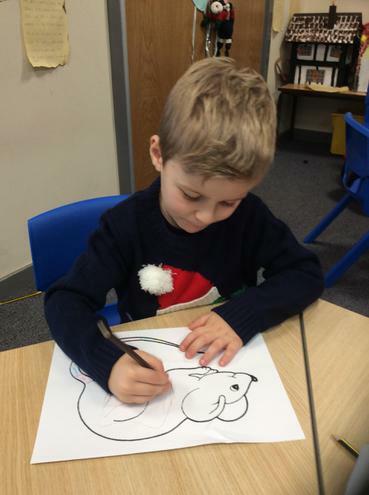 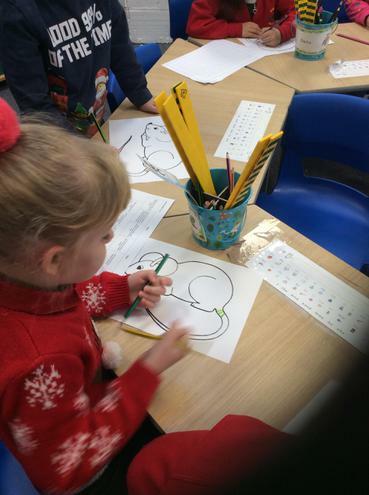 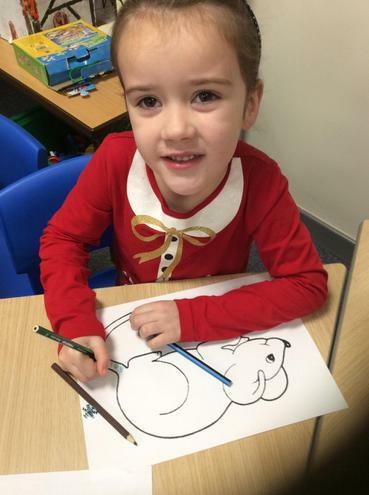 We then went on to write a story about the adventure the mouse goes on with Santa! 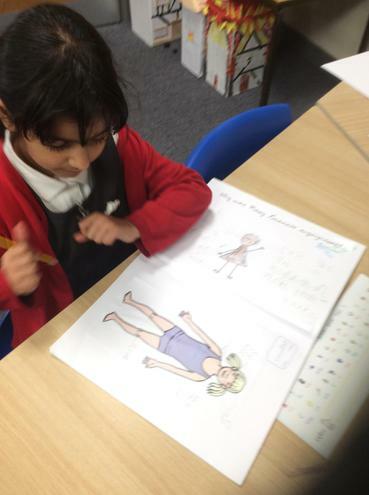 The children's work was absolutely fantastic and we all had so much fun! 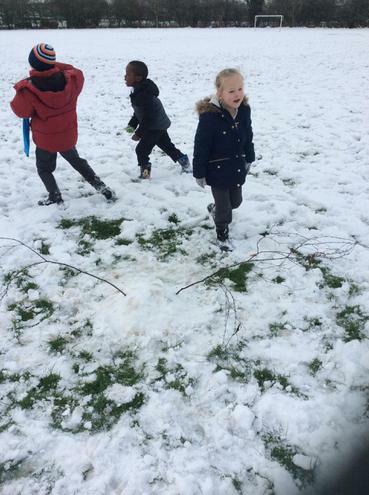 We have had so much fun in the snow the past few days! 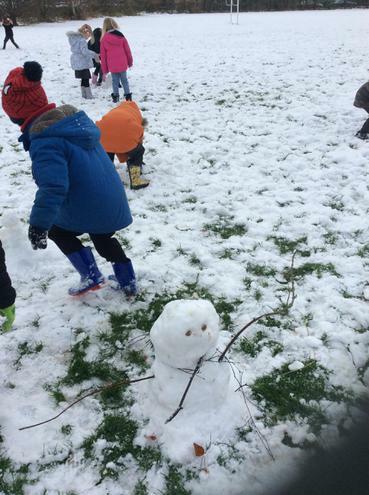 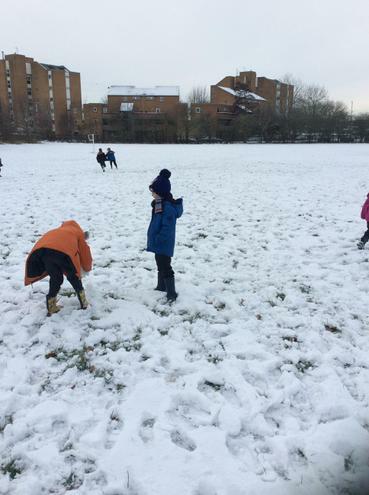 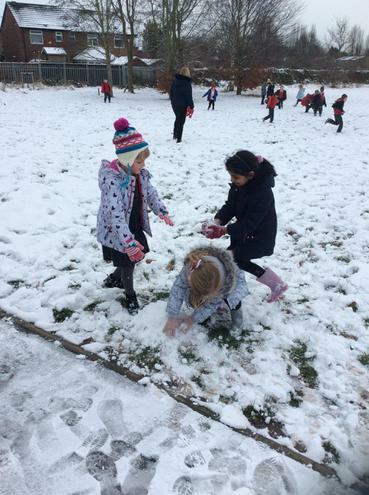 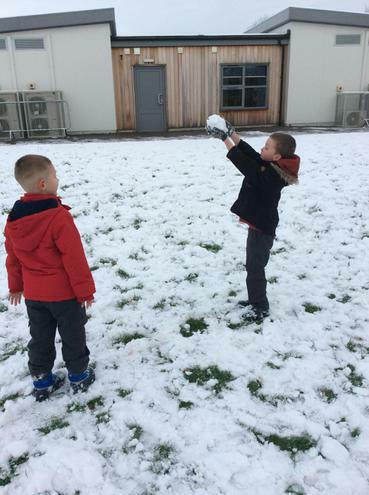 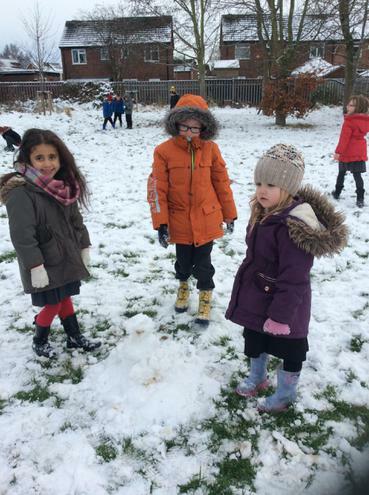 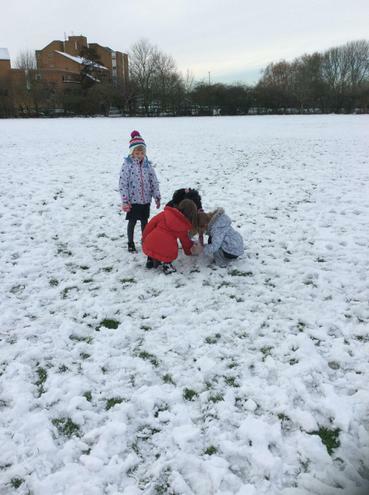 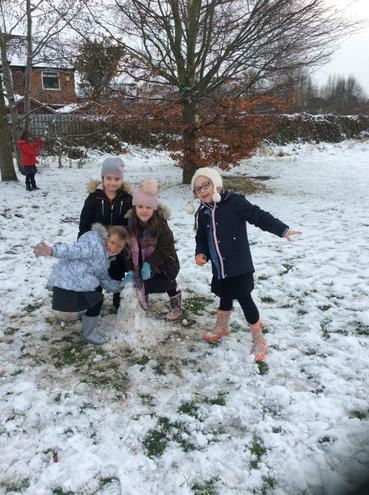 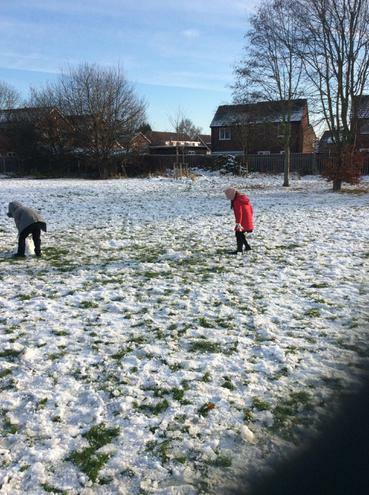 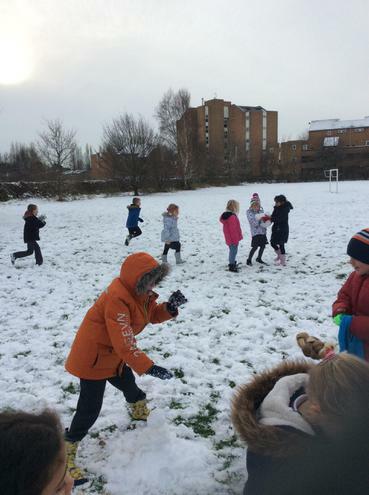 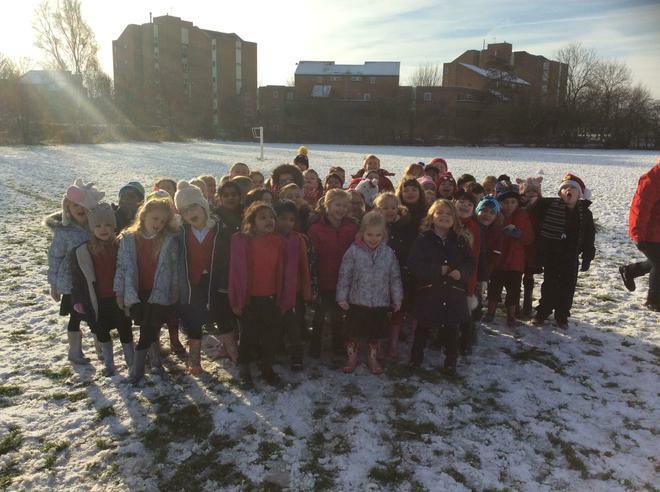 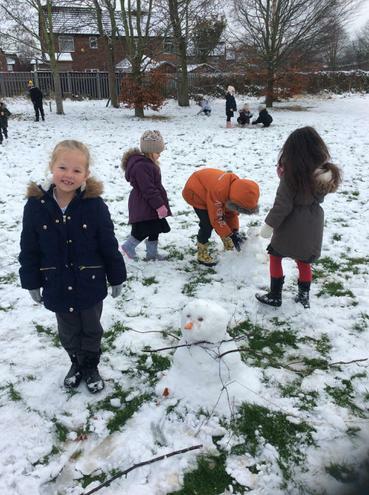 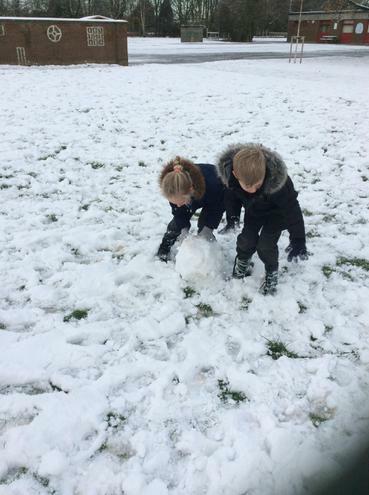 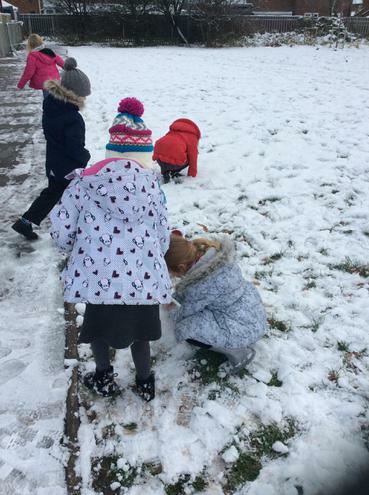 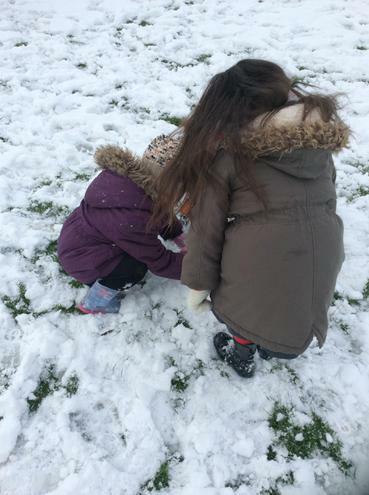 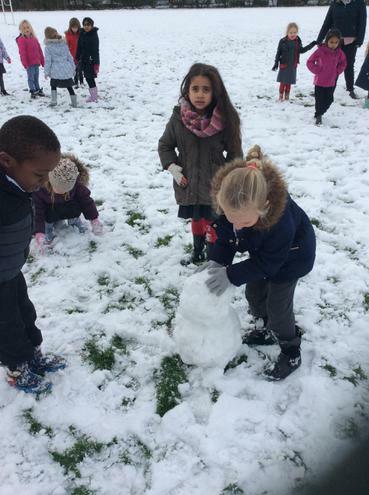 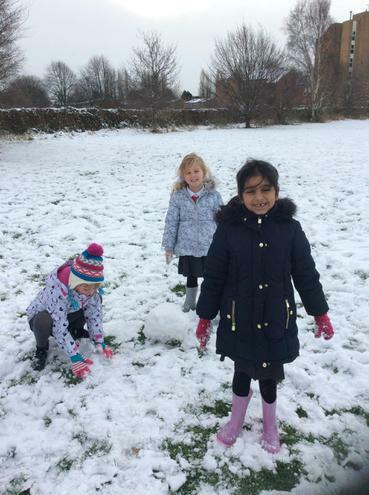 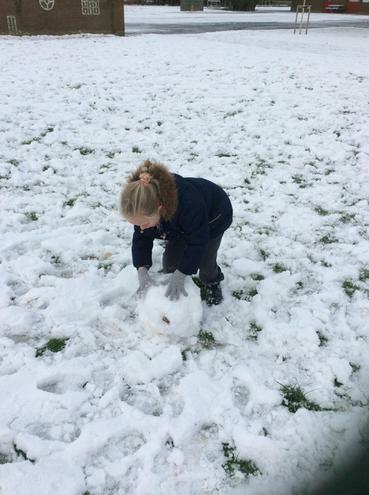 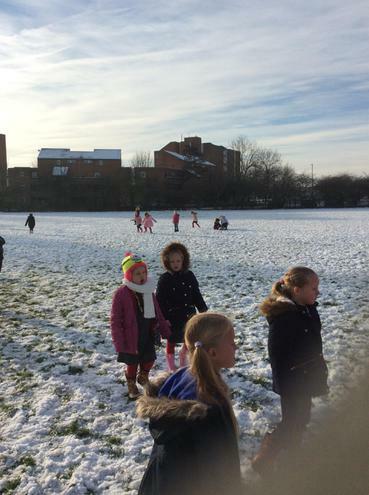 We had a snowman competition, threw snowballs and covered Miss Fielder in snow! 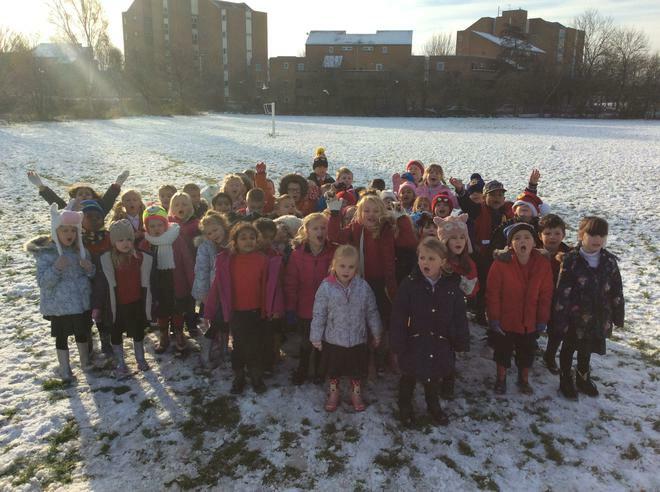 Have a look at all the fun we've had! 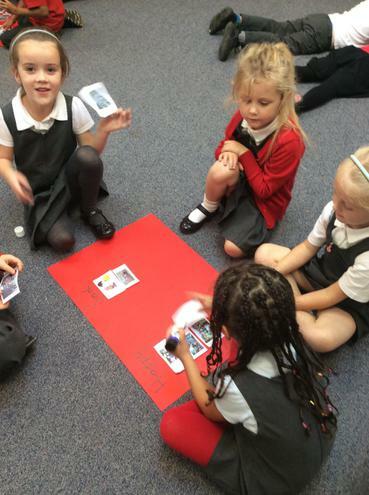 We had a brilliant afternoon learning more about the Great Fire of London and played a super online game. 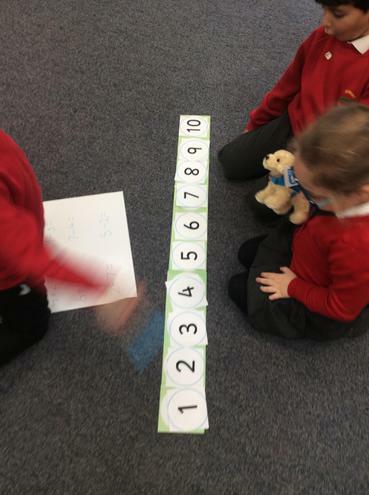 I will link the game below as a lot of the children were asking about it as they had so much fun with it this afternoon. 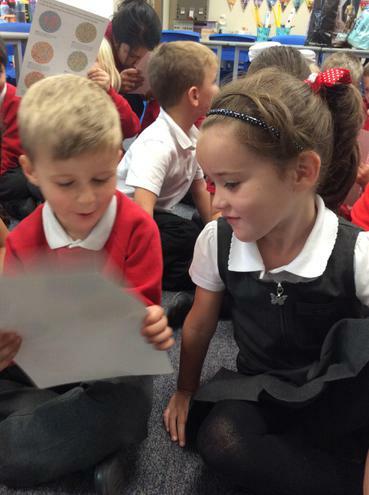 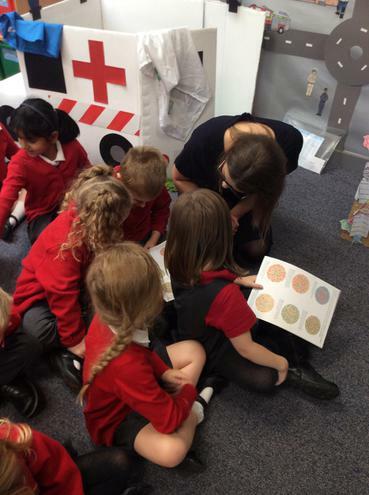 It reads through the story and asks the children questions about the history of the Great Fire. 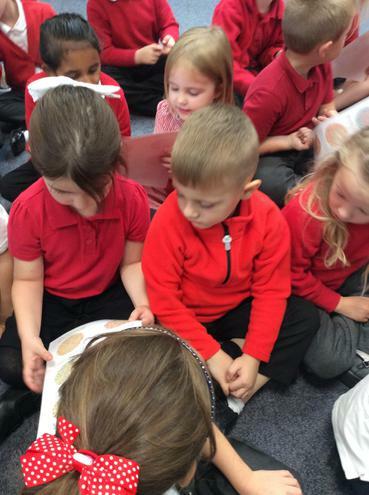 Remember to turn the sound on so you can hear the story being read to you! 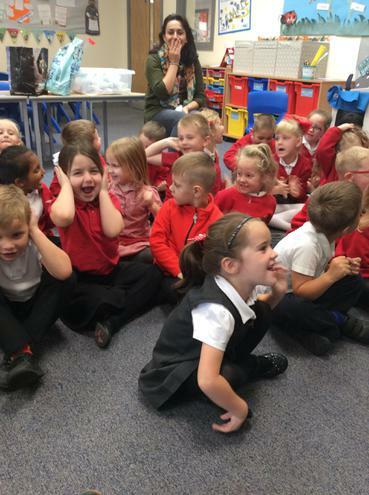 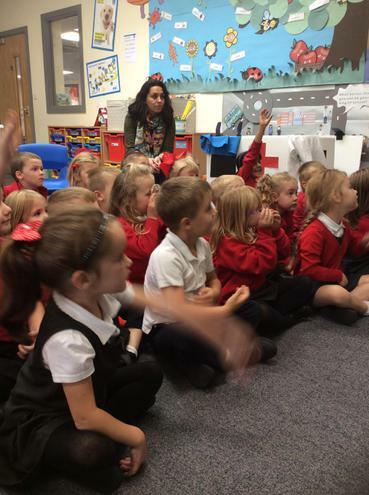 Thank you all that attended our recent phonics meeting, it was lovely to see so many of you there! 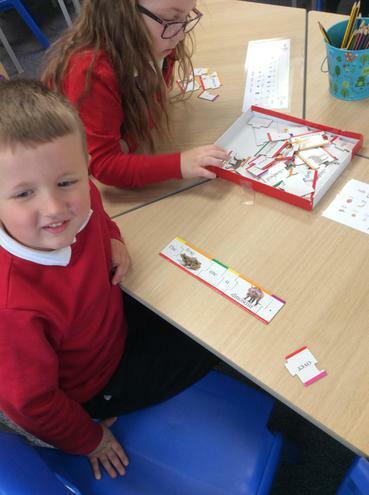 As promised, I will link you to the websites with games and activities you can play with your children at home. 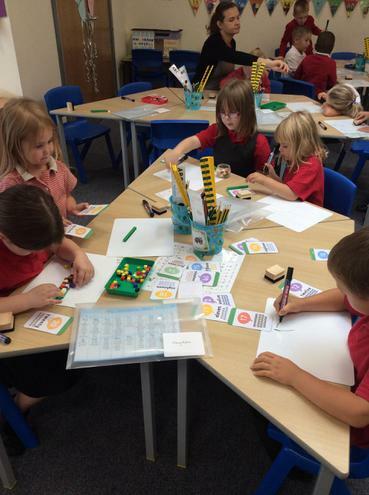 I will also make a link in another post to maths online games and activities. 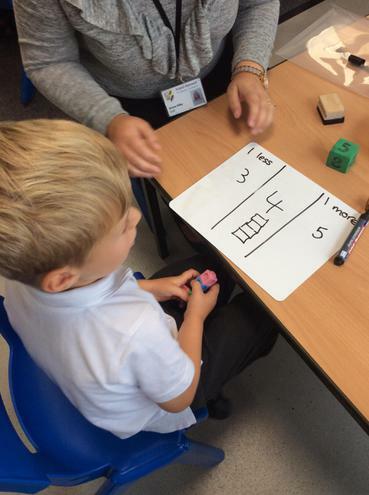 If you would like any other resources to support your children with phonics, reading, writing or maths please do come in and I will be happy to provide you with this. 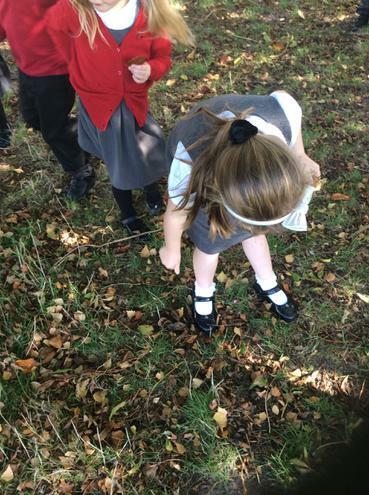 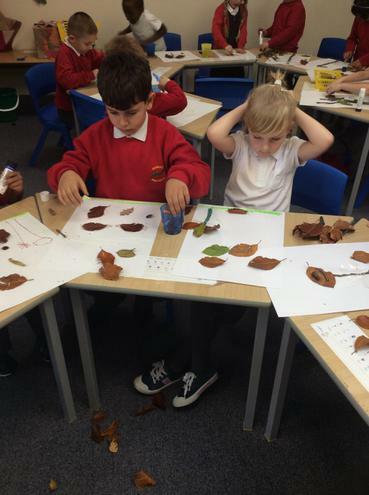 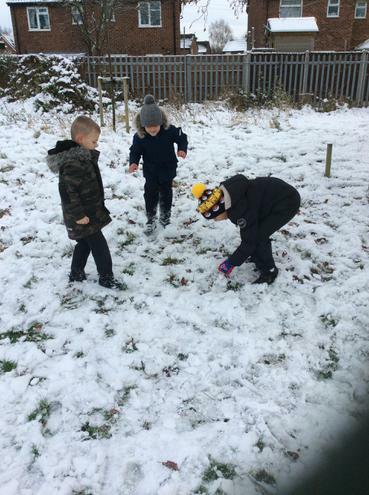 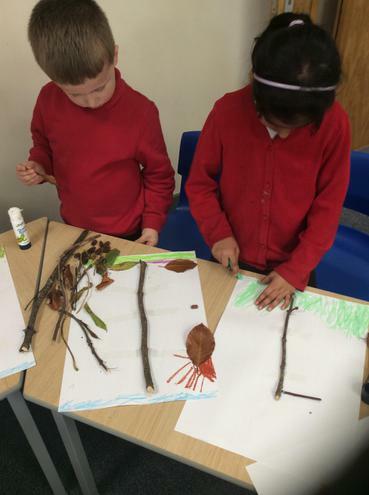 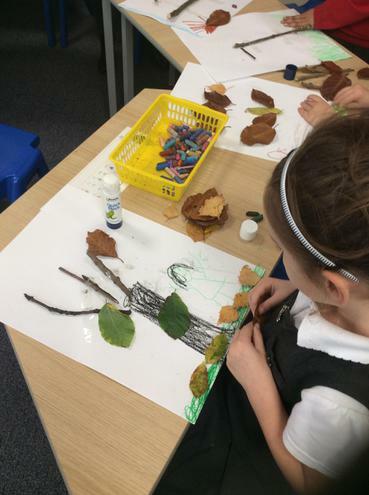 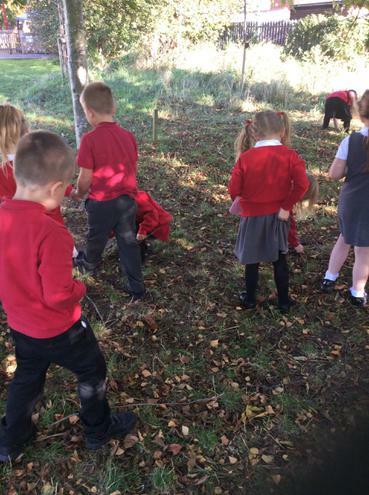 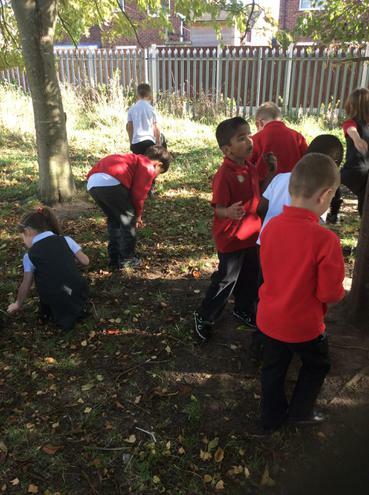 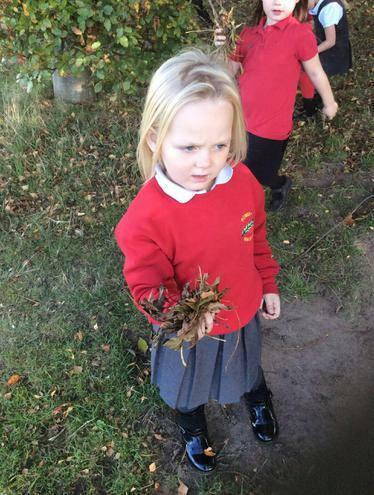 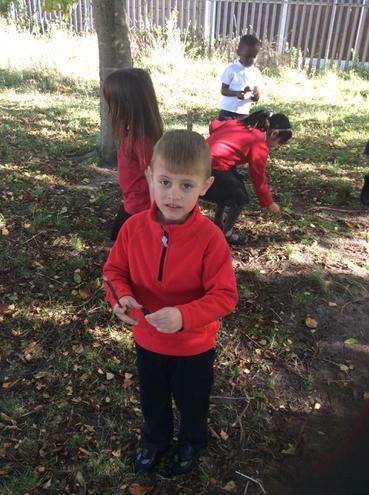 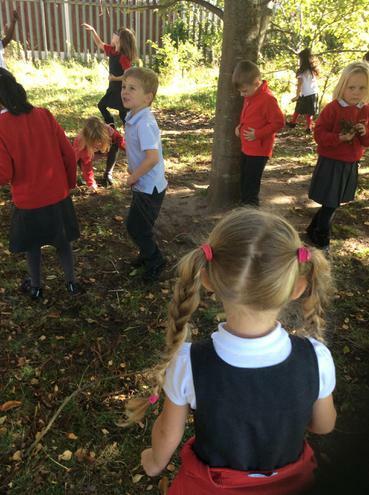 In art this week we took advantage of the changing Autumn weather by going outside to explore the field to find fallen leaves and twigs that we could use to create out own Autumn picture. 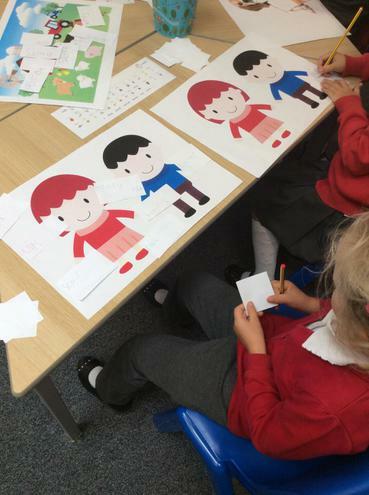 Have a look at the pictures of us creating them, we had so much fun! 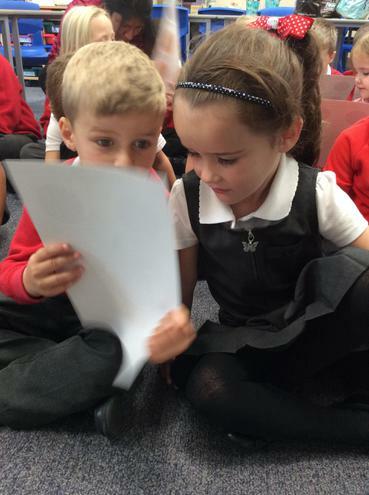 Our focus in guided reading this term is predicting. 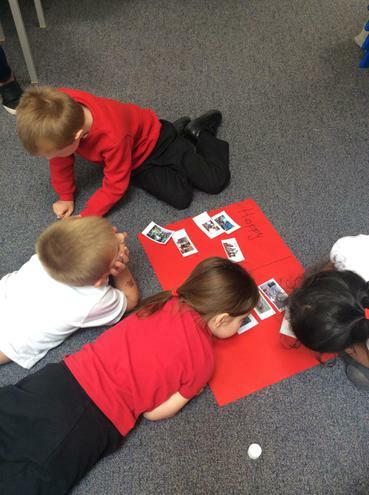 The children are looking at pictures and reading stories to decide what they think might happen next. 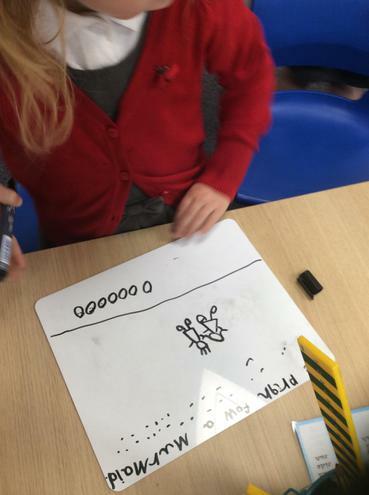 The children are absolutely fantastic at gathering ideas from what is happening in the picture to determine what will happen next. 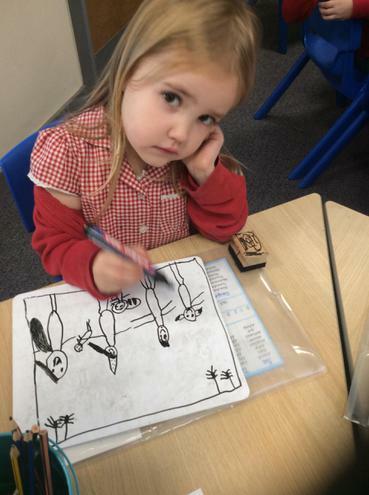 When reading with your children at home, once they finish their story they could draw pictures or write sentences to predict what they think will happen next! 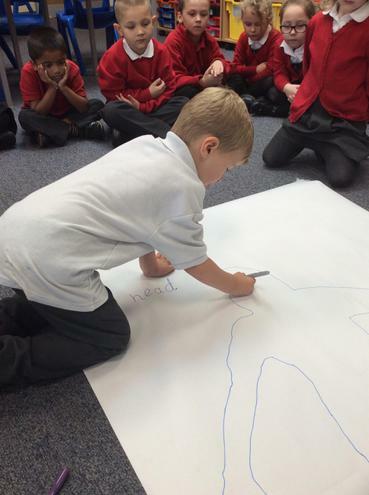 In science this week we have had lots of fun writing labels to match with the different parts of the body. 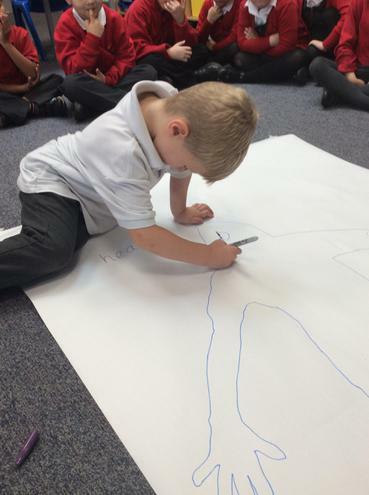 The children were absolutely fantastic at this and it was very exciting drawing around ourselves ready to add labels. 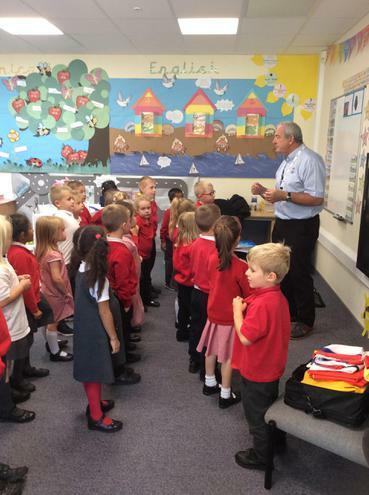 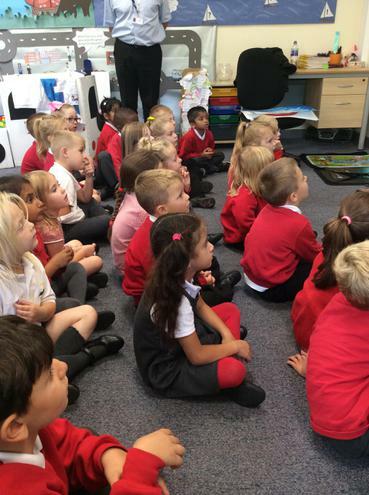 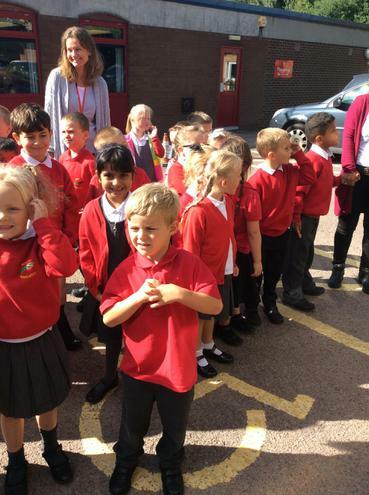 Welcome back to Year 1! 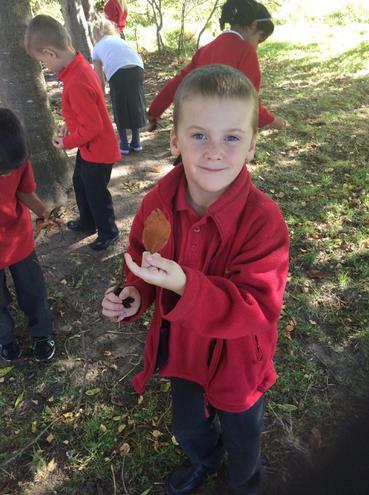 I hope you have all had a very relaxed and exciting October break. 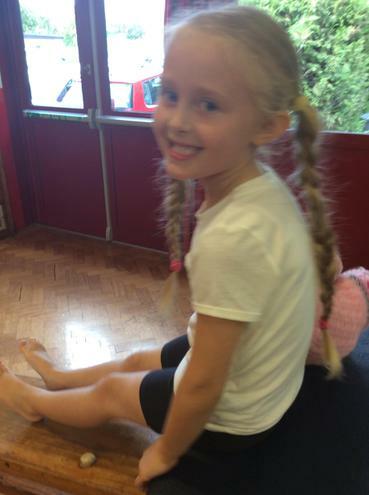 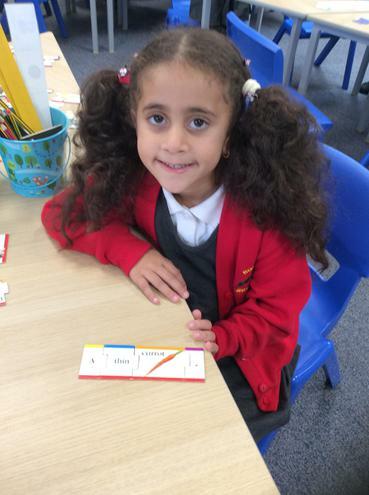 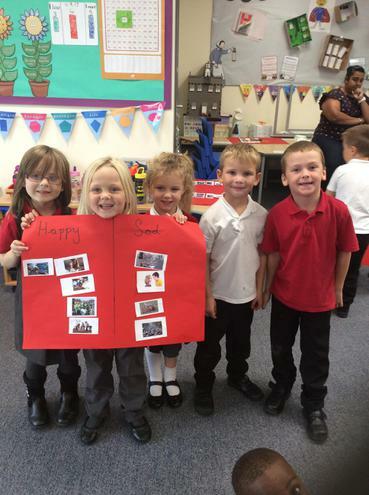 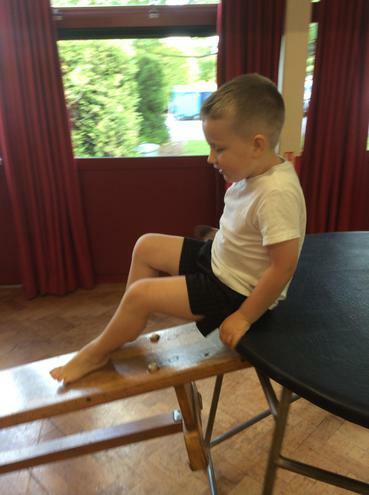 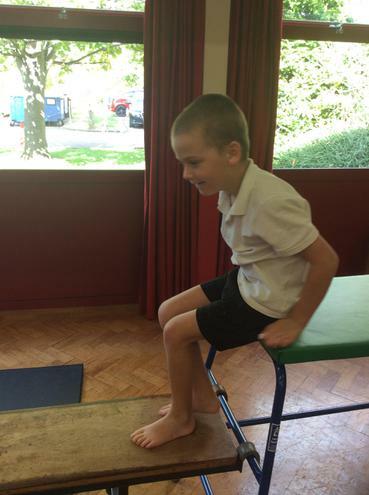 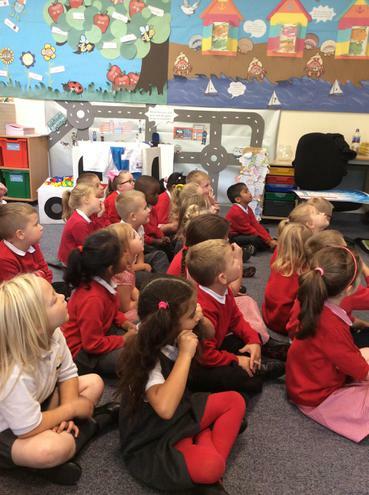 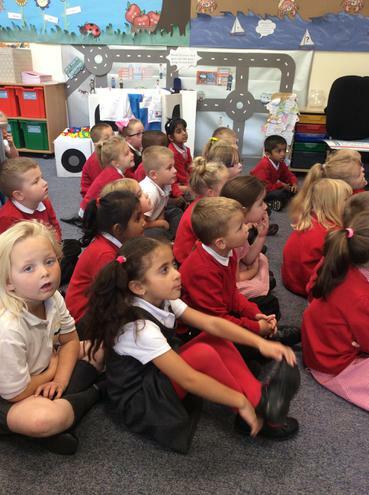 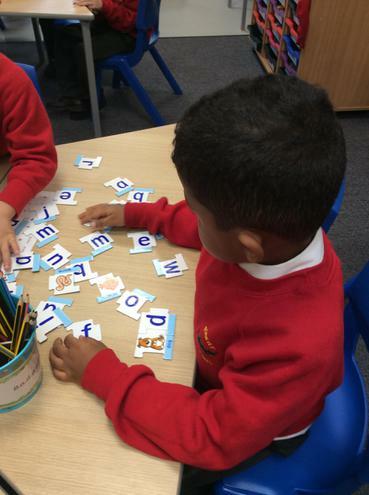 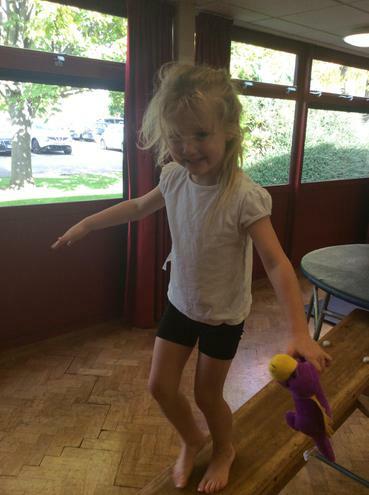 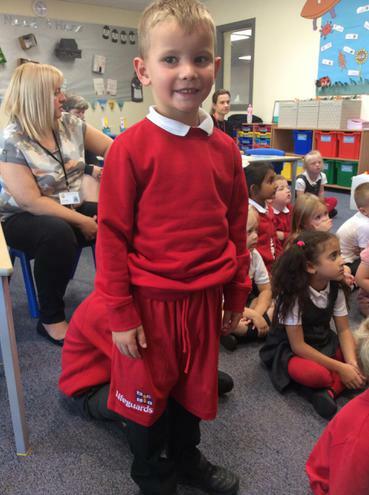 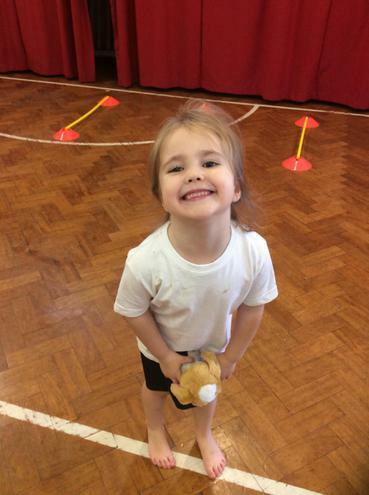 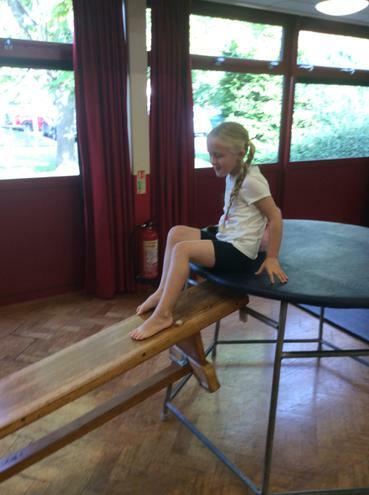 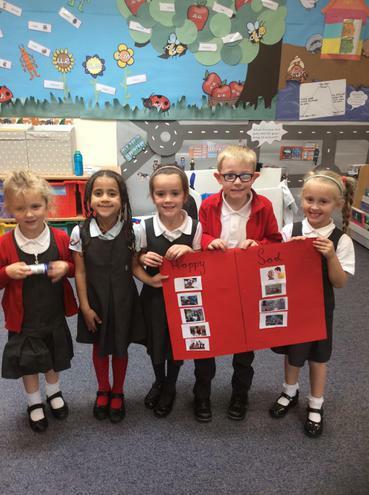 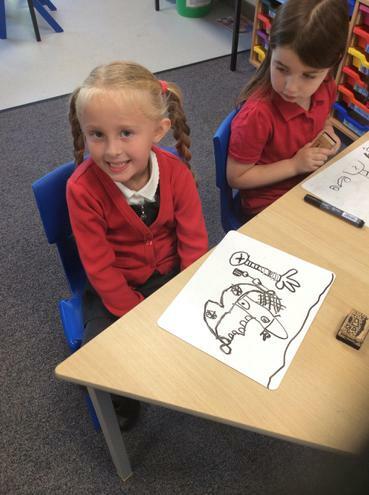 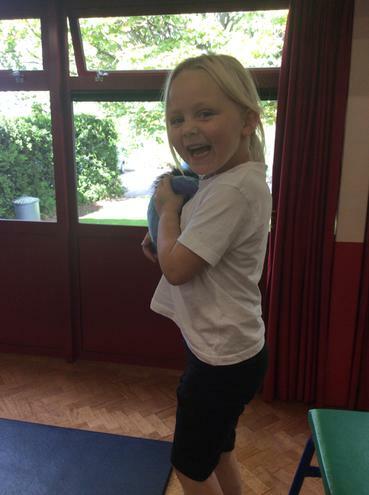 The children have all settled back into learning extremely well and we have had such a busy first week back! 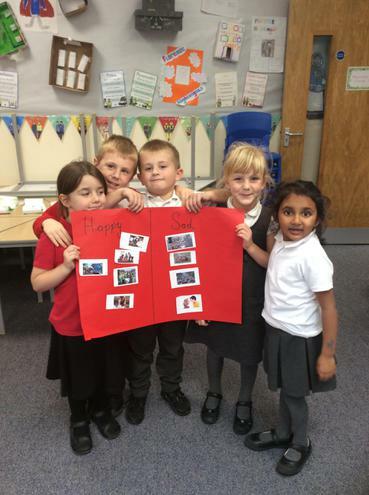 Our topic for this term is called 'Light it Up' and will have a history focus on the Great Fire of London. 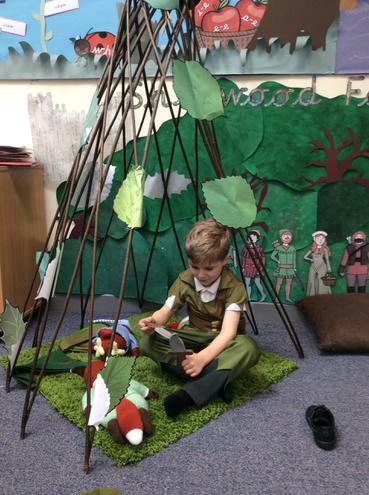 A big thank you to all the children that completed their homework project to build a house from 1666, they look absolutely fantastic on our display! 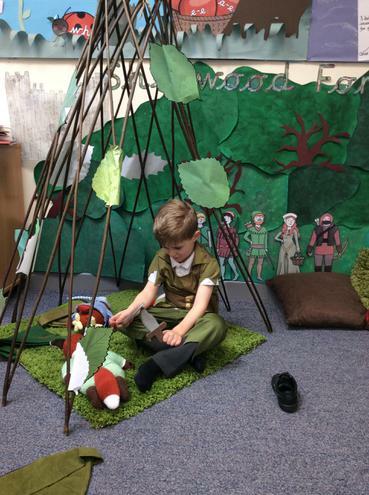 As you have probably seen, we also have our very own house in the classroom from 1666, this is a nice and relaxing space where the children can read stories and also create and tell their own stories about the Great Fire of London. 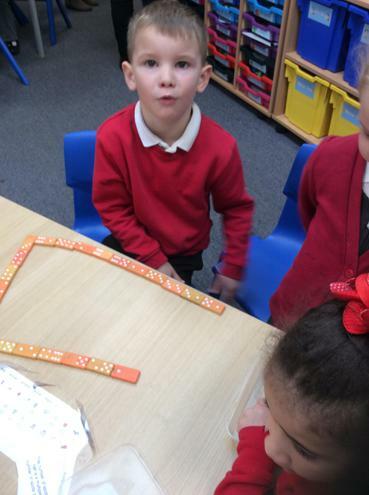 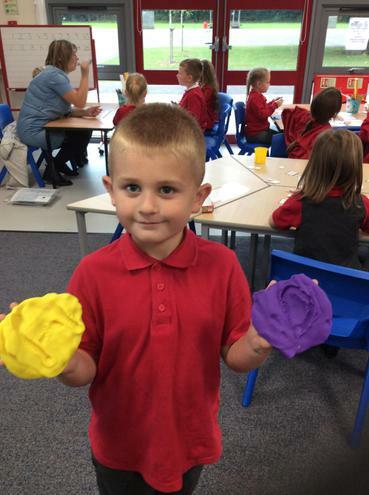 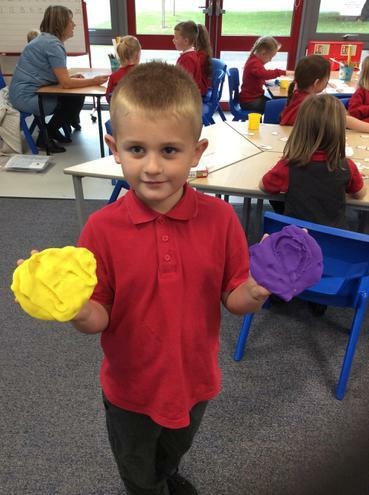 In maths this term we are going to be learning all about shape, measurement, money and time. 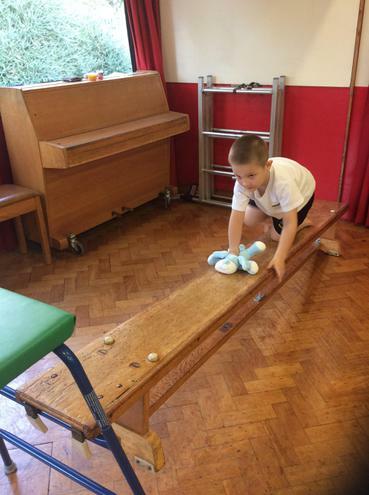 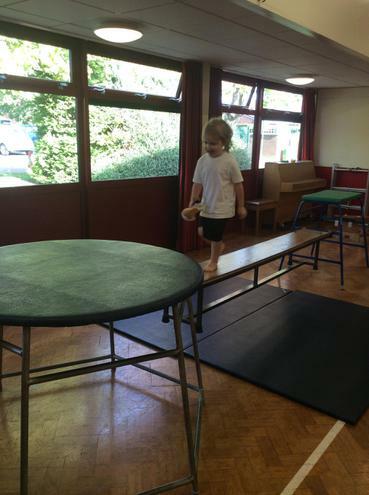 The children will be carrying out a range of practical activities to develop their skills in these areas. 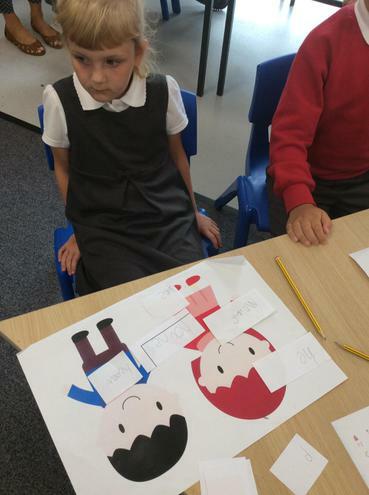 The children have already been very busy exploring symmetry and shapes, we have been painting pictures and folding them in half to show symmetry and also using a mirror to create symmetrical patterns. 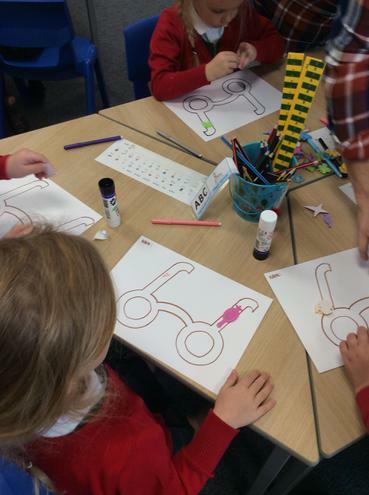 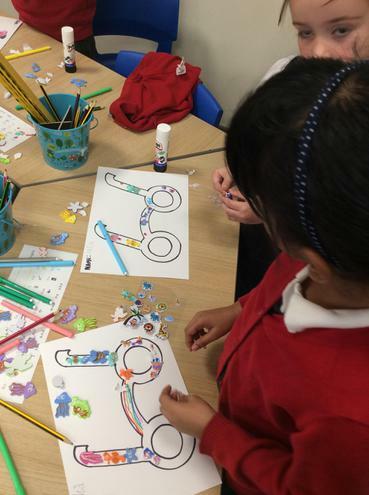 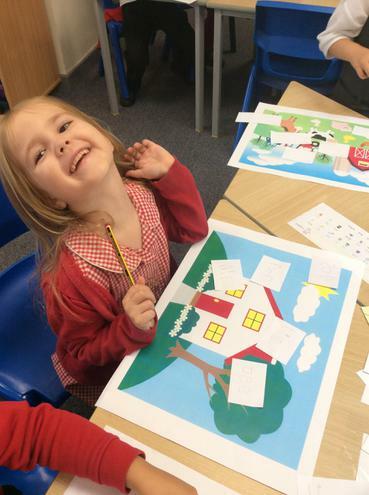 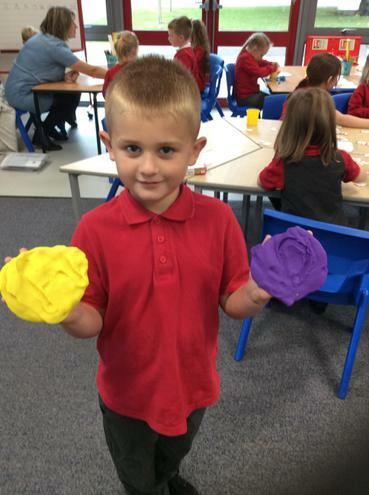 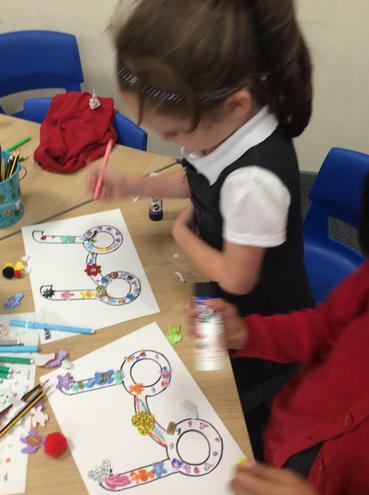 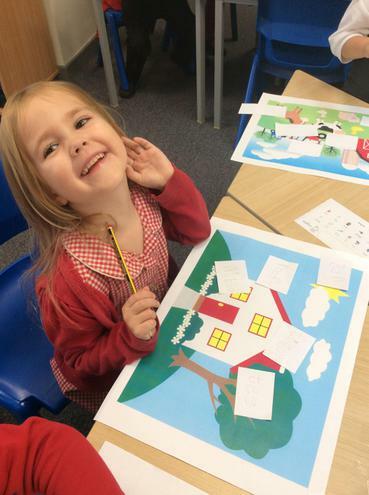 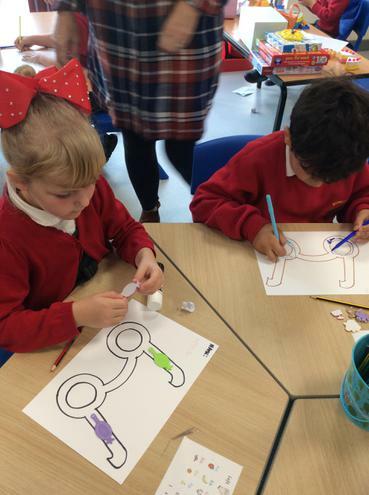 The children also had lots of fun creating their own shape pictures, we had some extremely creative ideas and definitely have some budding artists in class 1F! 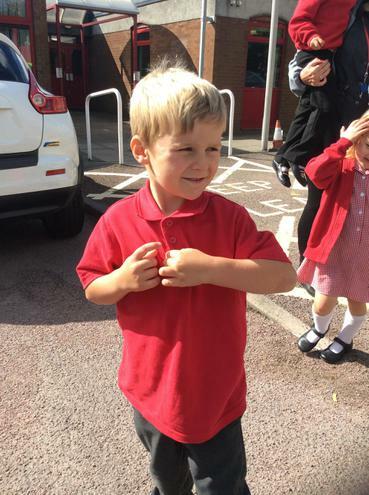 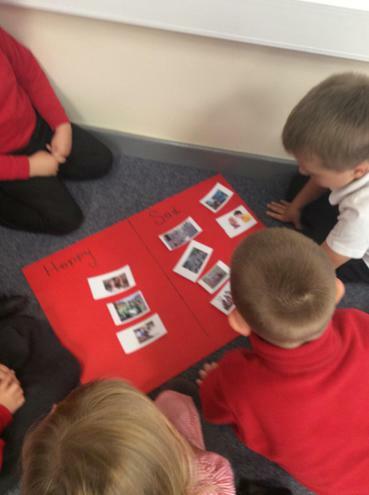 You can support your children at home by looking at objects when you are out and about and discussing what shape they are and the properties that they have. 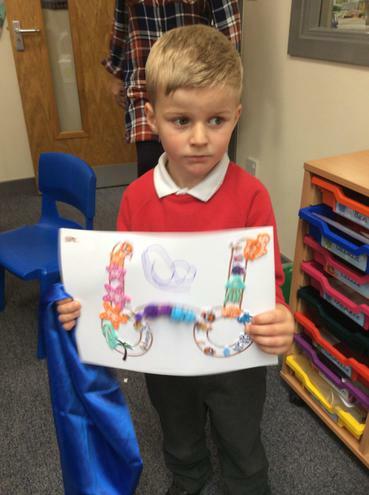 You can also support your children by paying for items when they go to the shop and getting them to recognise coins you have. 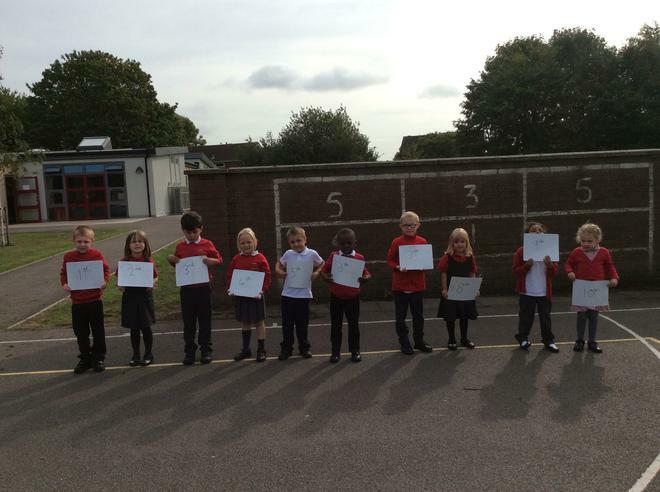 The children will also be learning to tell the time to the hour and half past the hour. 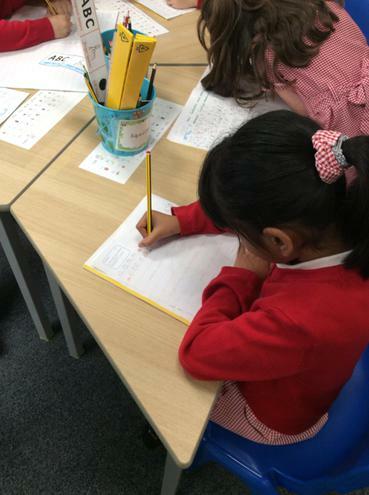 In English this term, we have a fantastic cross-curricular link to history where we will be learning how to write a diary in preparation to travel back in time to be Samuel Pepys and write about the events of the Great Fire of London. 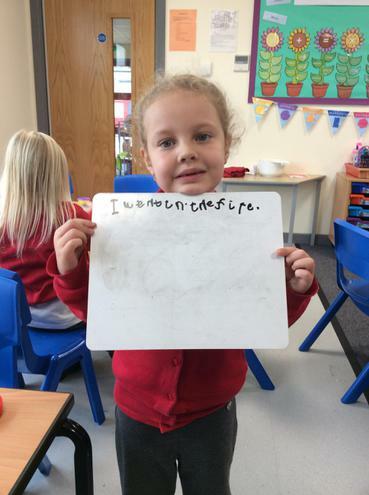 We will still have a strong focus on the importance of using capital letters, full stops and finger spaces in all of their writing and the importance of reading their sentence again to check it makes sense. 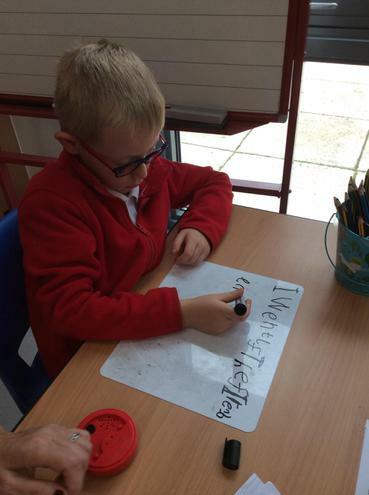 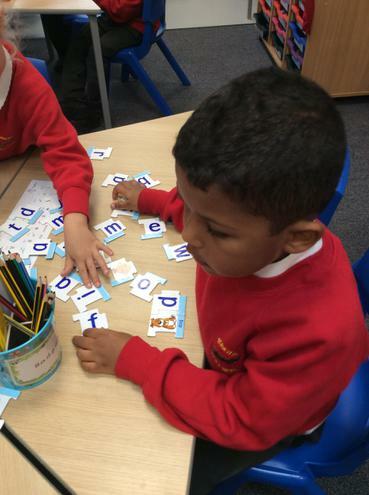 Year 1 are also becoming fantastic at making their sentences even more interesting by including verbs and adjectives, some of us are even using adverbs! 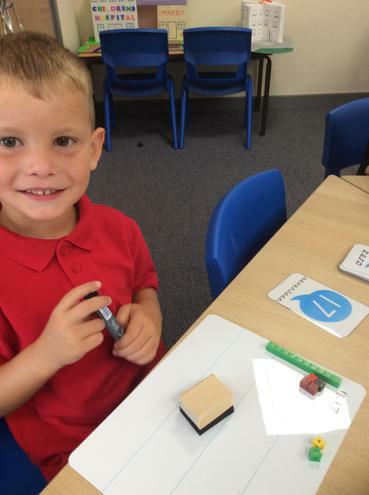 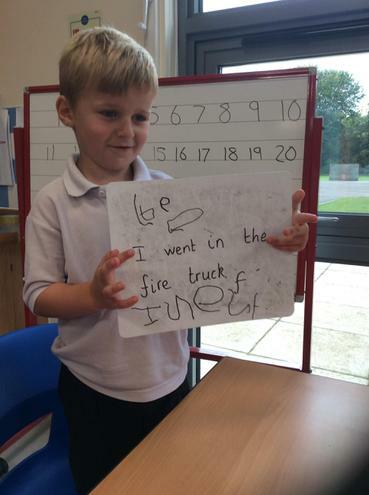 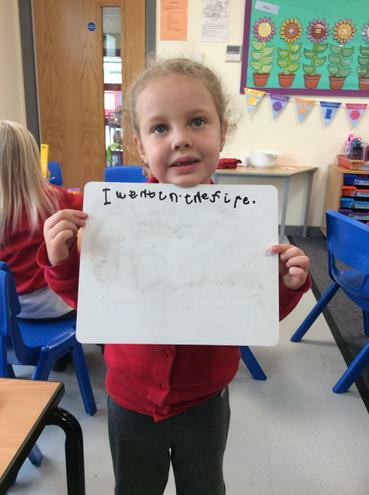 You can support your children at home by writing simple sentences so they can show off all the skills they have learnt. 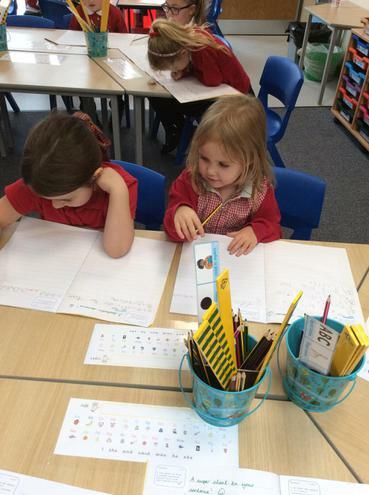 Maybe they could write all about what they have been learning at school and the fun activities they have been up to? 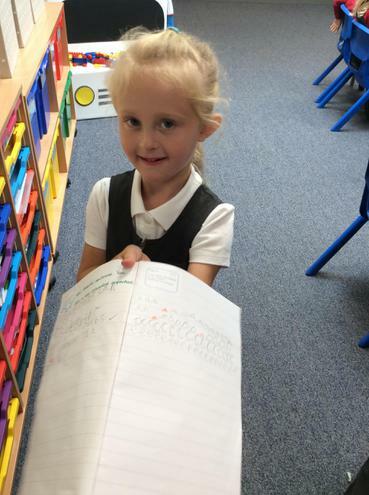 This will help them when it comes to writing up their diaries! 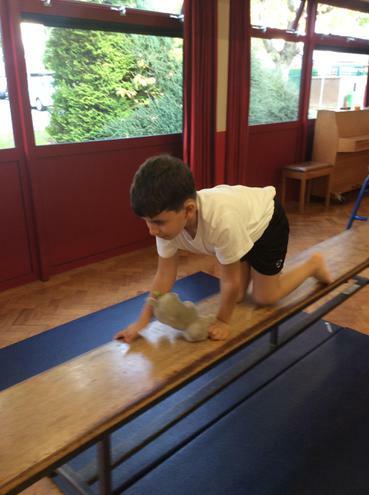 During our topic work we will be carrying out a range of fun and practical activities! 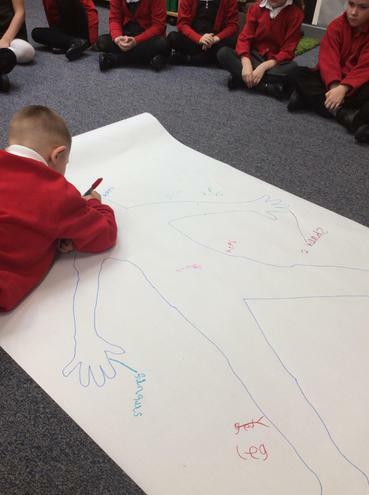 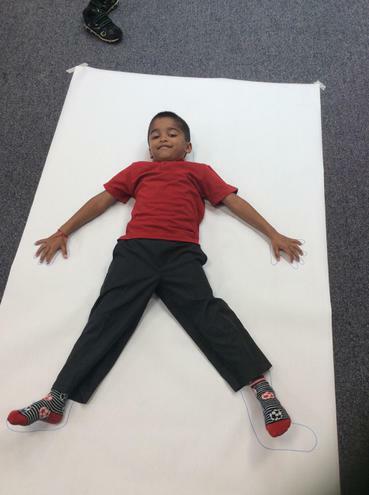 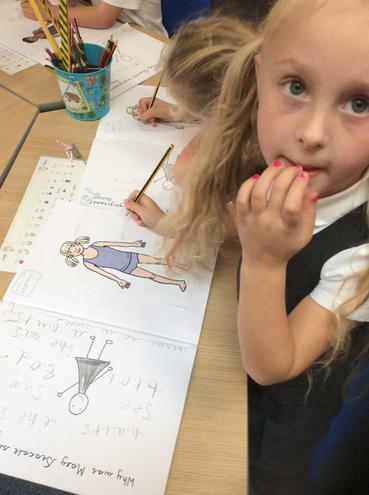 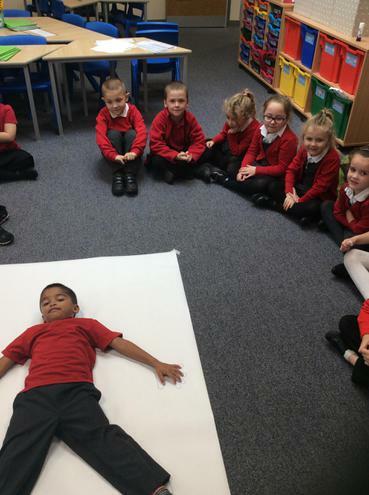 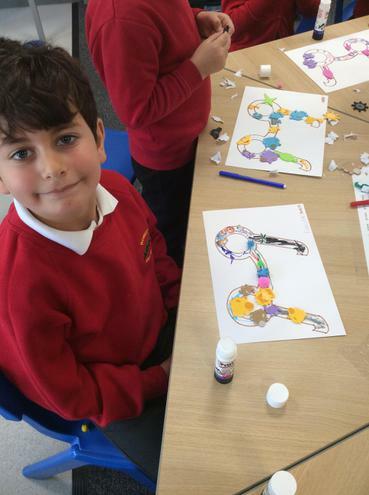 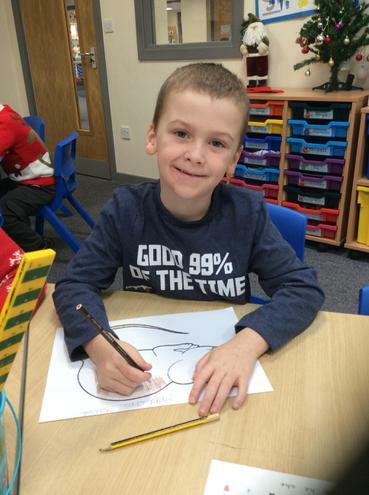 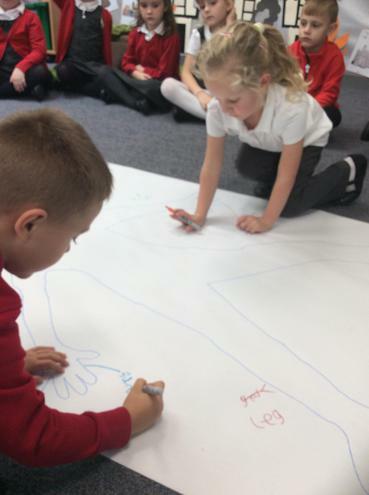 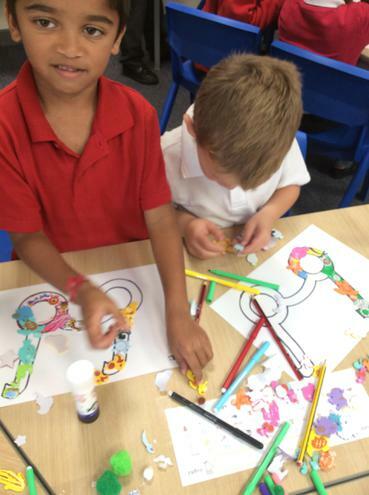 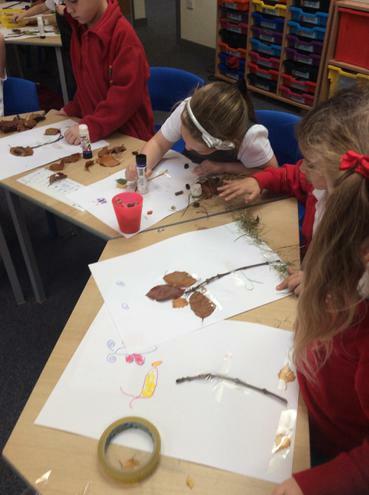 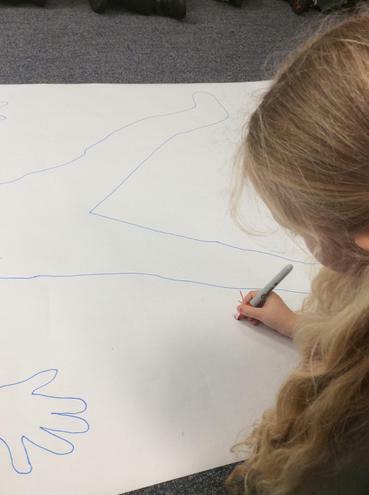 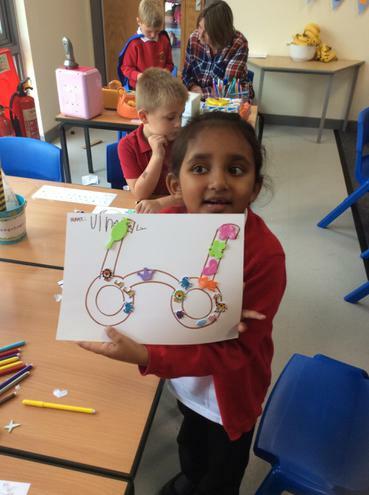 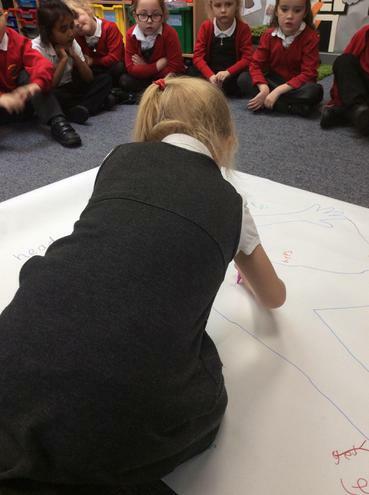 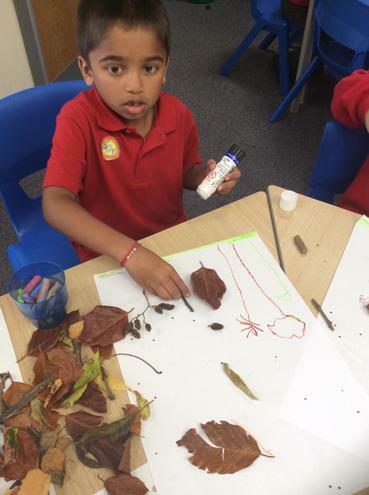 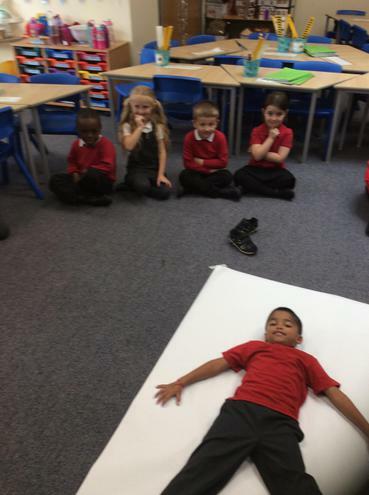 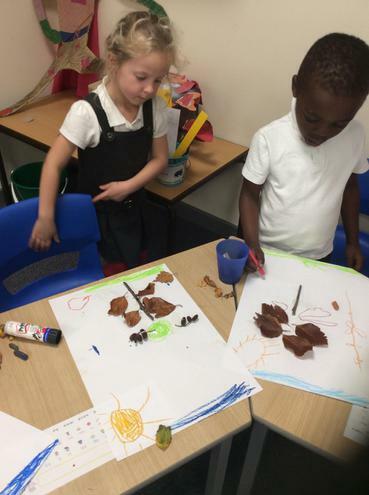 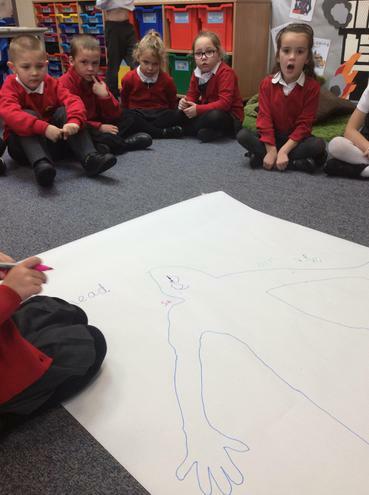 In science we are learning all about humans and animals and have already had lots of fun labelling the parts of the body by drawing around ourselves, the children have also been on an Autumn walk to explore the five senses. 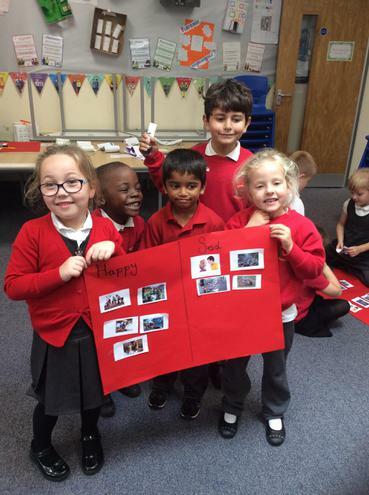 In art we will be using a range of media to build up a collage of the Great Fire of London. 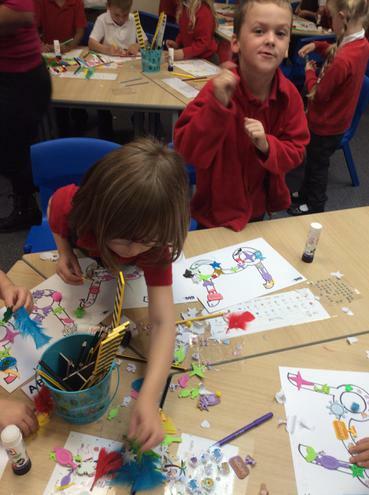 Keep checking this page to see all of the other activities we get up to! 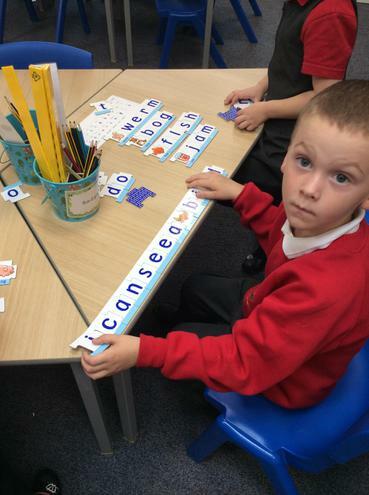 Please keep reading lots with your children at home, I have seen a huge improvement in the children's reading and phonics and this is really helping to support with their writing and spelling. 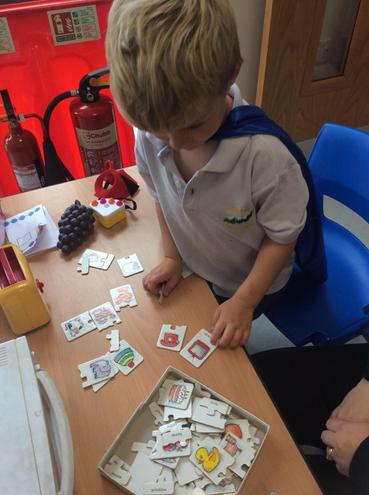 We have already had some children fill in their superhero reading charts and earn a reward, let's see if lot's more of us can as well! 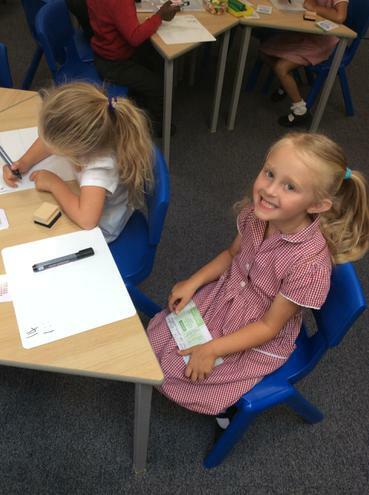 If you have any questions please pop in for an informal chat after school! 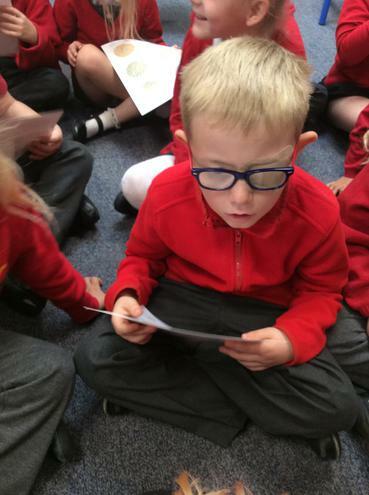 I would like to start with a HUGE thank you for all of your thoughtful donations and sponsors for our Guide Dog fundraising. 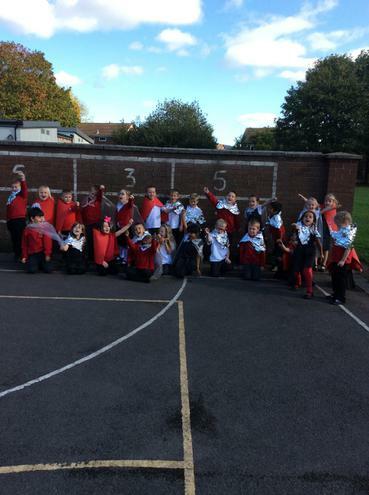 I am so proud of every single child for their hard work and determination to raise money to support Guide Dogs and blind people. 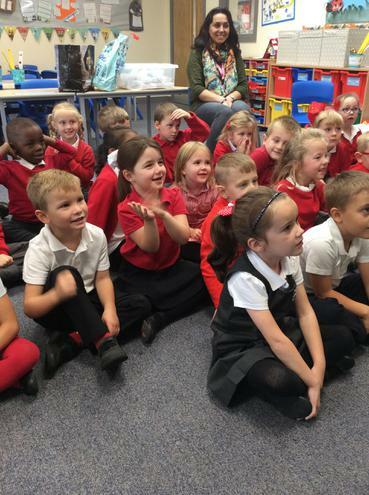 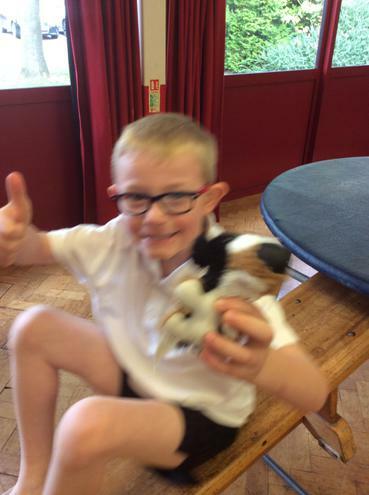 All of the children loved the visit from the dogs at the beginning of the term and we decided then that we would sponsor a Guide Dog as a class called Bolt. 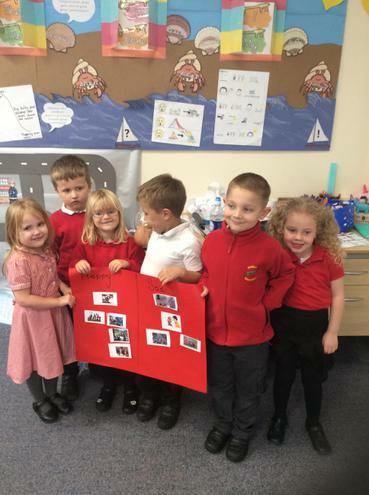 We then learnt about Guide Dogs further and decided as a class that we would like to help by raising money for the charity. 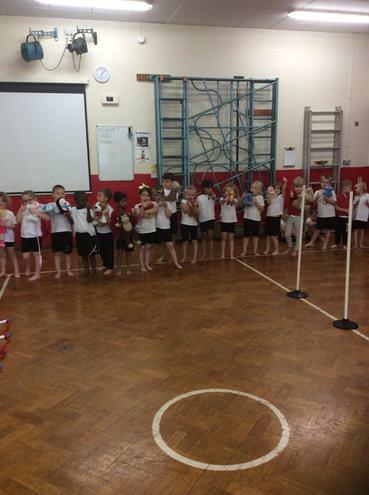 The children thoroughly enjoyed baking cakes and biscuits all day to sell at the cake sale on Wednesday after school. 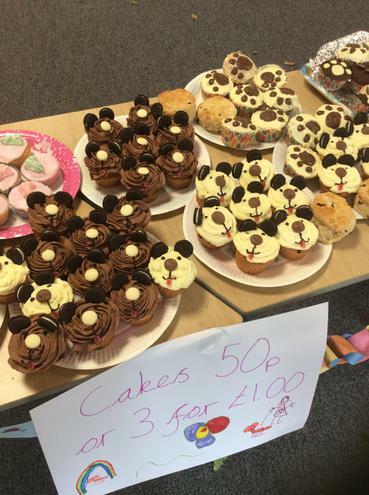 The cake sale was so popular and we sold every single cake! 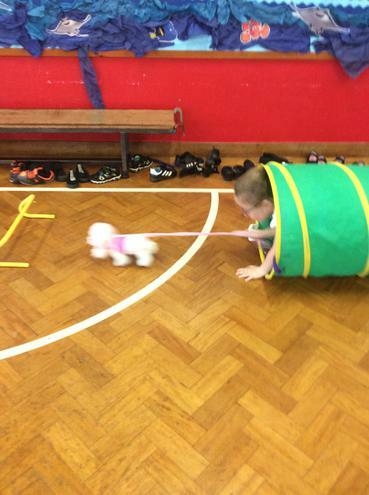 The next day we then had our sponsored dog training. 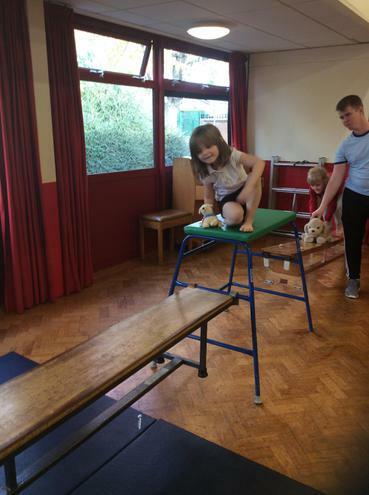 Each of the children brought in their dogs (teddies) and Mr Willbond set up an extremely exciting agility course for us to take them round. 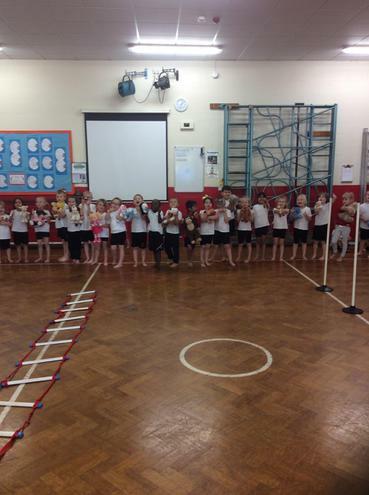 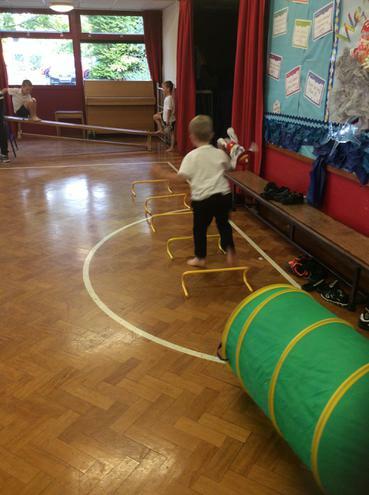 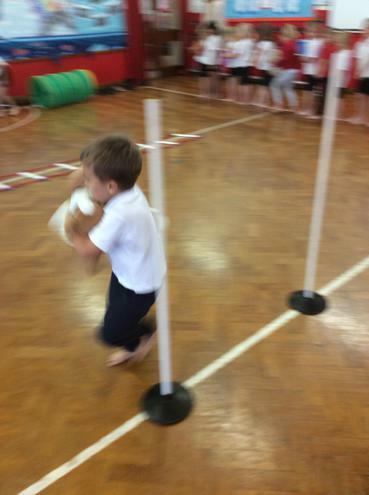 As you can see from the pictures, the children had so much fun and kept begging to go round over and over! 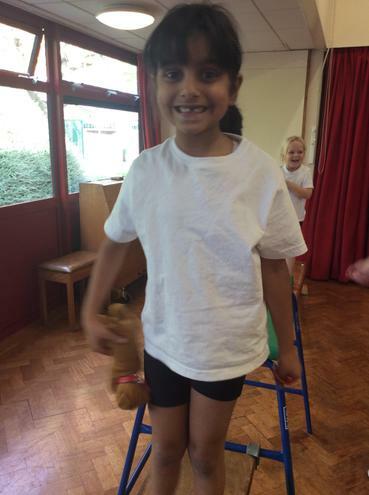 We raised over £160 for the Guide Dog charity which is absolutely phenomenal. 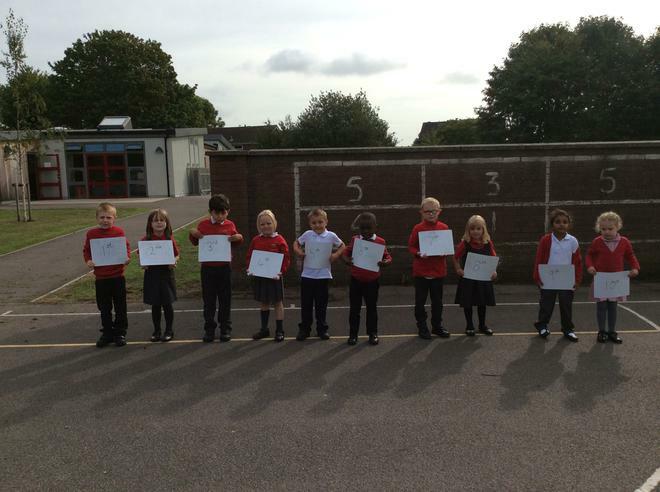 I am so proud of all of the children and am extremely thankful for your thoughtful support! 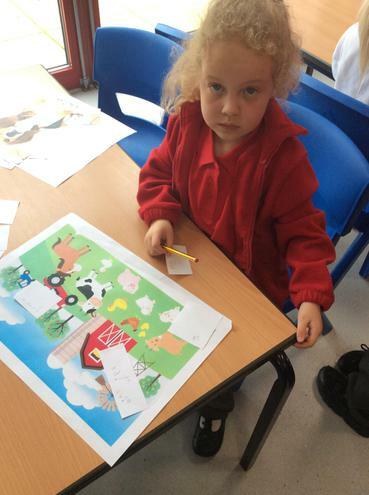 The children have been working hard on their story maps this week. 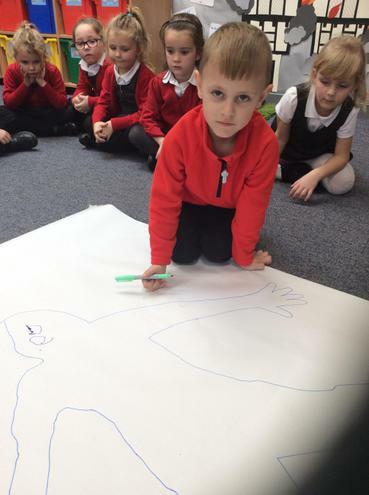 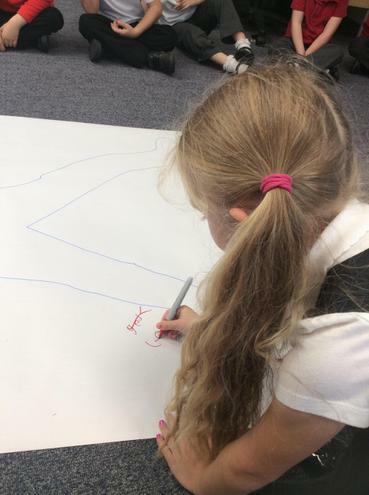 This is where the children draw pictures to help them to learn a piece of writing or text, it is a brilliant way of learning all of the key features and skills that need to be included when they write. 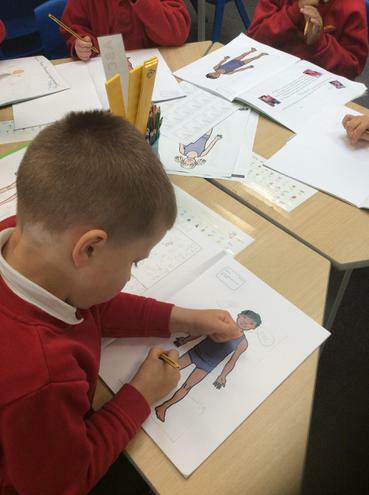 The first stage is to learn an original piece of writing, this term we have learnt a superhero story. 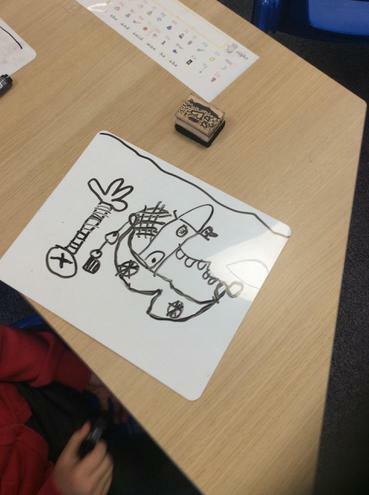 They then innovate this and make it their own and in order to learn the story they draw pictures and create actions to ensure they know it off by heart. 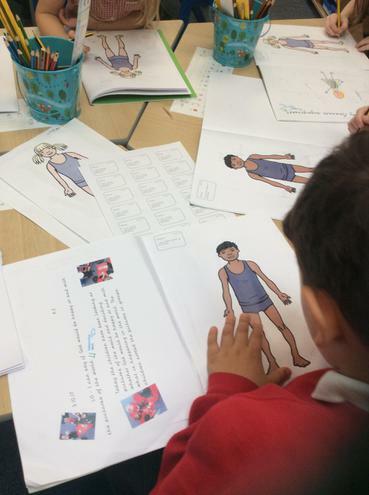 The children each created they're own fantastic superhero story that were completely they're own ideas and made up by them. 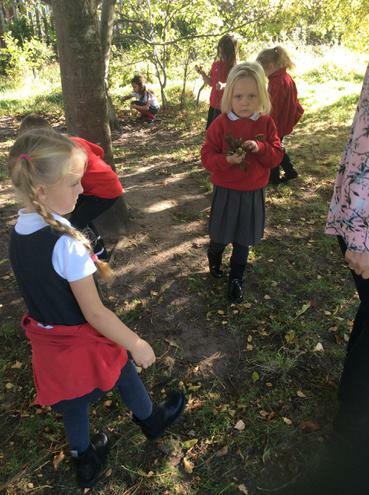 We had stories with princesses, pumpkins, stories at the beach, on the trim trail and they were all absolutely brilliant and individual. 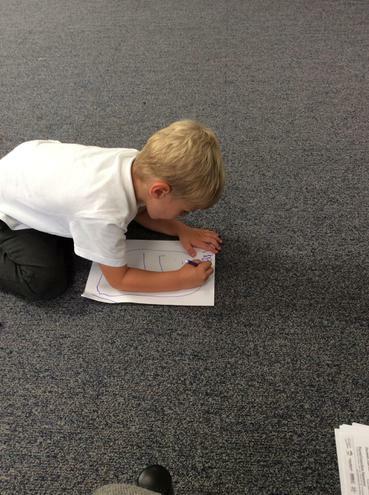 The final stage after the children have learnt their stories from their story maps is to write the story up in words. 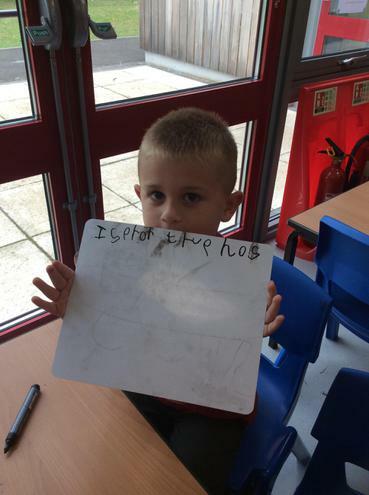 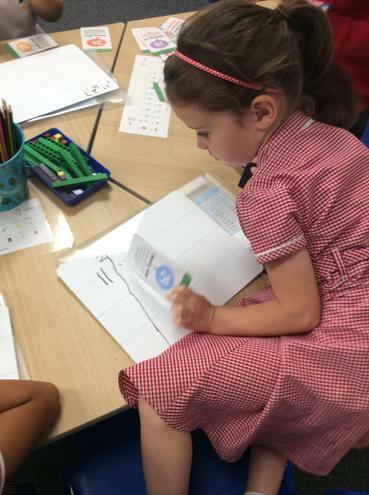 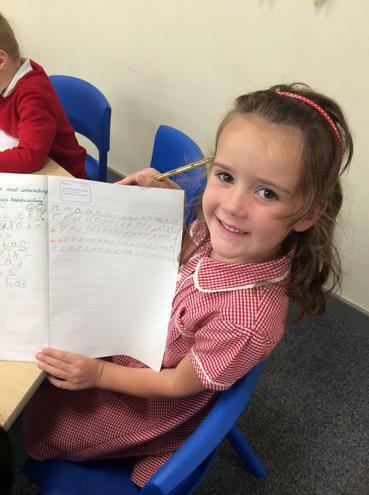 The quality of their writing was phenomenal and so many of the children are already beginning to use so many Year 1 skills. 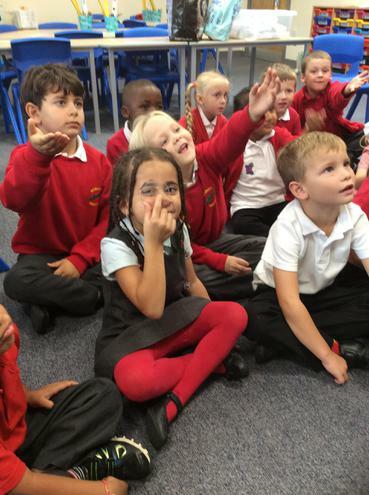 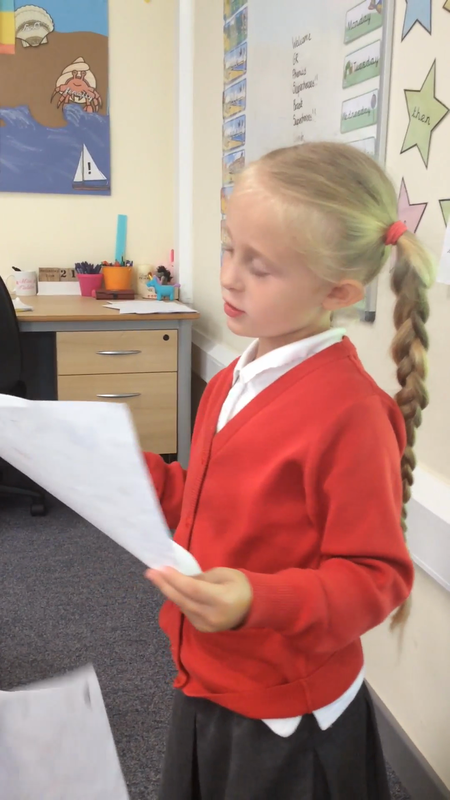 Here are some videos of the children performing their stories. 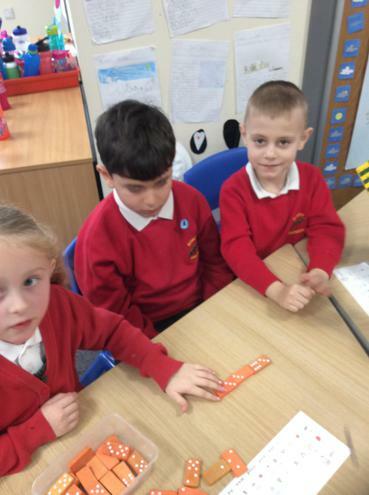 We have have learnt so much about materials in science this term. 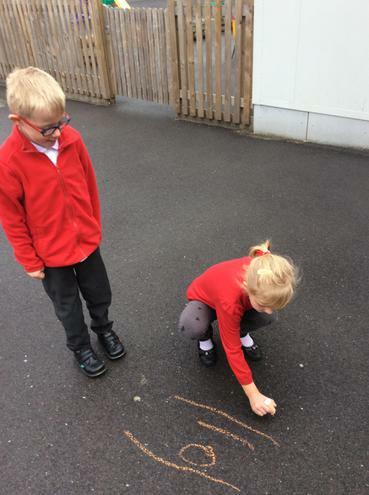 We have been naming materials, organising them, describing and even carrying out experiments with them! 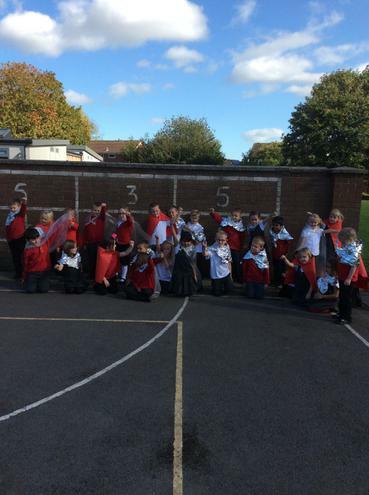 The children have learnt so much and we decided to finish off our topic by making superhero capes out of different materials. 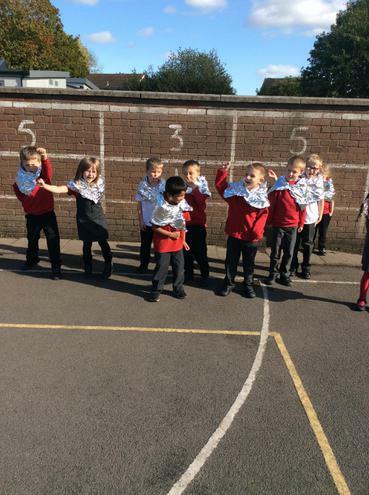 We split into different teams; Miss Fielder's team made their capes out of tin foil, Mrs Onion's team made theirs out of card and Miss Mistry's team made their capes out of plastic bags. 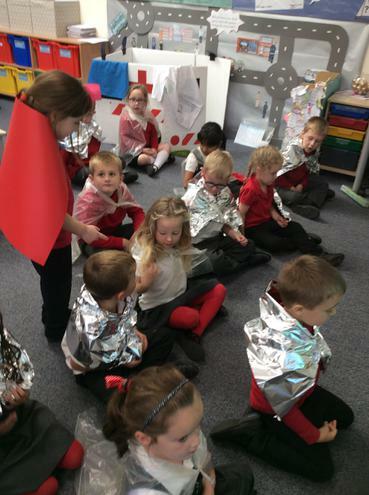 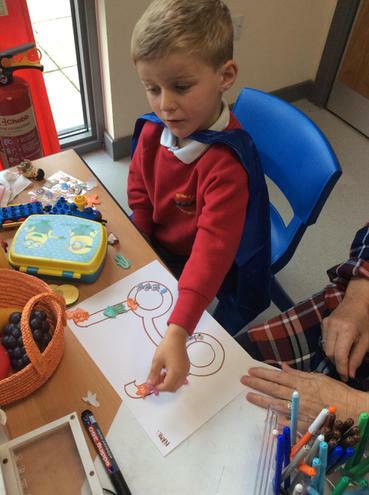 We had lots of fun in the classroom turning them into capes and then had a big discussion about what a good superhero cape would be like. 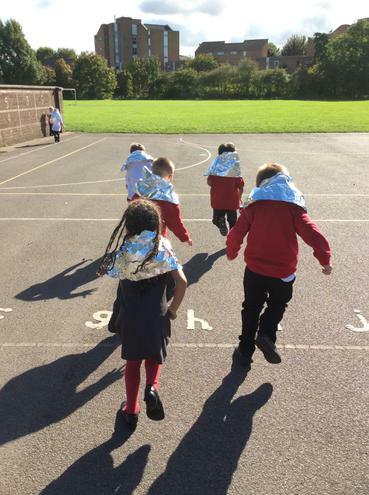 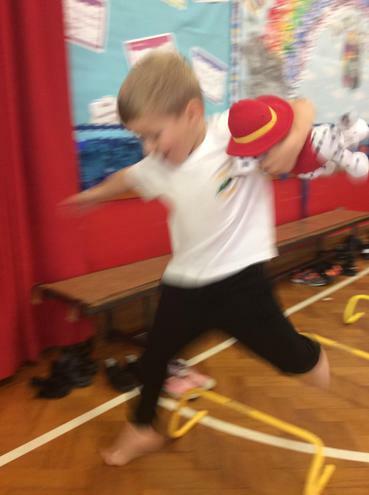 We decided that it must be able to float up as we ran, it must be comfortable, we could pull it in front of our faces to hide and would be able to last through difficult challenges. 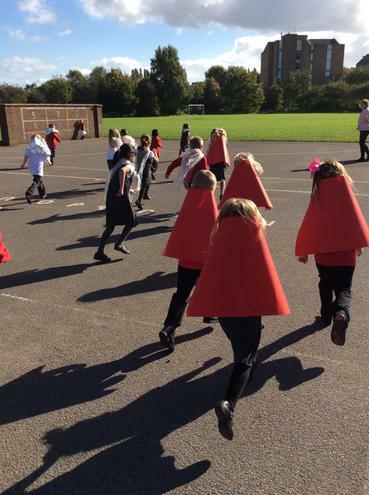 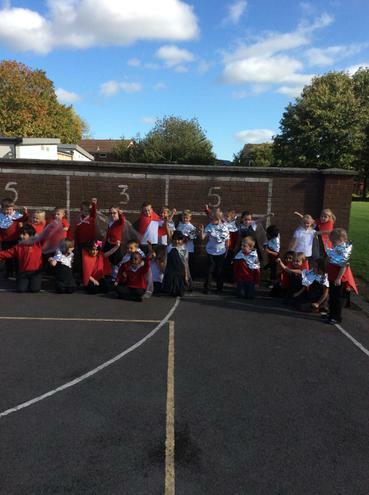 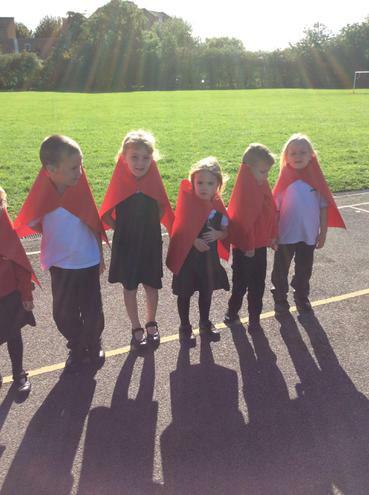 With all of this in mind, we took our capes onto the playground and put them to the test! 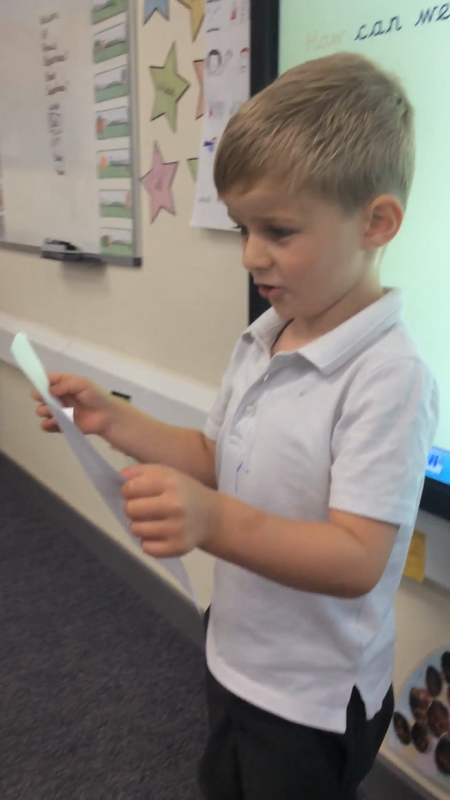 We thought long and hard about the properties each of our materials had but decided that out of the three, the plastic bag was definitely the winner! 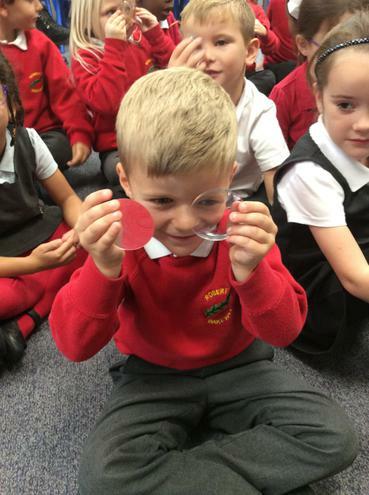 We had such a fun lesson and it was brilliant to see how much the children had learnt about materials and their properties. 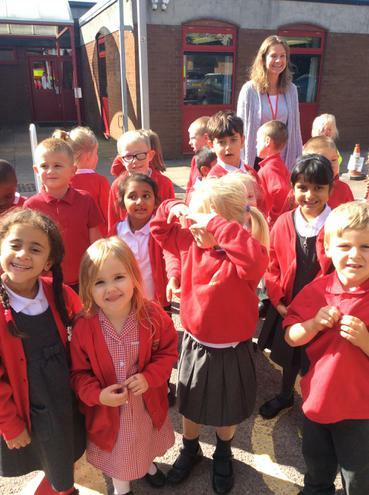 Have a look at the pictures to see all the fun we had! 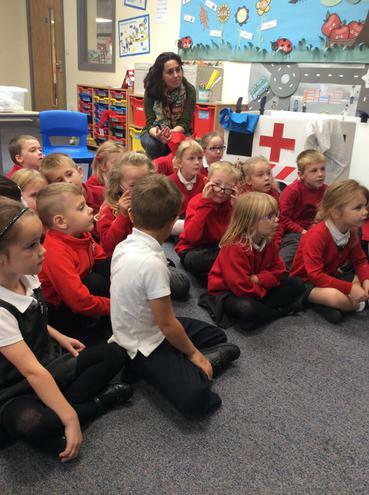 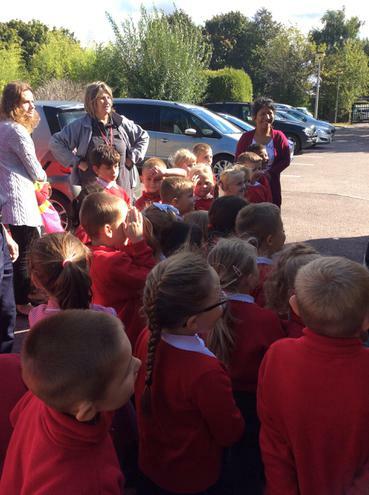 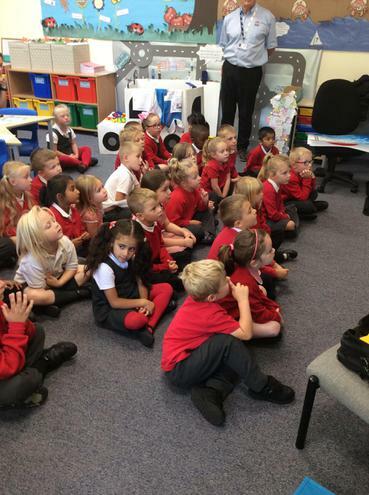 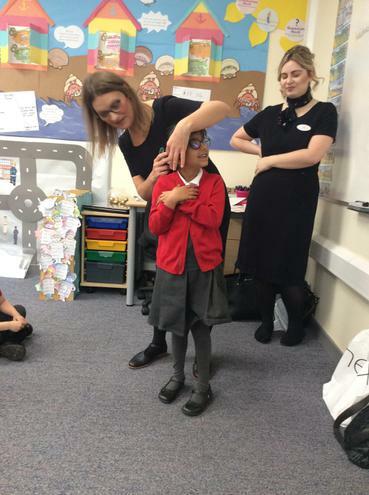 We had a very exciting visit this week from two opticians! 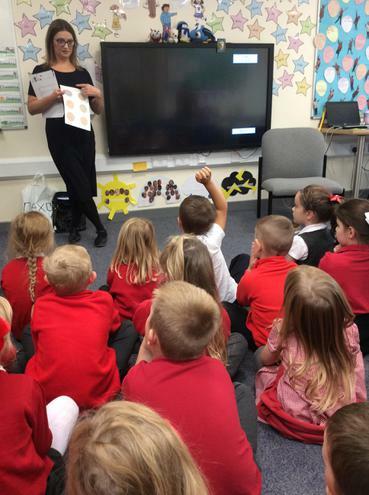 It was an extremely interesting visit and we learnt so much during the quiz (especially Miss Fielder, Mrs Viluni and Mrs Onions, they got them all wrong)! 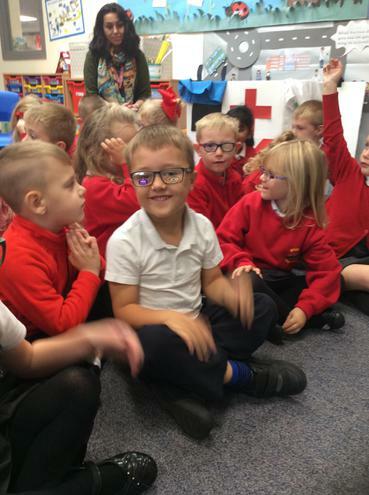 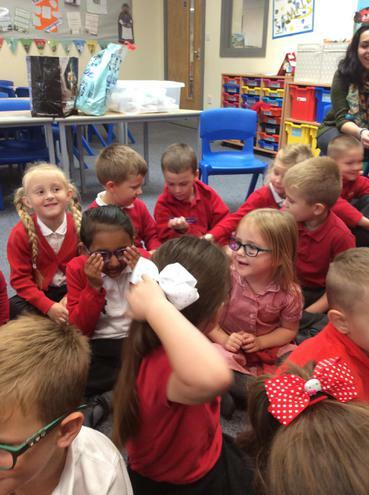 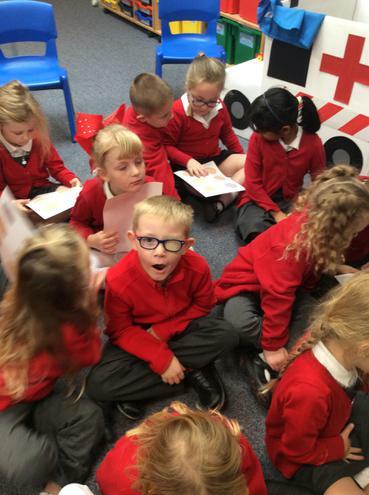 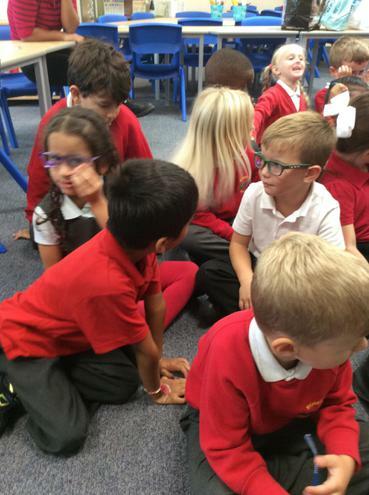 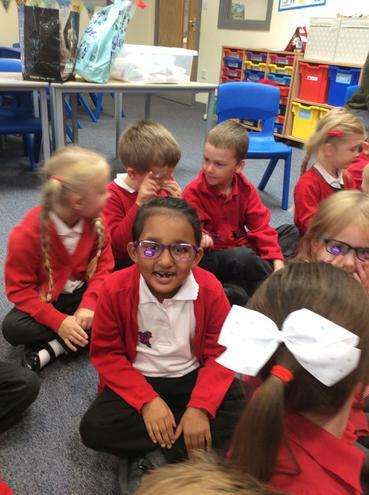 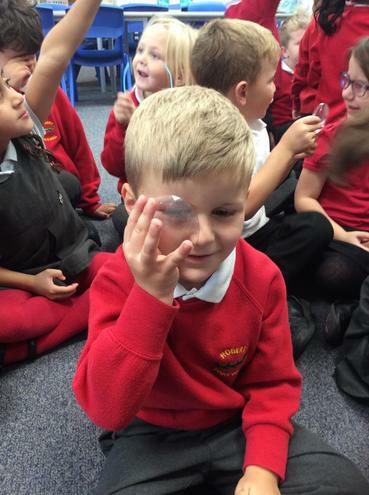 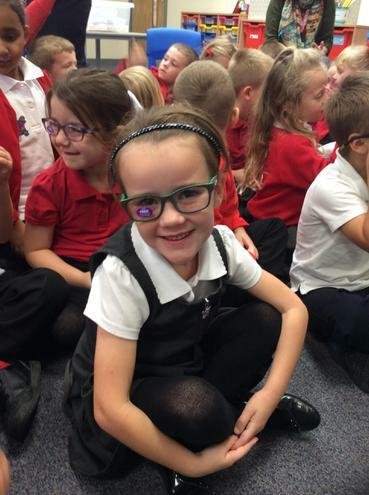 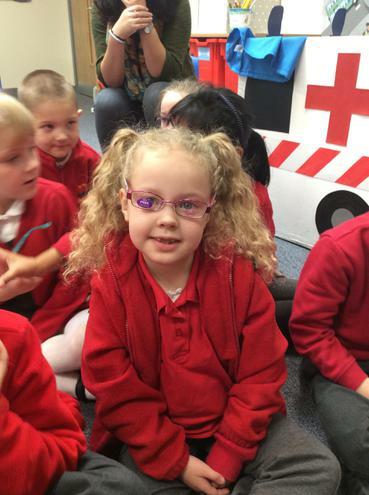 The children got to try glasses on and look through lenses to see what it would look like to wear glasses, the children also learnt how eyes were tested and all of them had a little play around with the colour test. 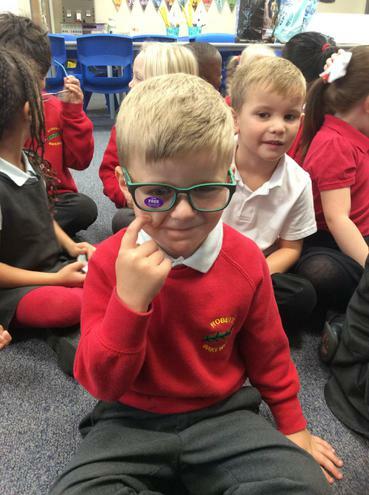 We ended the fantastic visit by making our own funky glasses! 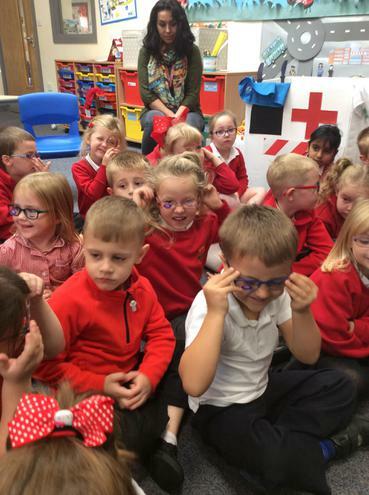 They were brilliant and we had so much fun making them, I definitely think that the opticians should make them into real children's glasses, what do you think? 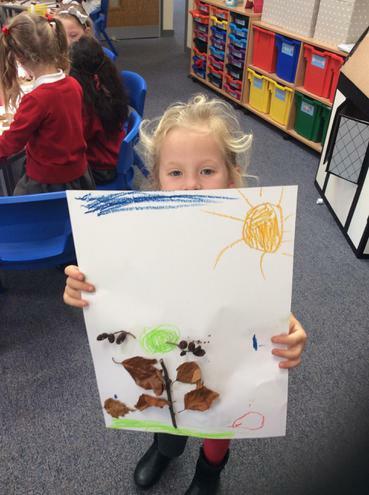 This week in religious education we have been looking at pictures of the world and deciding whether God would be happy with the pictures he was looking at or not. 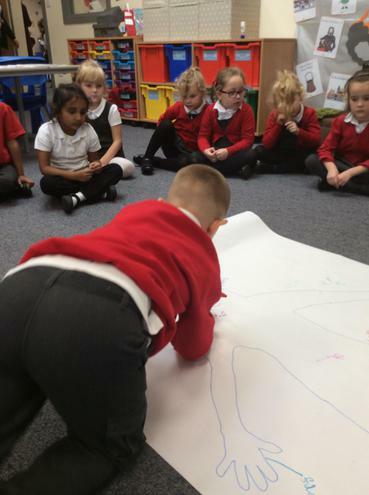 We learnt a lot about the importance of looking after the world and how we can support with this. 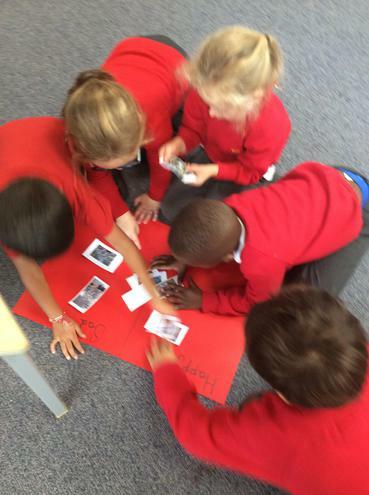 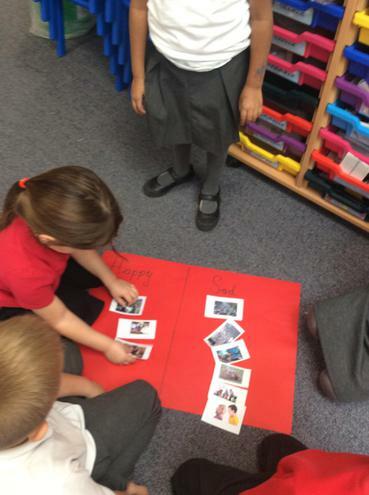 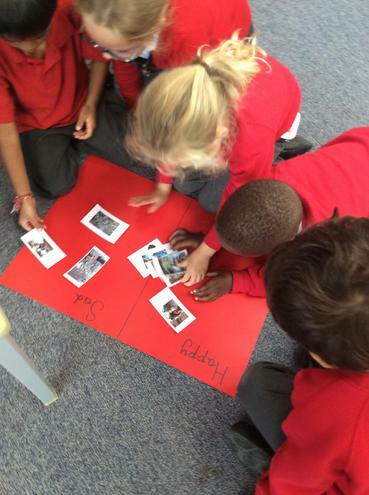 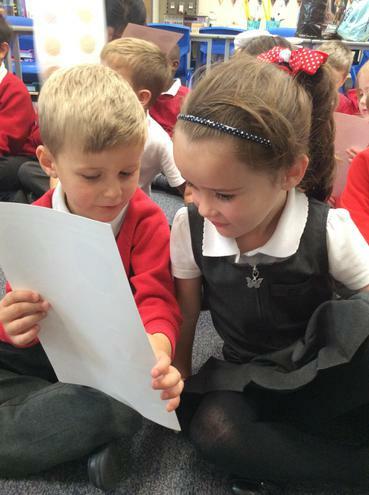 The children worked hard as a team to organise the pictures and some of them sparked some very interesting conversation. 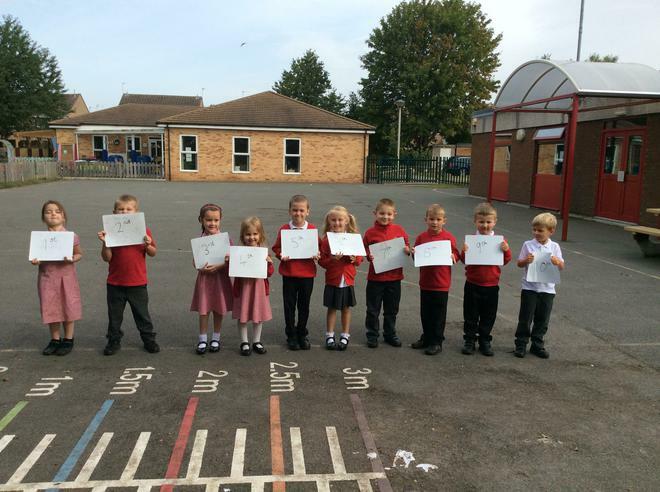 Well done 1F! 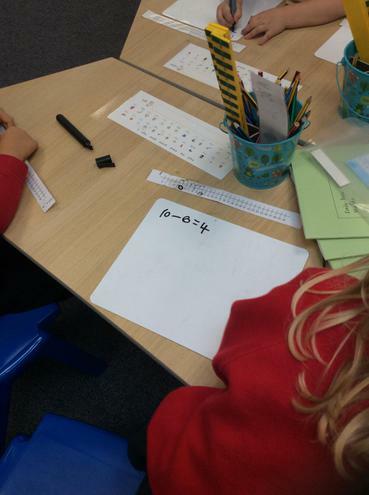 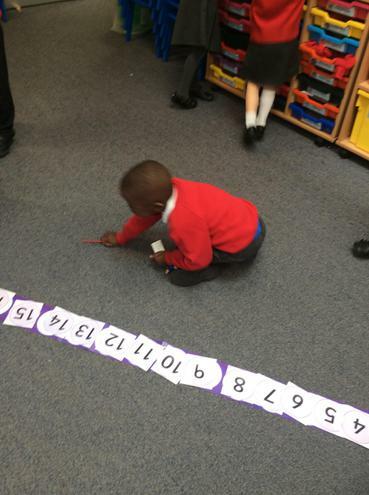 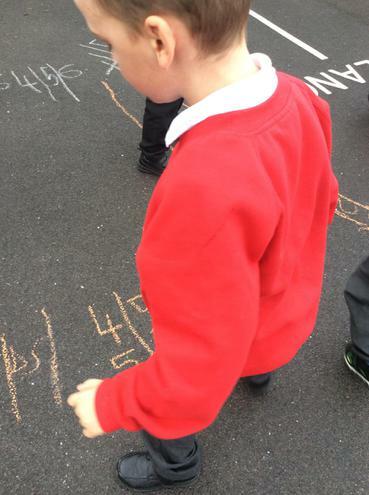 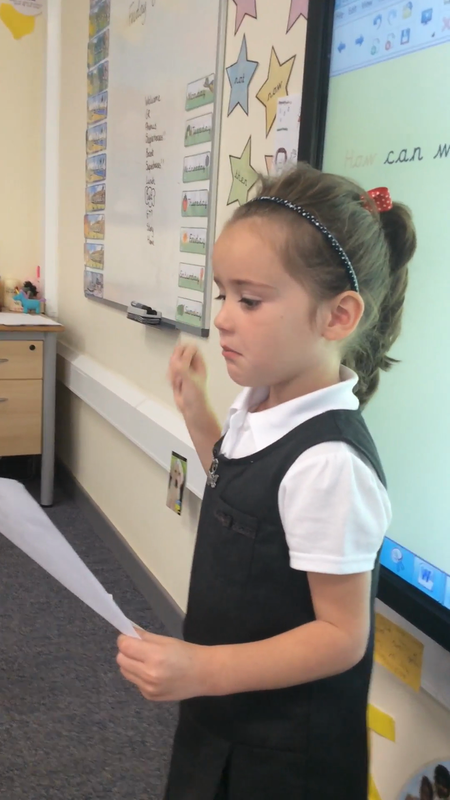 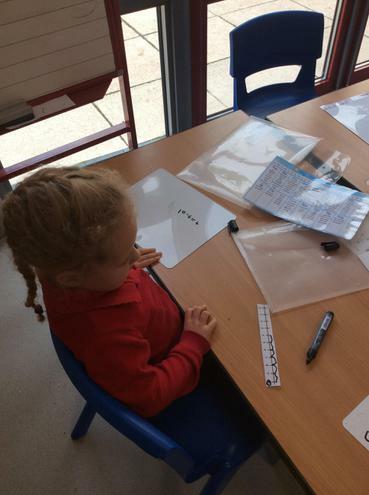 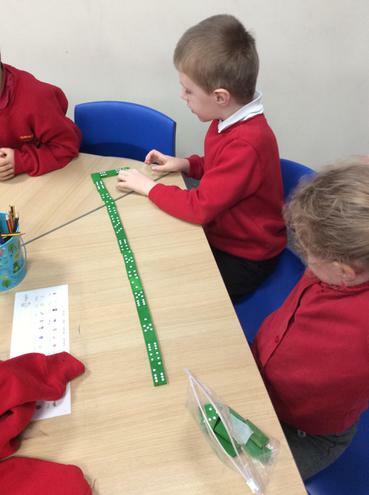 This week in maths we have been learning how to add and subtract using a number line. 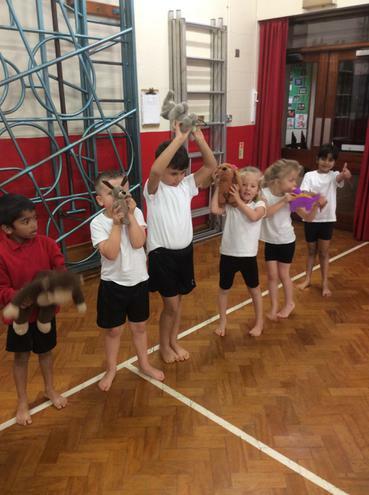 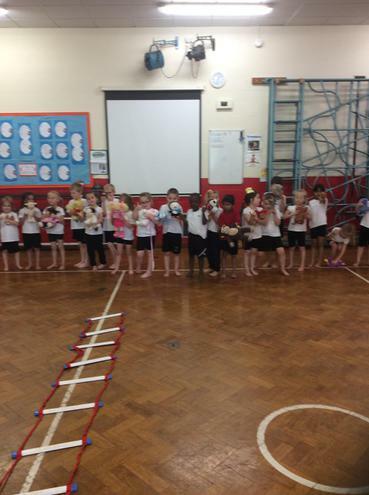 The children were such experts at this that they even taught our class teddies how to do it! 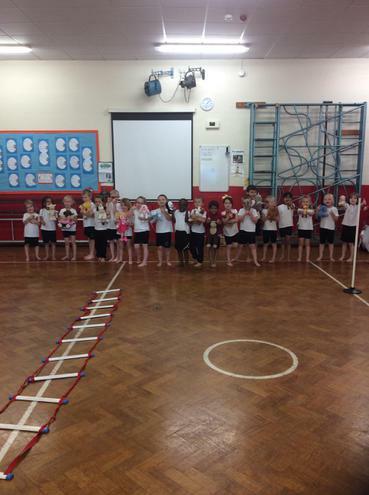 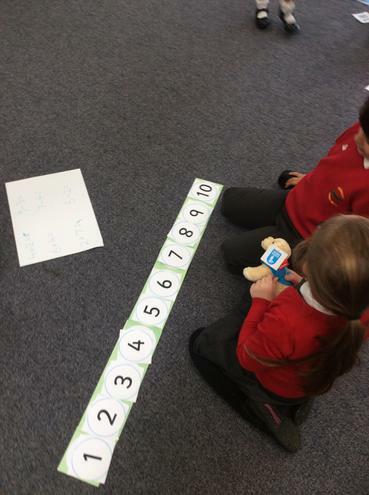 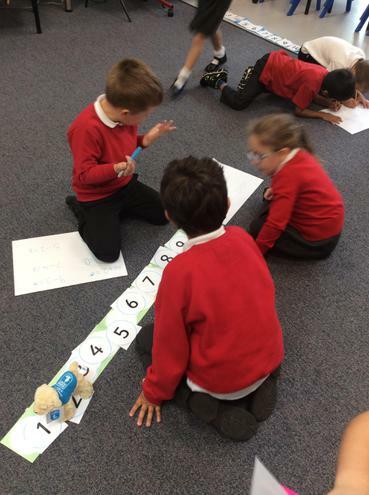 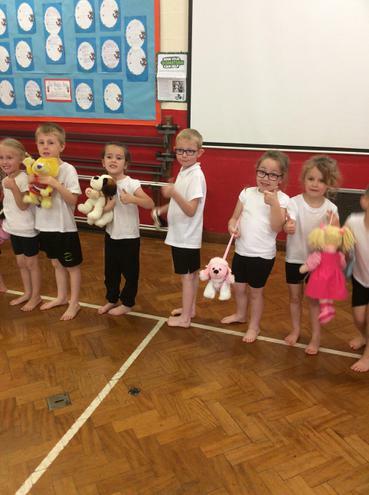 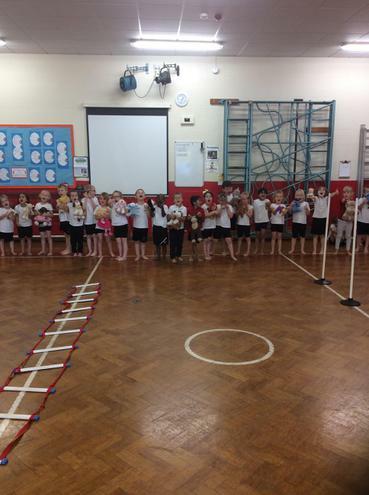 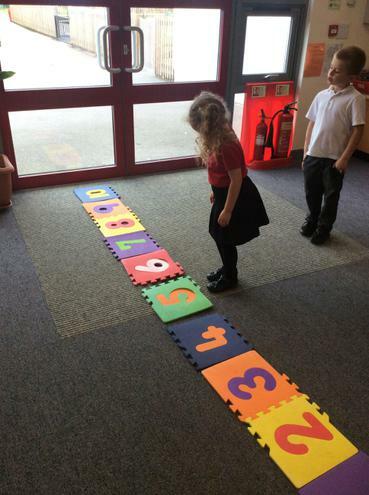 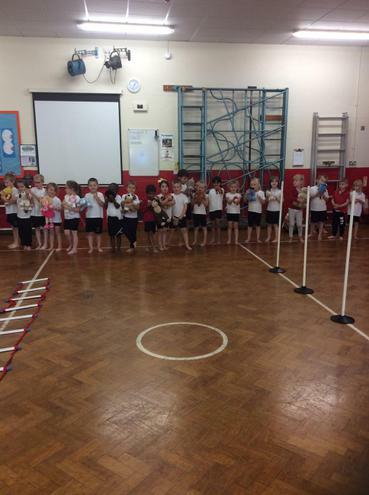 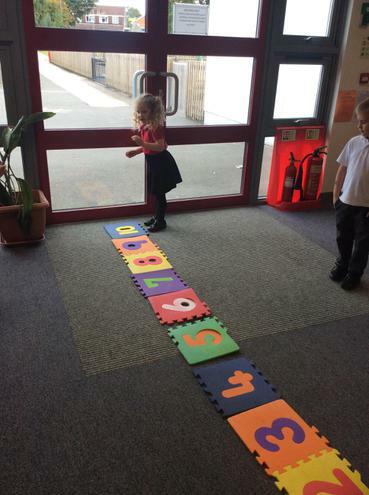 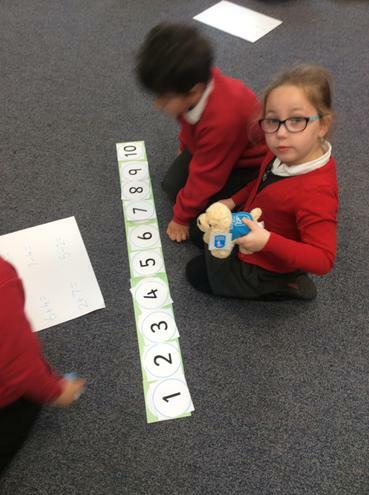 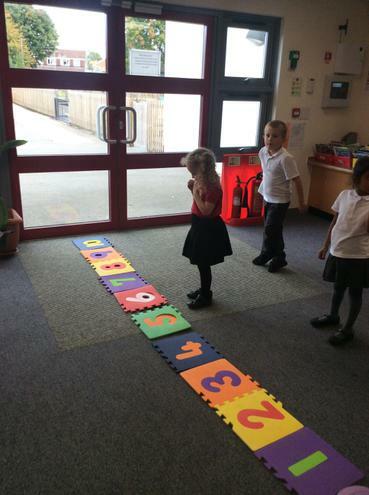 We made human number lines and the children used the teddies to jump forwards or backwards to add or subtract. 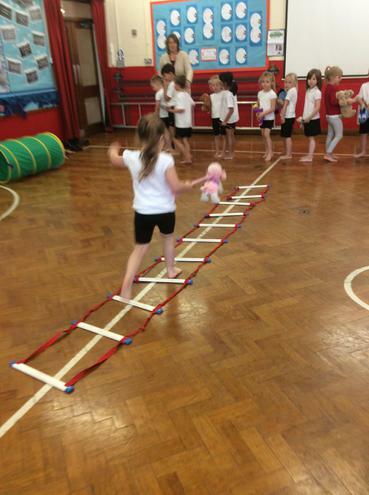 They were talking the teddies through each step as they did it. 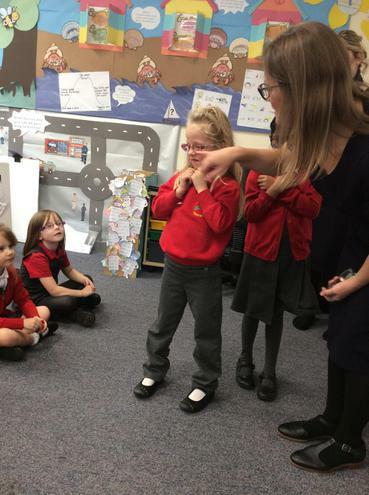 It was very interesting and Miss Fielder even learnt a thing or two. 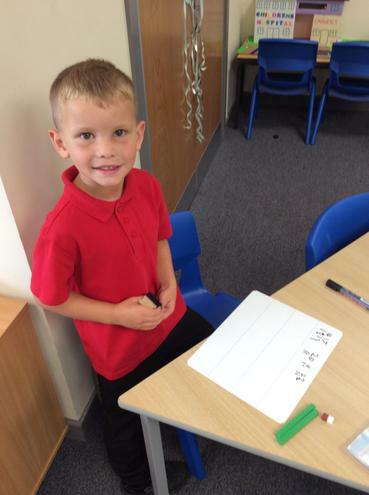 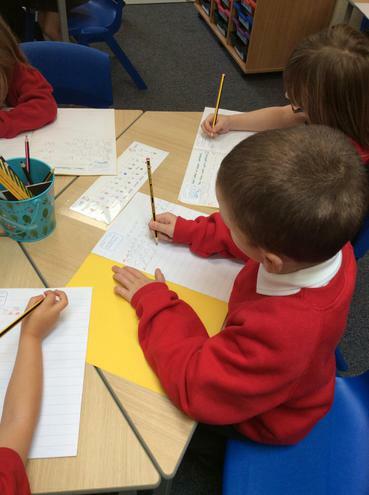 The children are all making phenomenal progress in maths and I am so pleased with every single one of them. 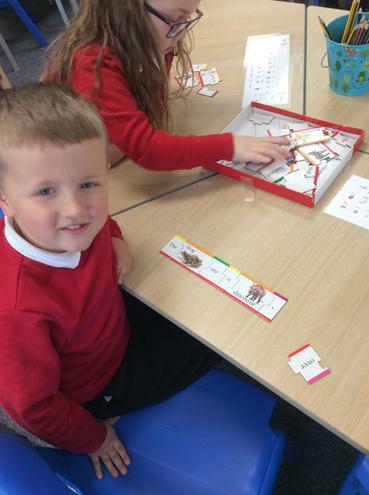 They are tackling some tricky concepts extremely well and you can see the enjoyment on their faces as they are learning! 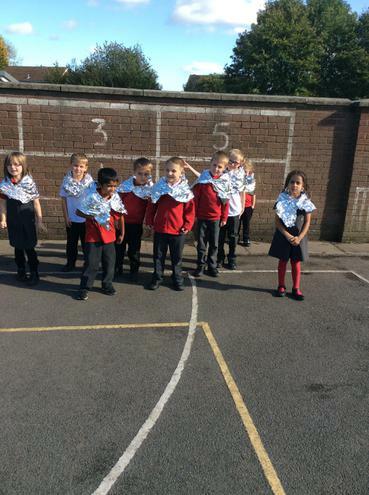 Well done 1F, you are all superstars! 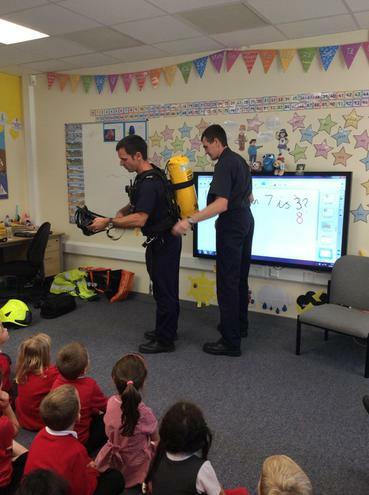 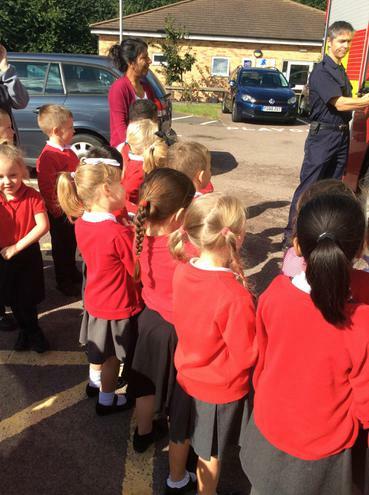 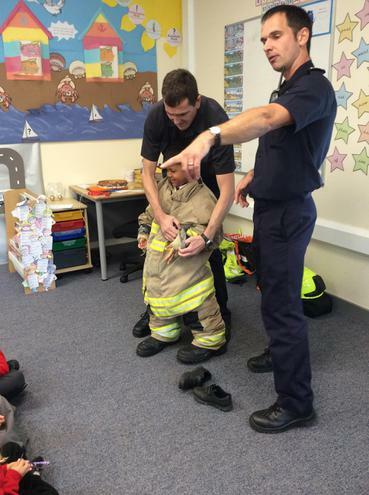 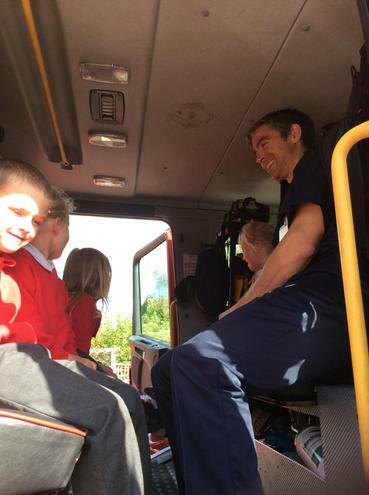 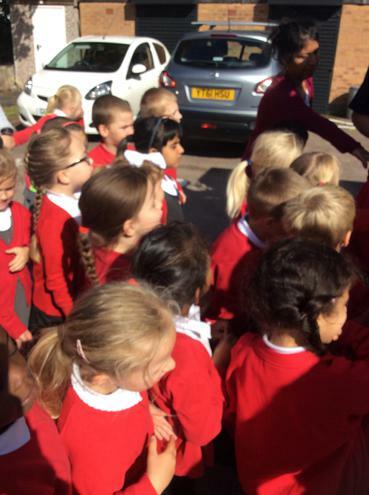 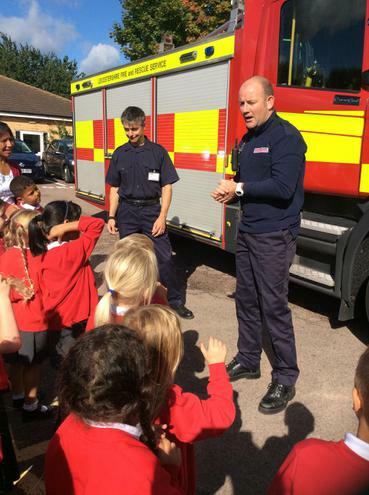 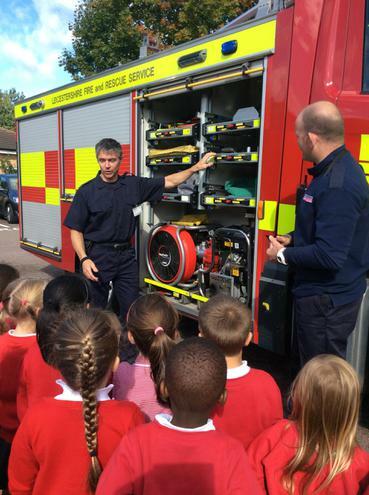 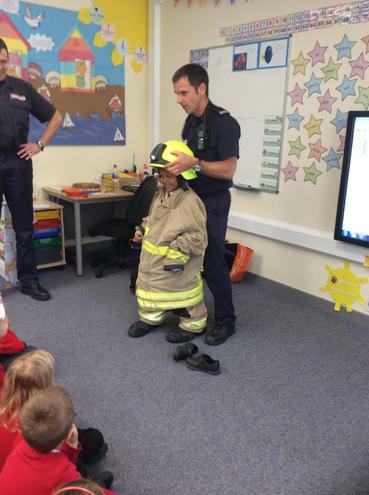 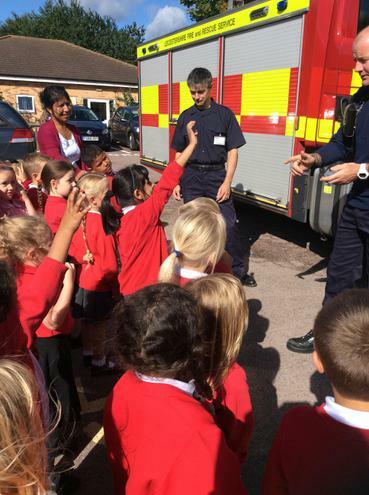 We have been very lucky today and received an extremely exciting visit from the firefighters! 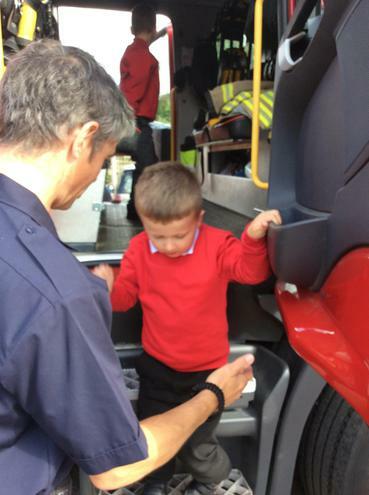 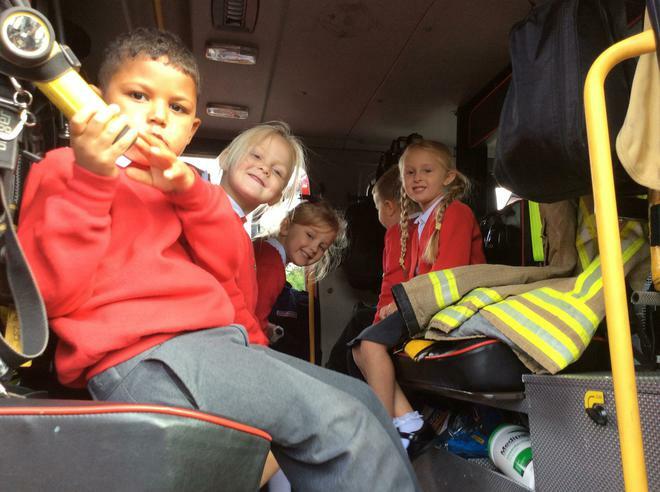 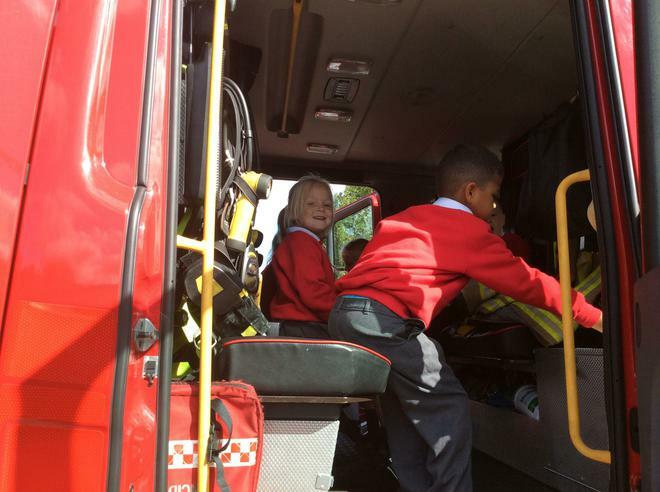 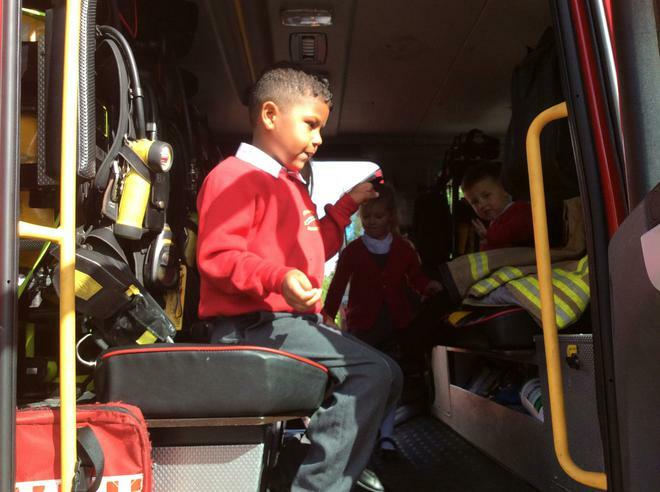 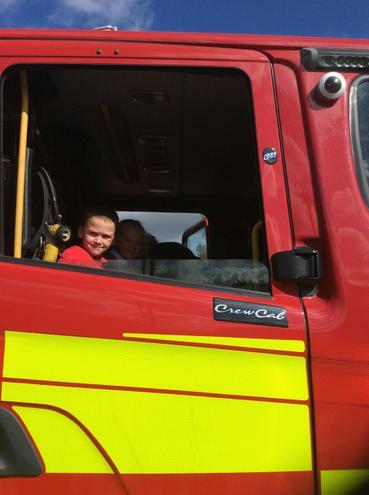 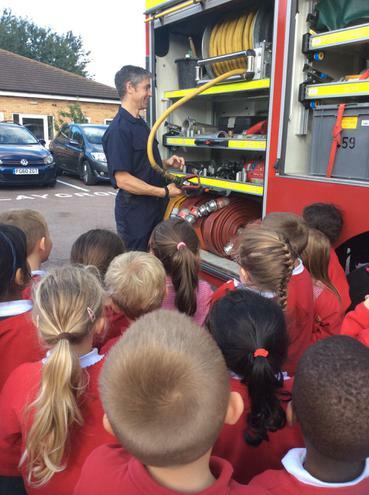 We got to see the fire engine and were even lucky enough to go inside! 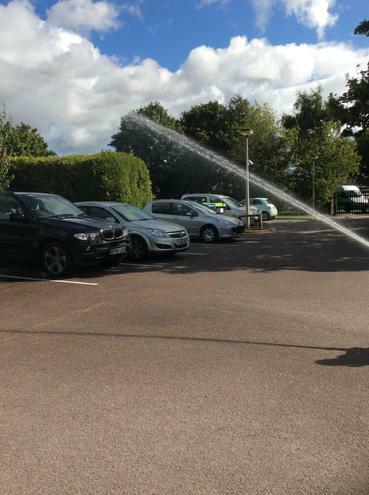 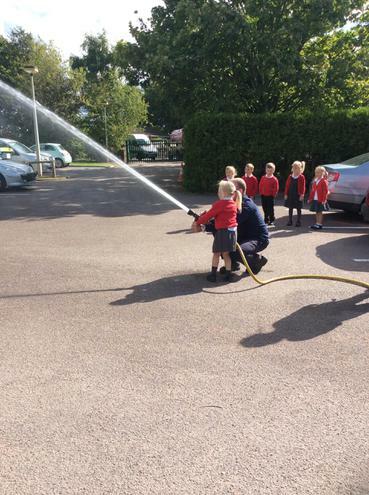 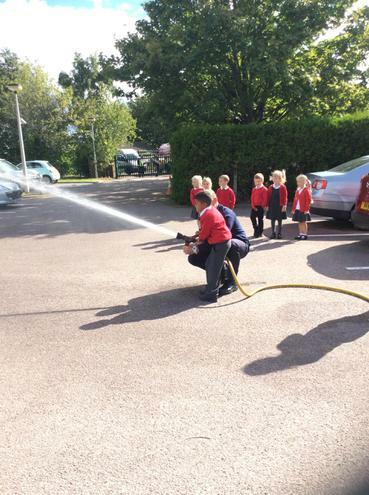 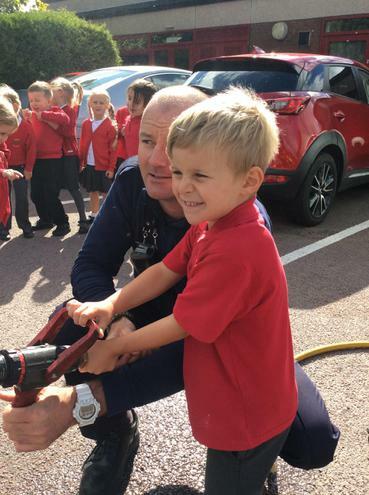 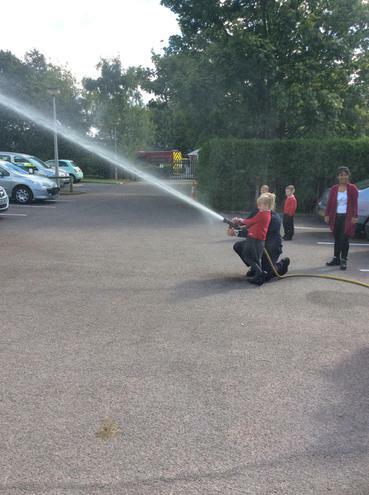 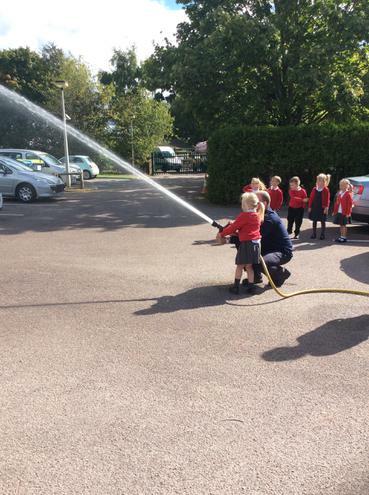 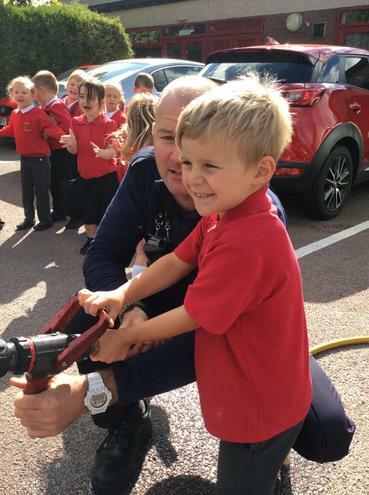 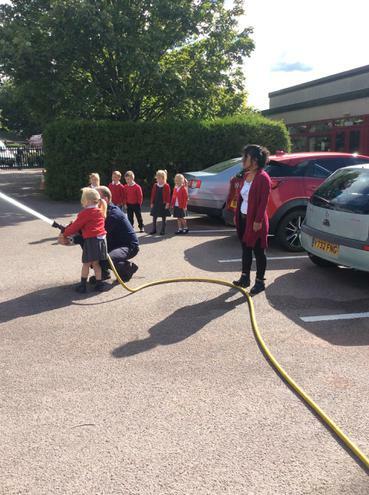 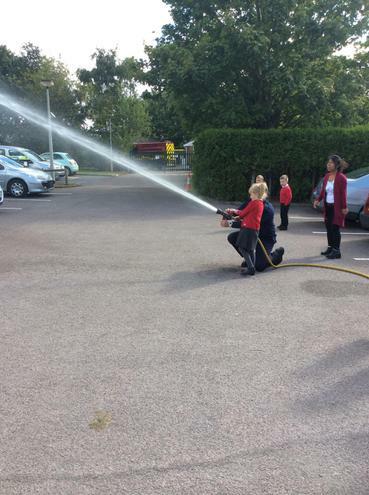 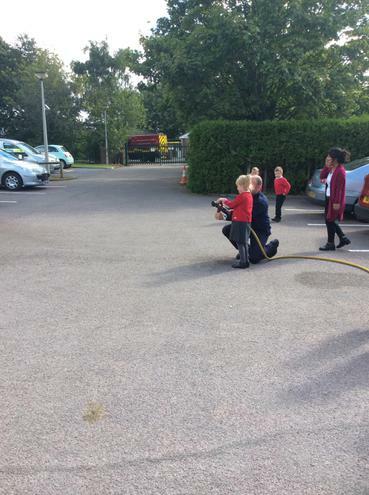 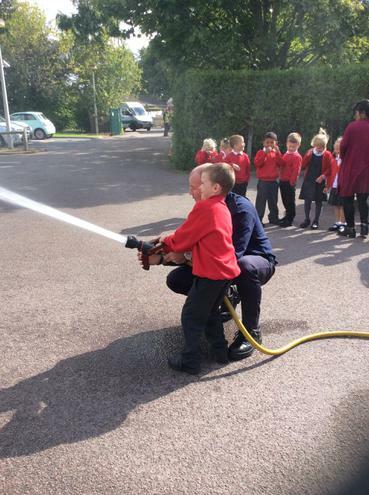 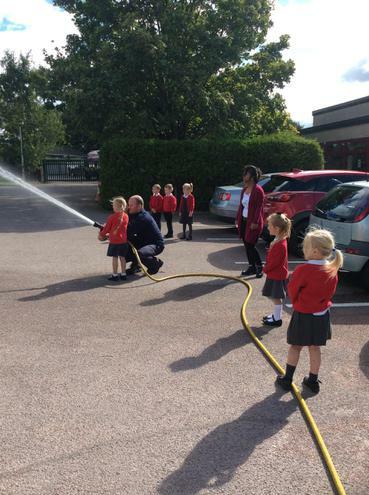 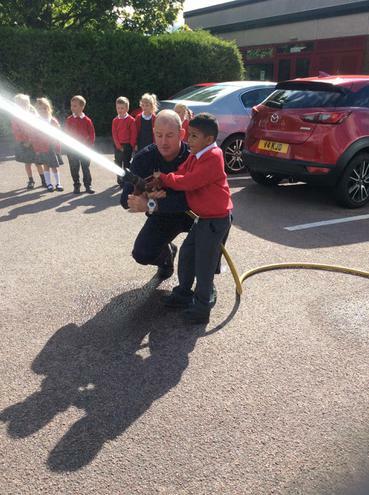 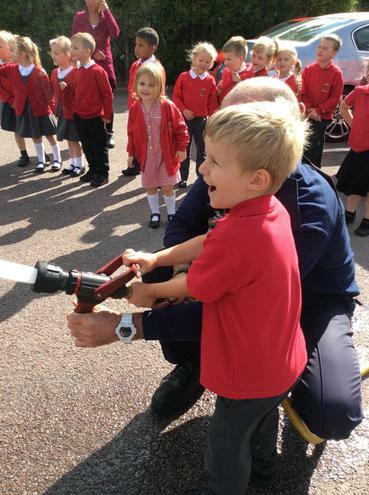 We also got to spray the hose ( some of the teachers were happy as their cars got a good wash)! 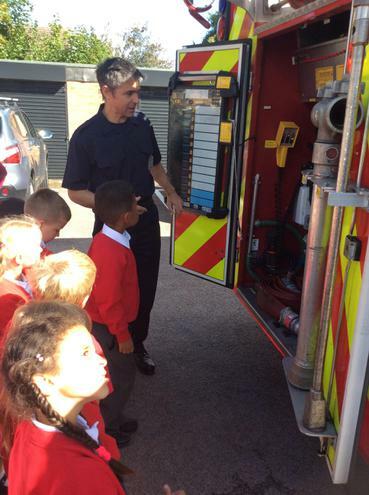 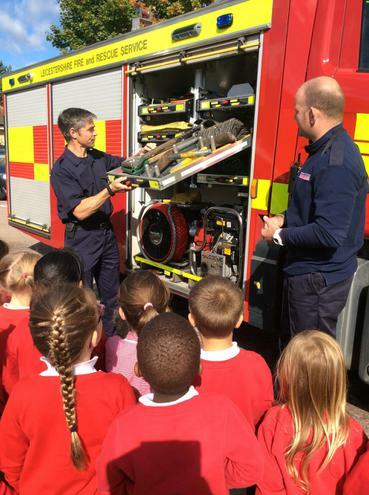 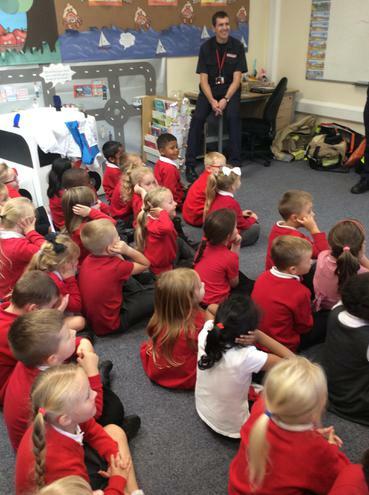 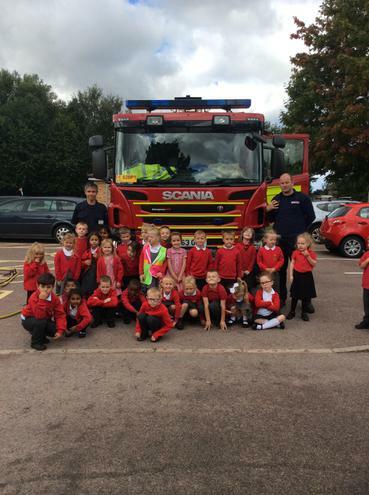 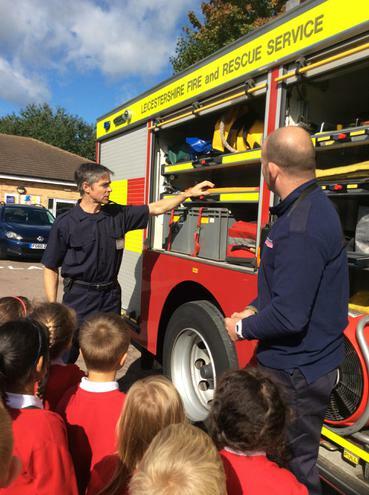 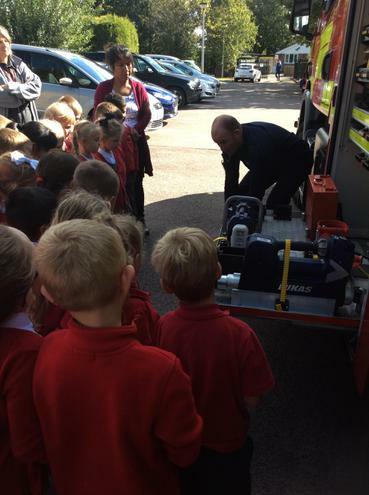 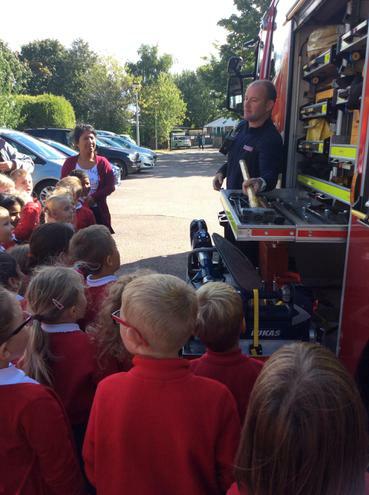 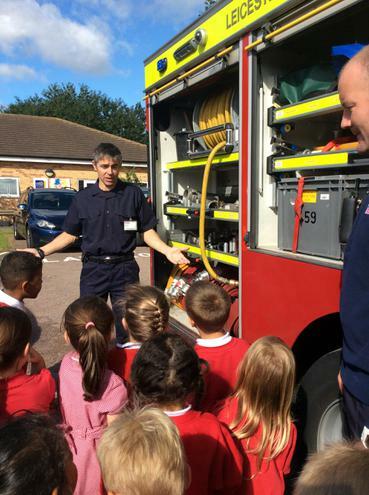 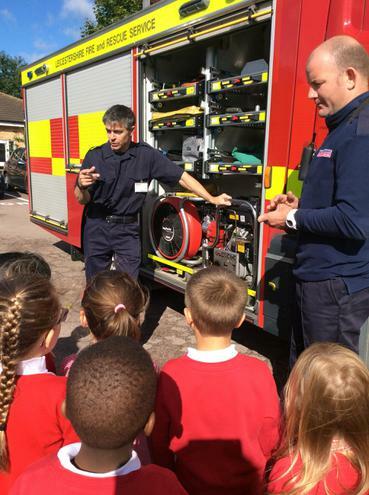 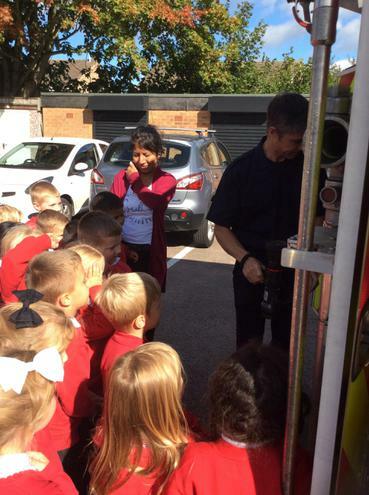 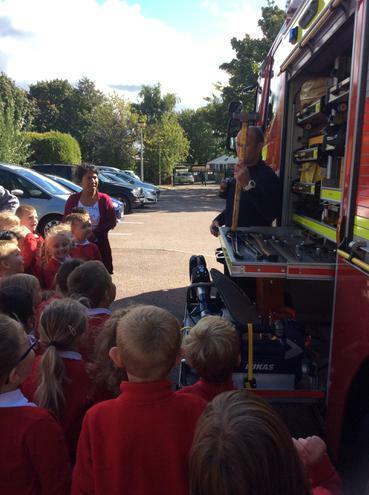 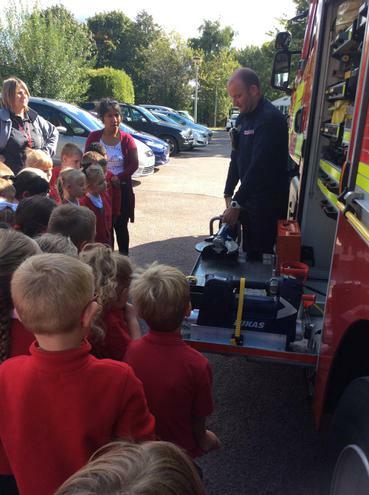 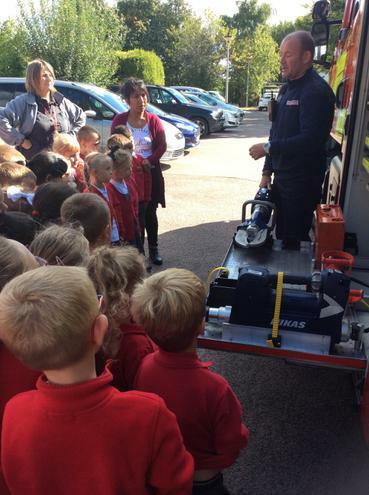 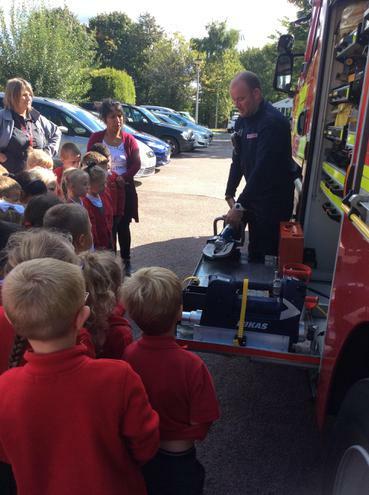 It was an extremely exciting visit and we learnt so much about how firefighters help to keep us safe and what they do to help us! 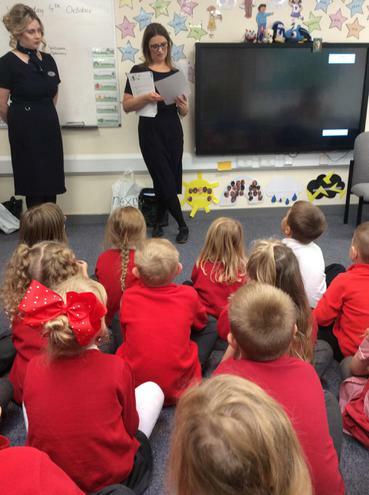 Be sure to ask your children all about the visit as I am certain they have lots of exciting information to share with you! 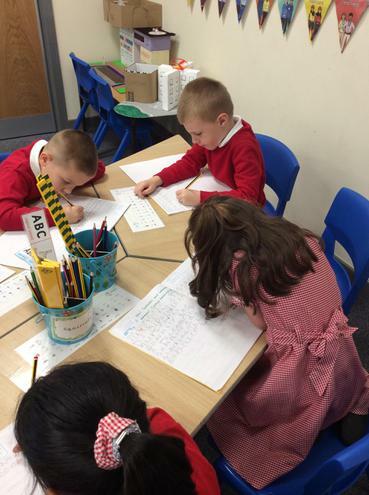 In English today we had to work super hard as there was lots of work to complete. 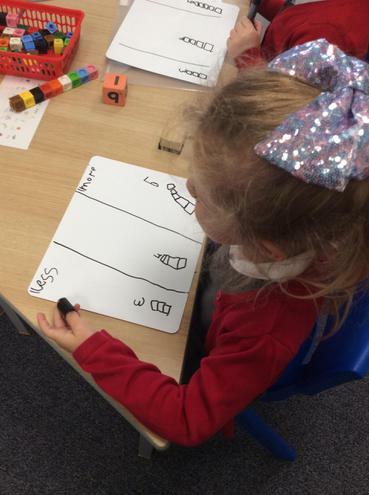 There were different stations in the classroom; one with playdough to form capital letters, a writing station, a listening station where the children had to listen back to their sentences and write it. 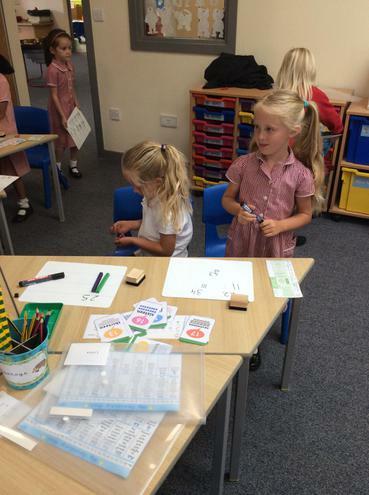 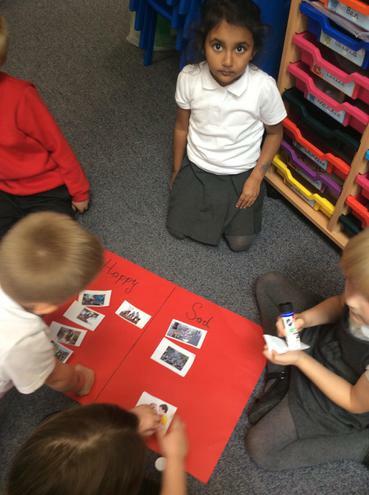 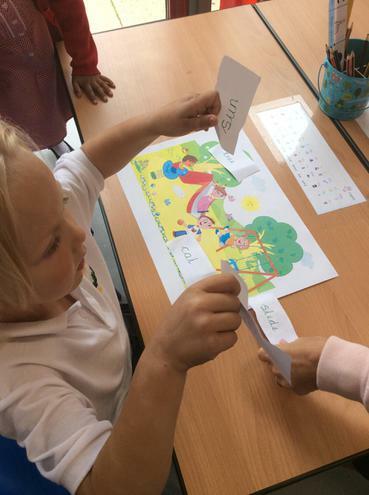 There was also a picture and word matching station and a table where the children had to build their own silly sentences! 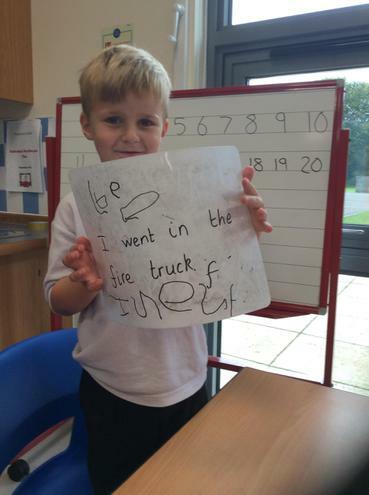 The children worked exceptionally hard and some of their sentences were phenomenal! 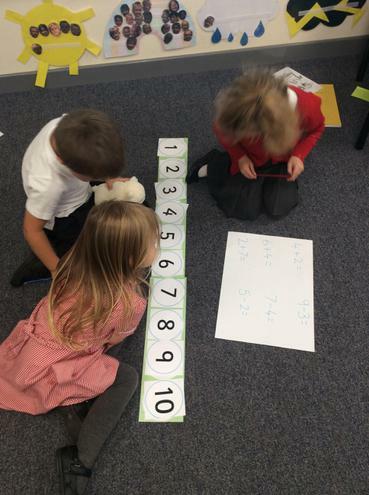 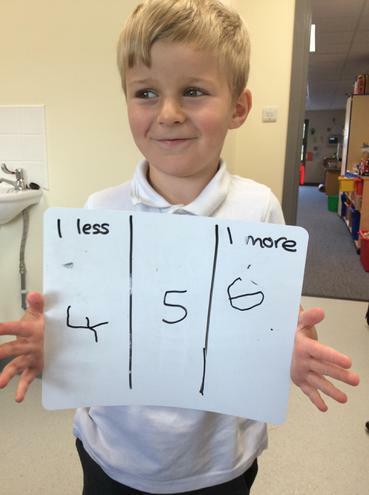 Everyone has been working extremely hard in 1F this week finding 1 more and 1 less than a number, some of us have even been finding 10 more and 10 less! 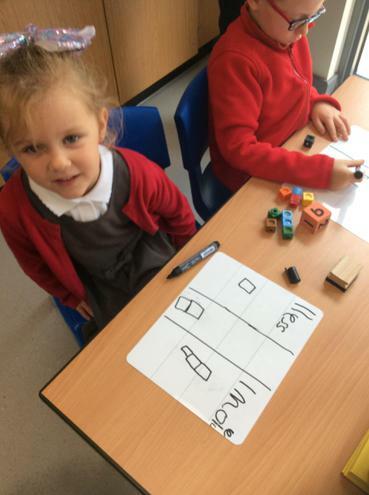 We have been using cubes to support us and building towers to show more and less, we have also built our own windows to support us when finding 1 more and 1 less on a number square. 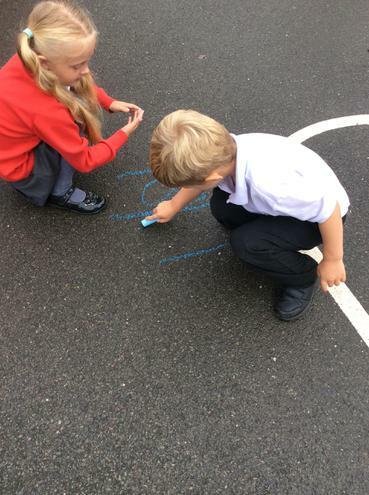 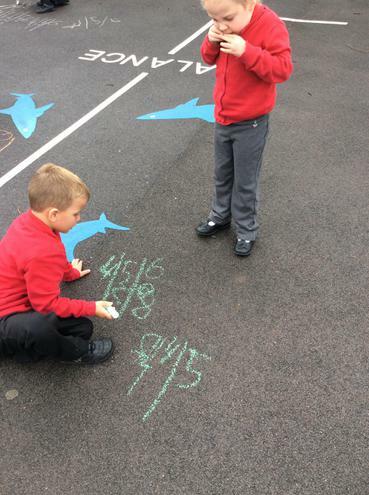 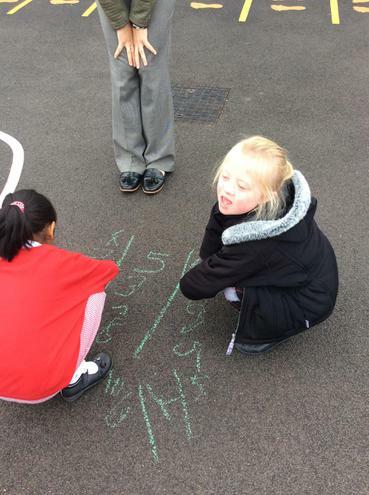 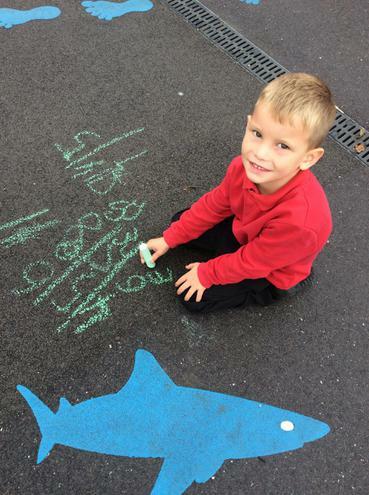 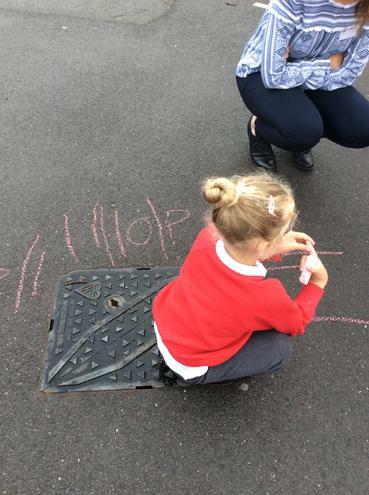 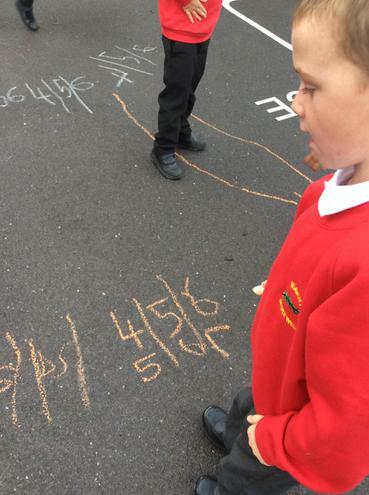 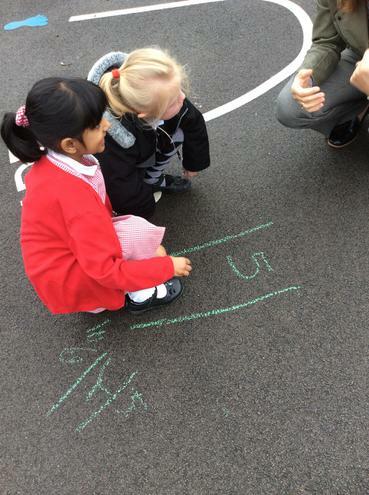 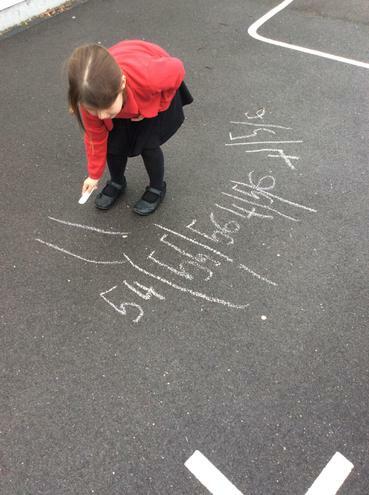 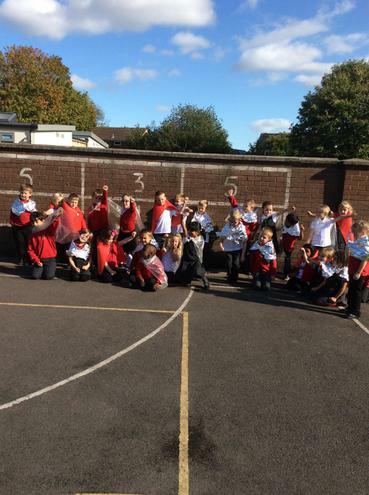 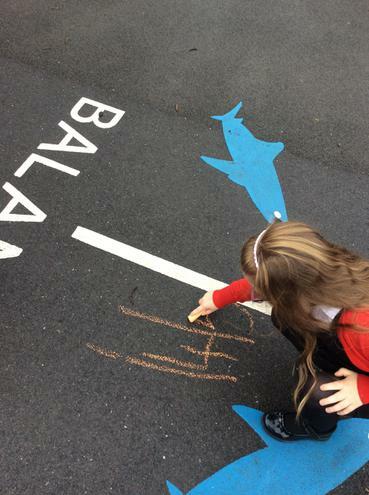 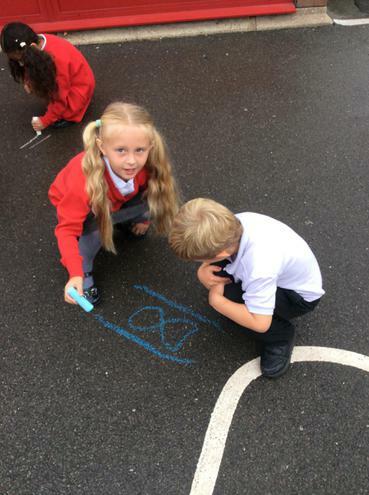 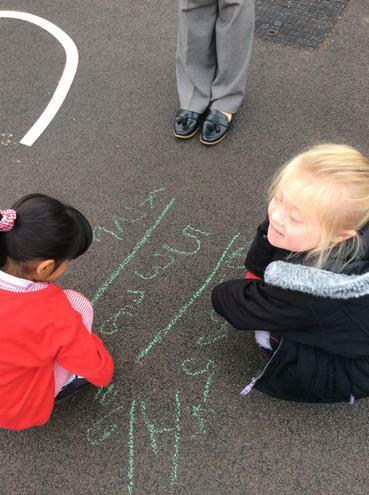 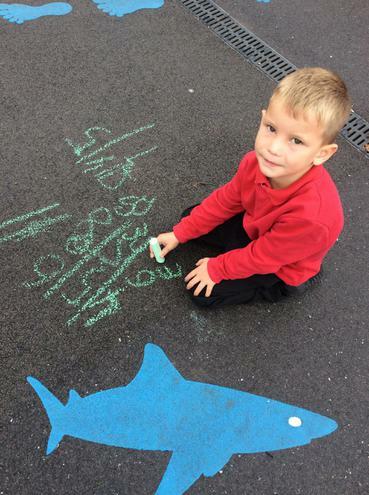 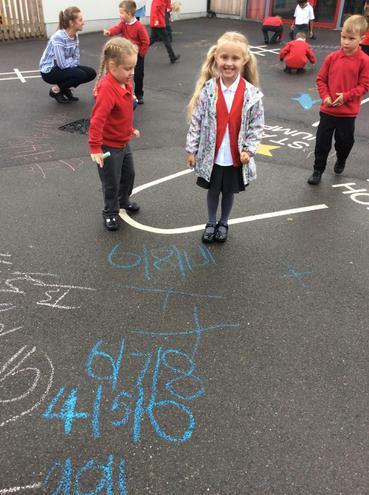 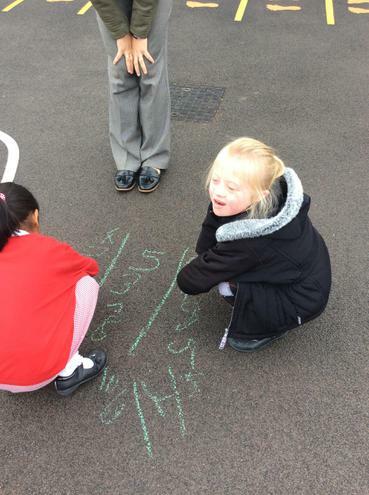 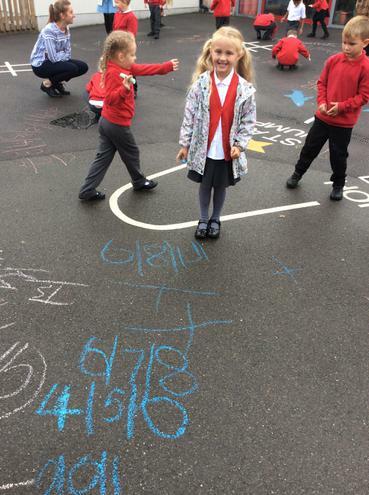 On Friday we even went outside and chalked our work onto the playground so we could show off how super we are to the rest of the school! 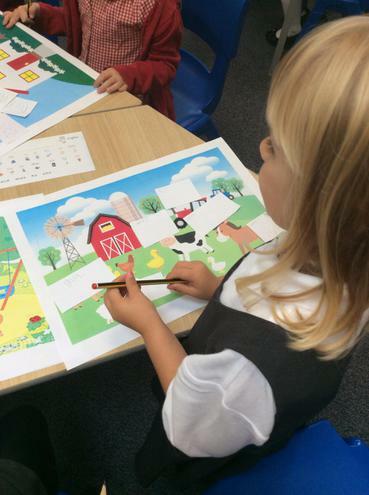 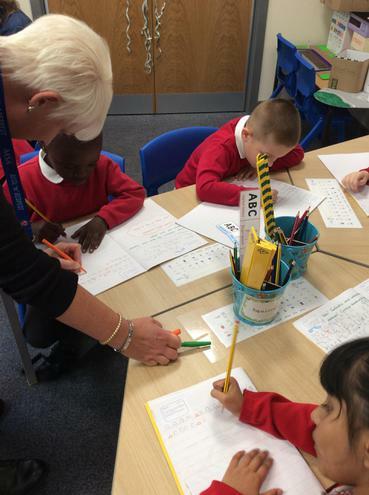 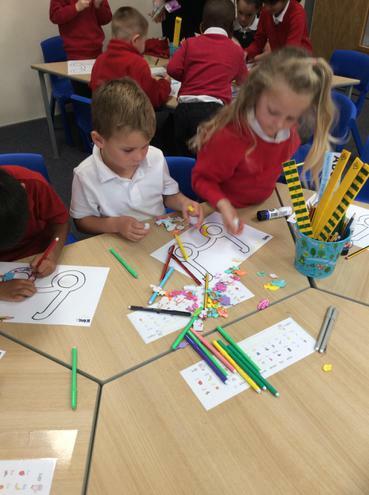 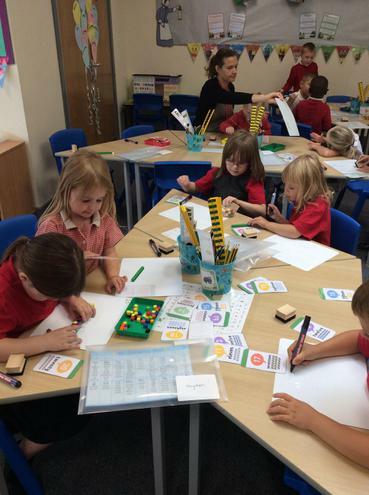 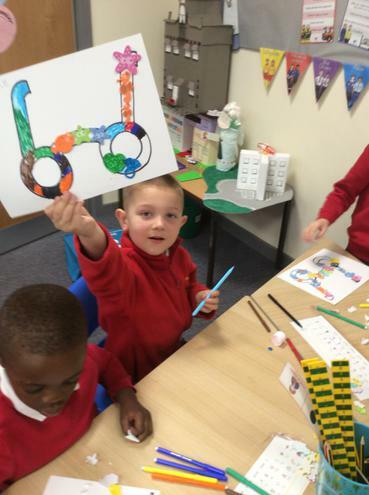 Have a look at the pictures of us working hard and ask your children at home to find 1 more and 1 less than a number! 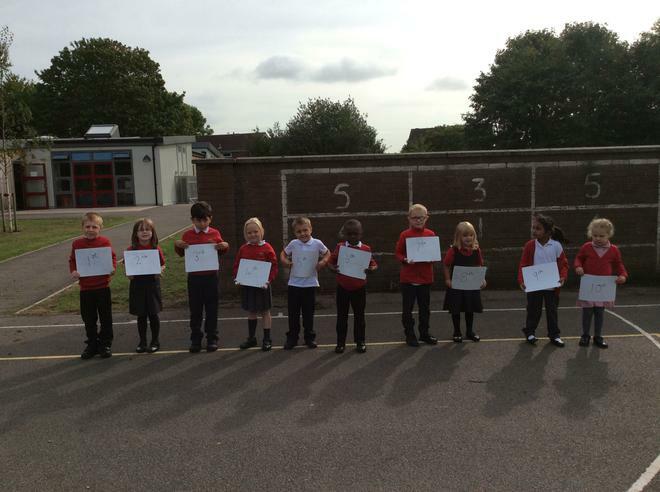 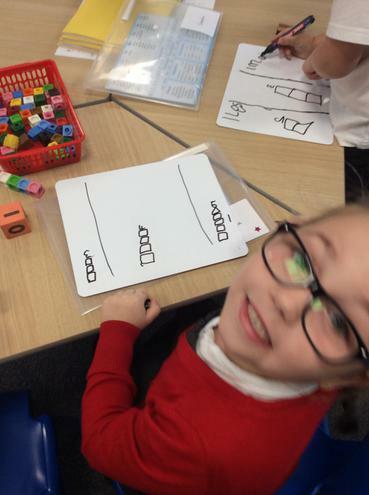 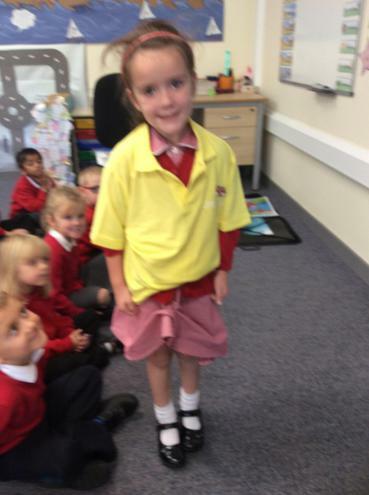 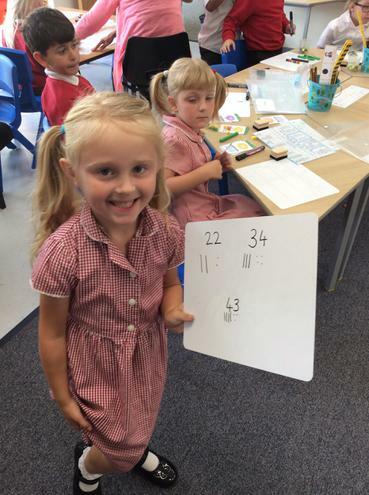 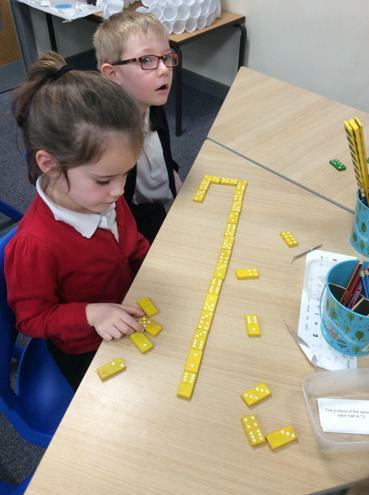 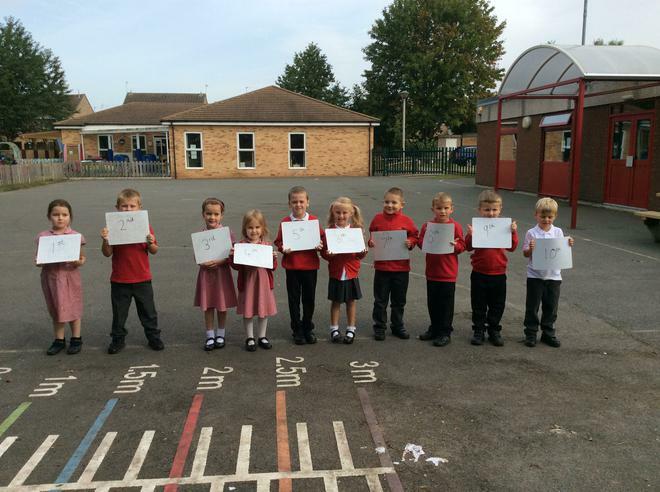 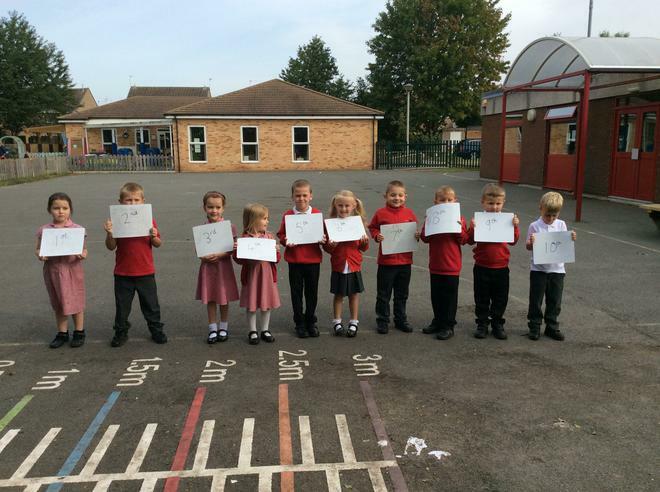 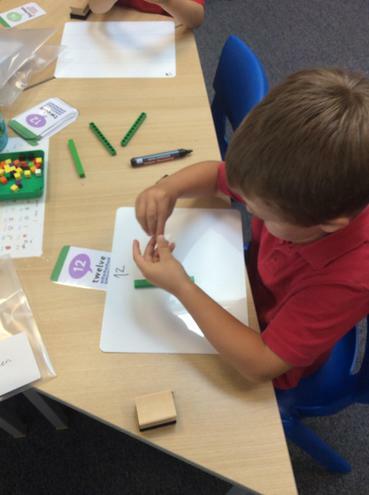 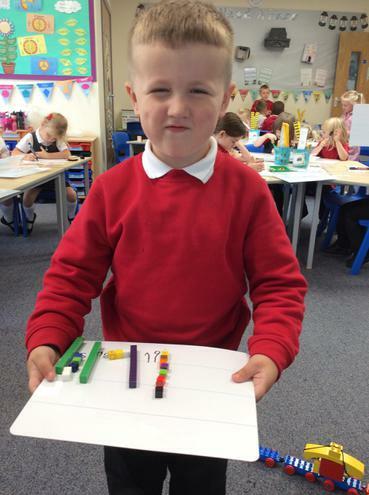 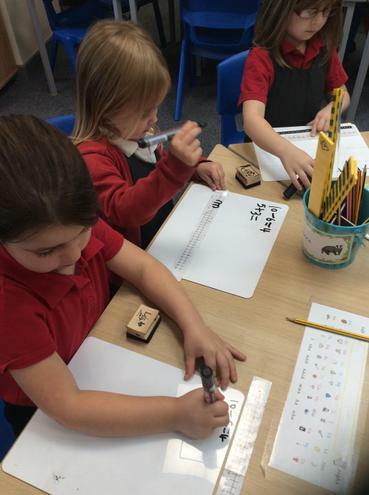 In maths this week we have been learning how to use ordinal numbers in context. 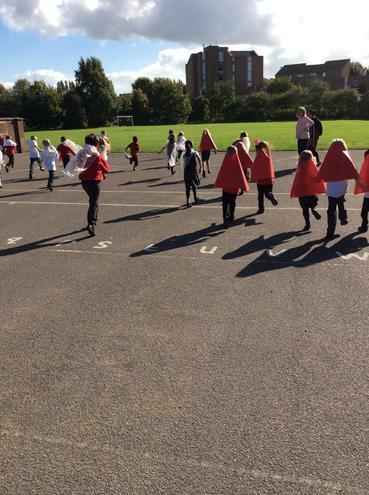 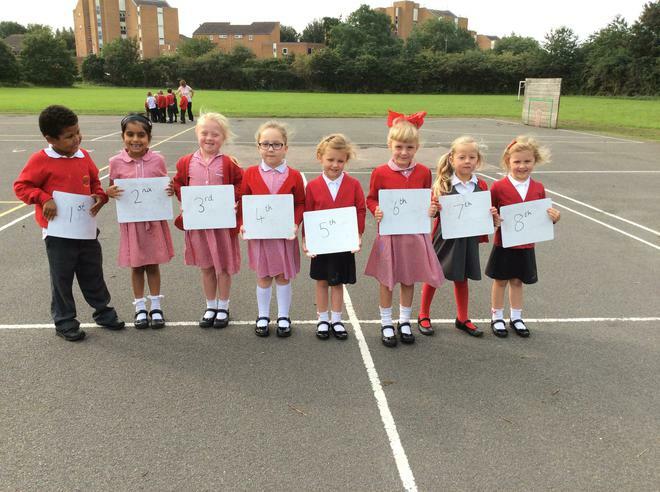 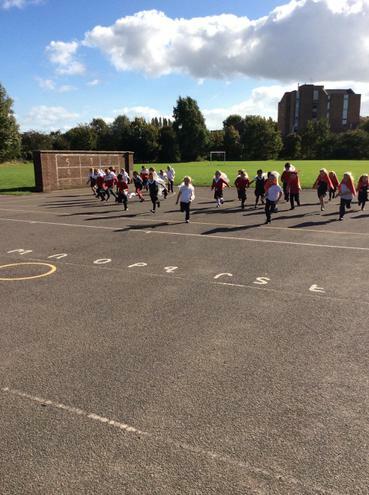 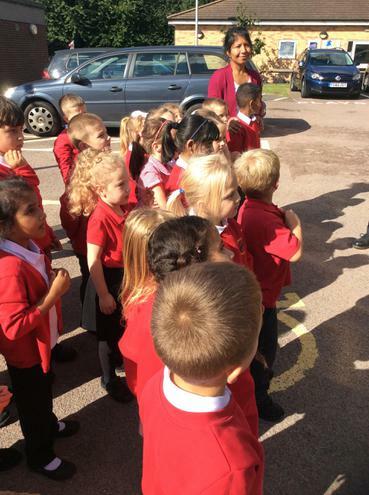 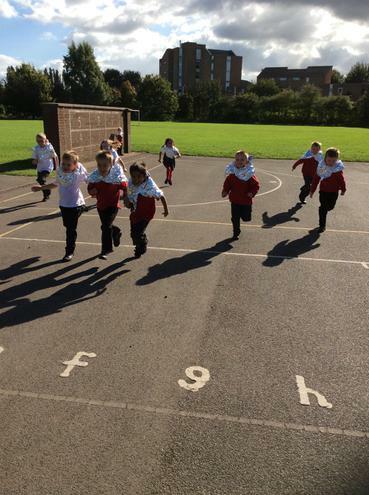 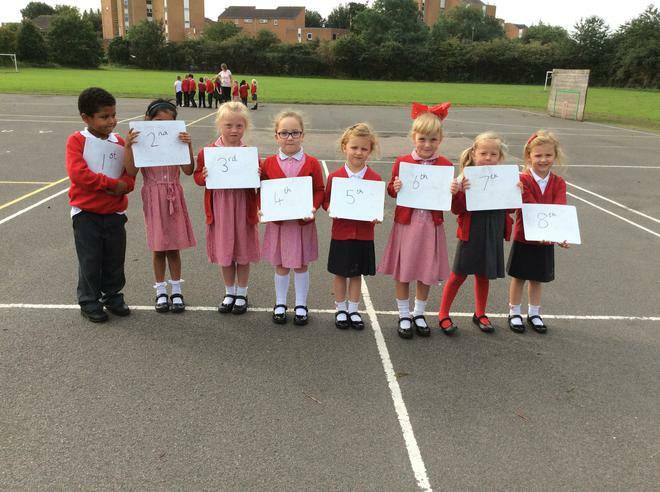 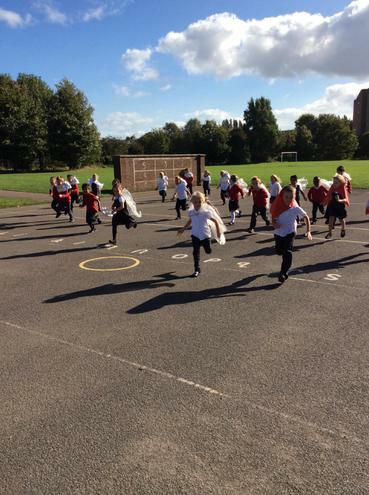 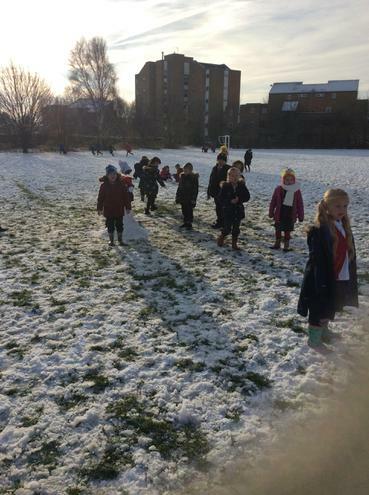 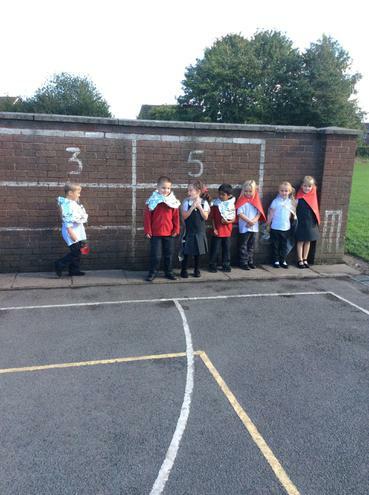 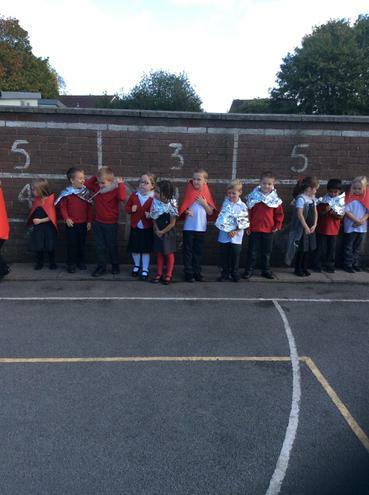 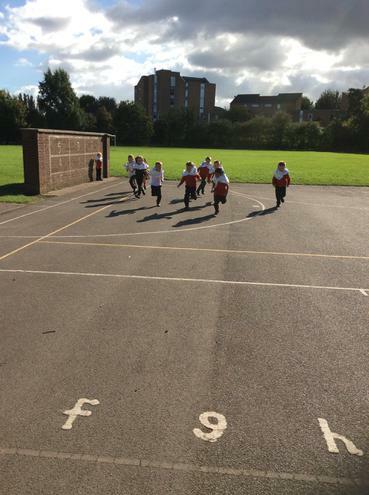 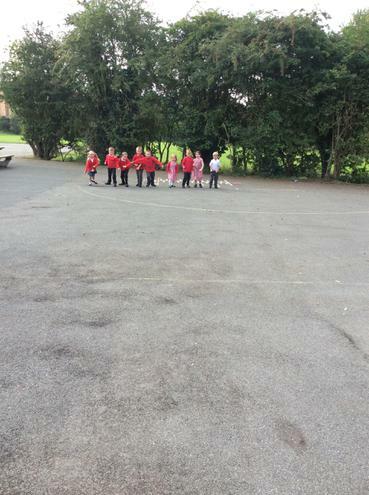 To help us with our understanding and learning we went outside to complete running races and then put ourselves in ordinal order, 1st, 2nd, 3rd etc.. 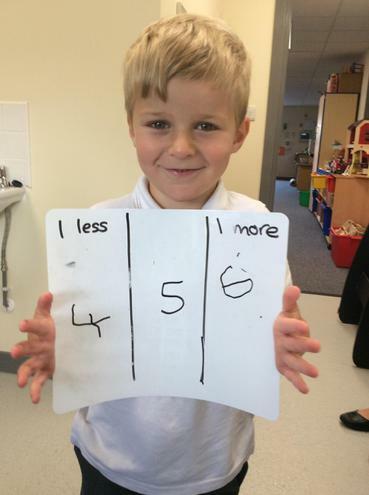 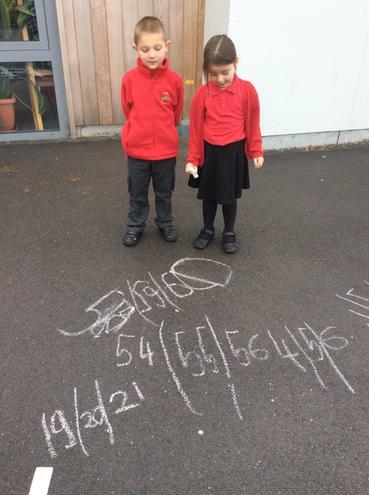 The children were brilliant in this lesson and it led to some fantastic maths work for the rest of the week! 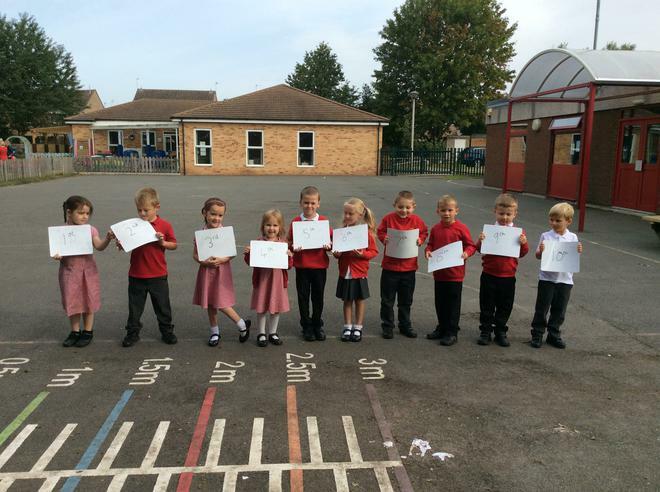 Well done 1F! 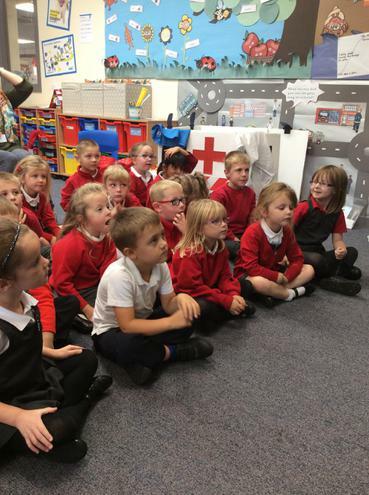 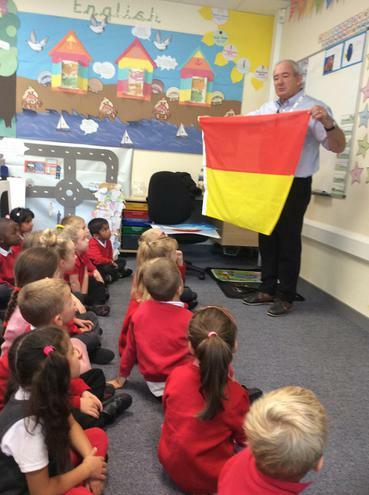 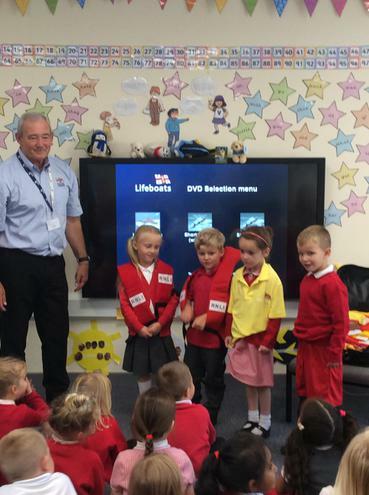 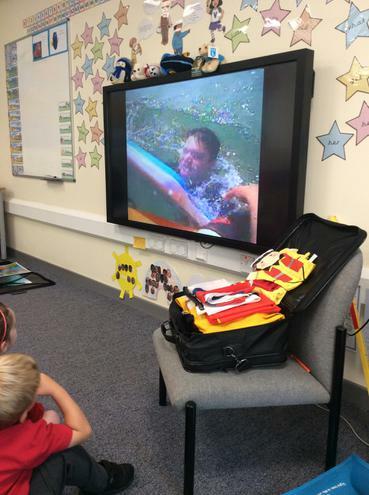 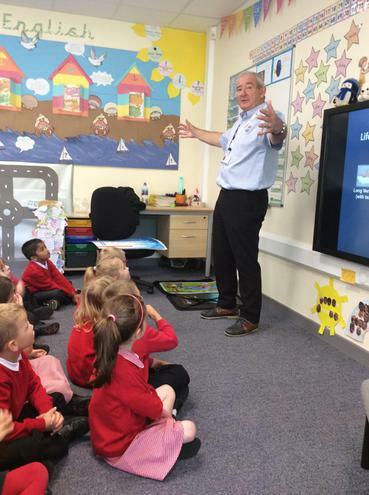 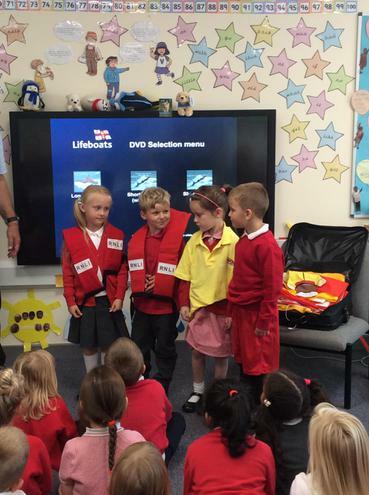 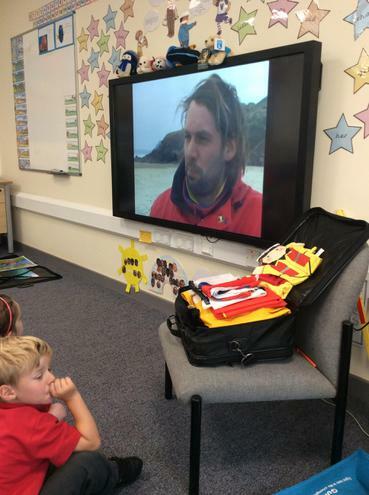 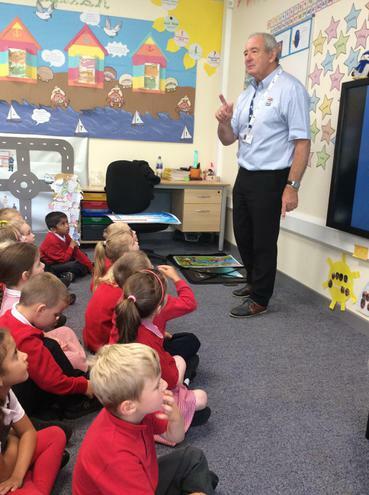 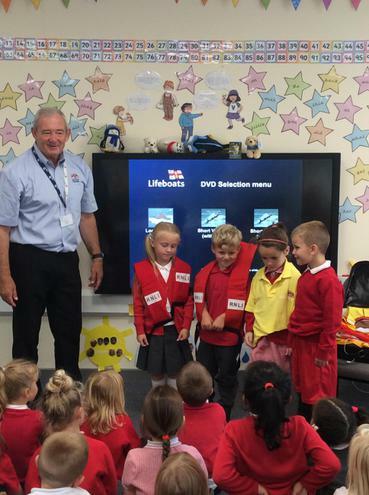 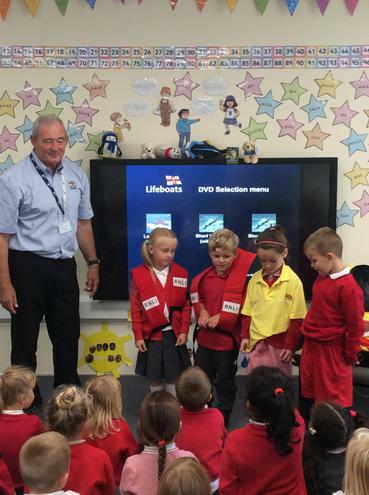 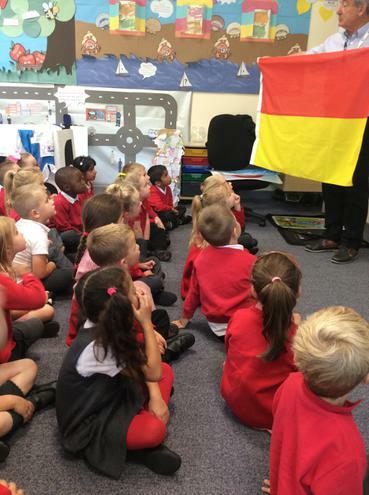 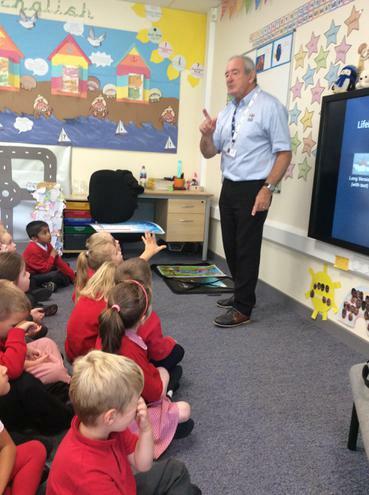 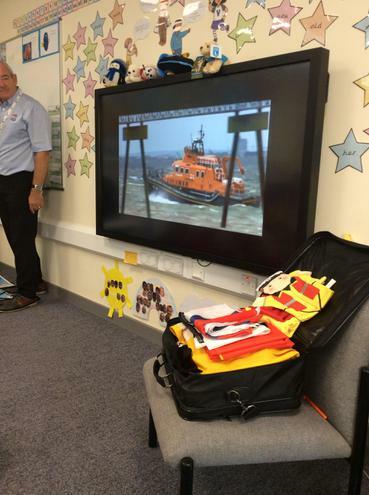 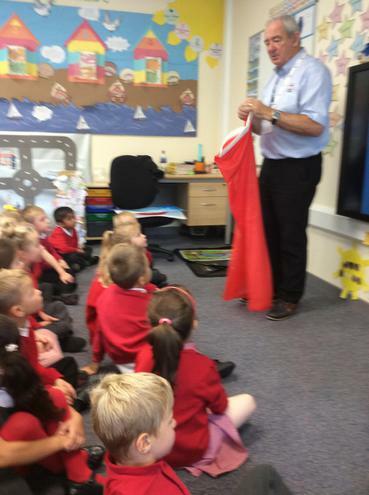 The children have been extremely lucky this week with plenty of visitors and on Tuesday we had Denis from the RNLI come to visit us to teach us all about the importance of staying SAFE near to water. 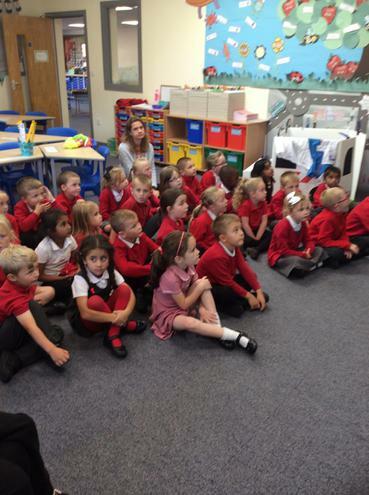 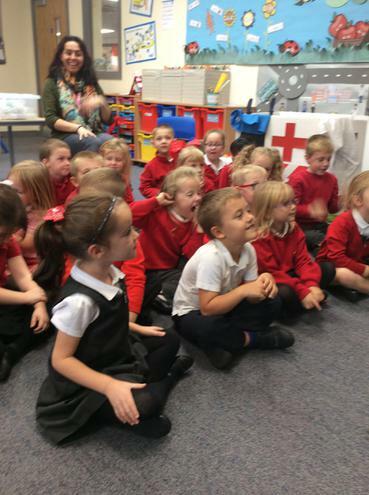 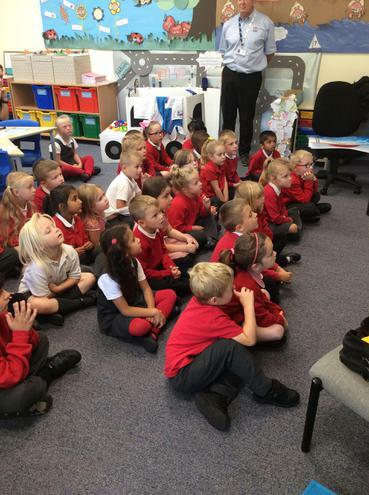 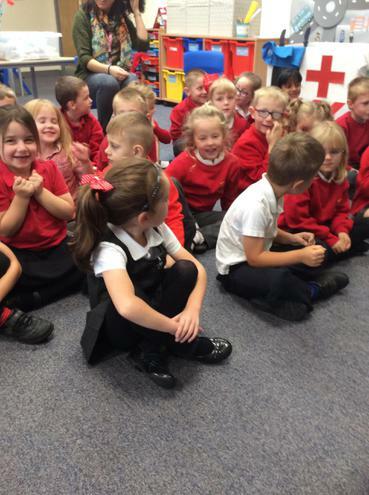 The children listened extremely well and we all learnt so much! 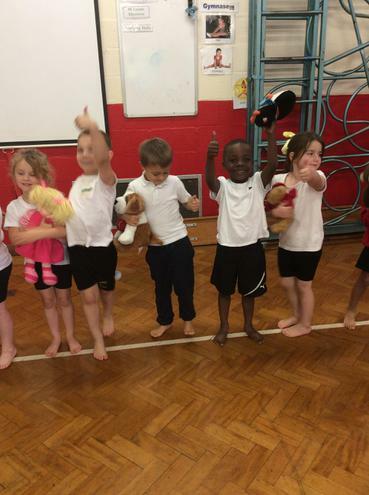 Denis was extremely impressed with all of the children and he even left us a special little Paddington Bear to remember his visit. 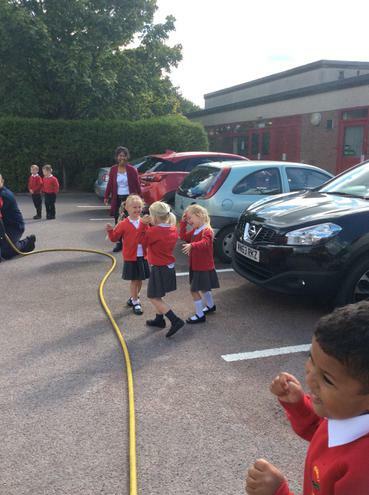 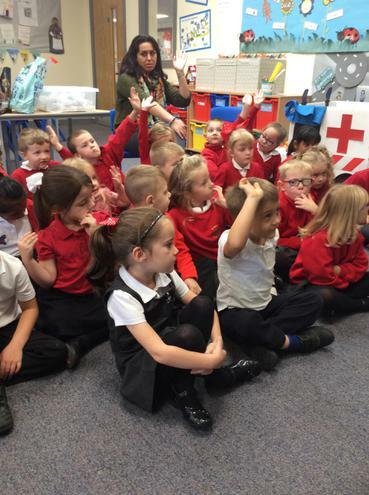 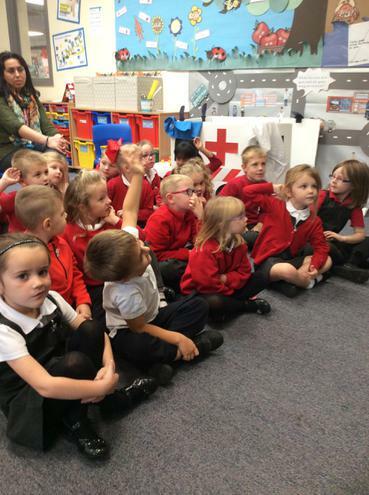 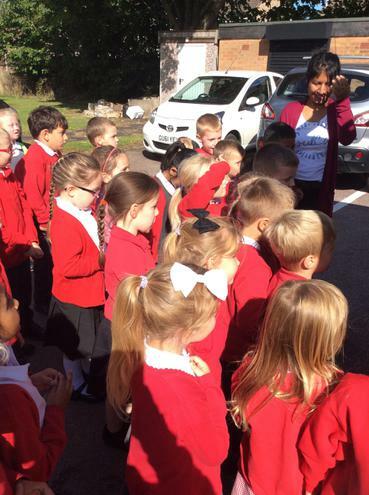 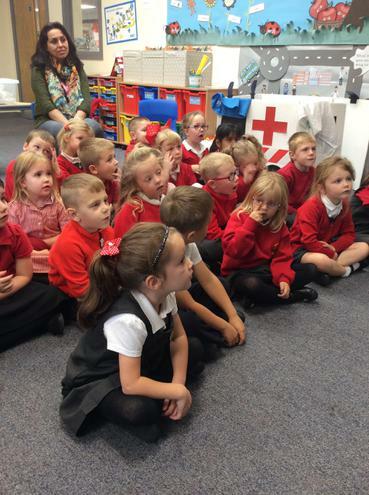 Ask your children all about how they can stay SAFE near to water! 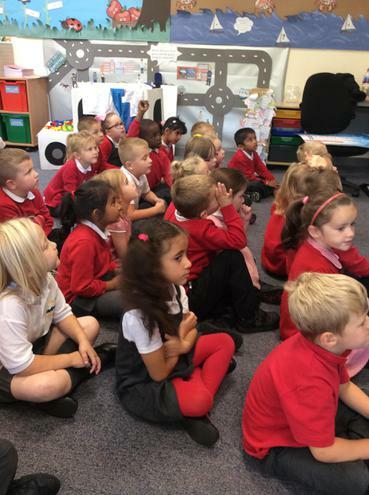 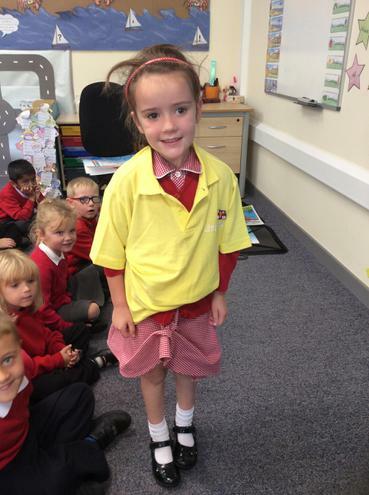 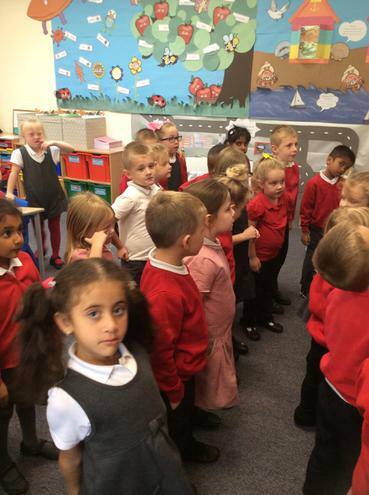 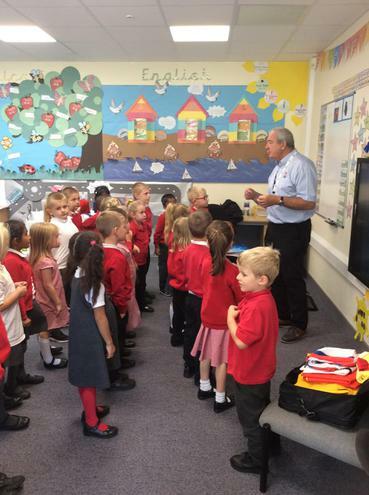 Welcome to class 1F! 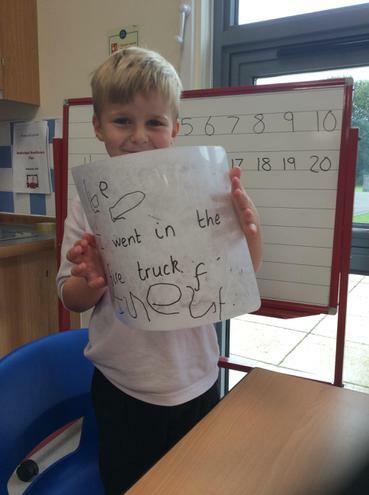 We have already been so busy in Year 1 getting stuck right back into our learning and Miss Fielder is already super proud of us all! 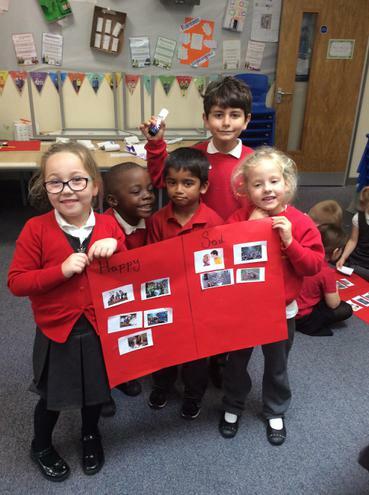 This term our topic is called 'I Need a Hero', it has a history focus where we will be learning all about Florence Nightingale and Mary Seacole. 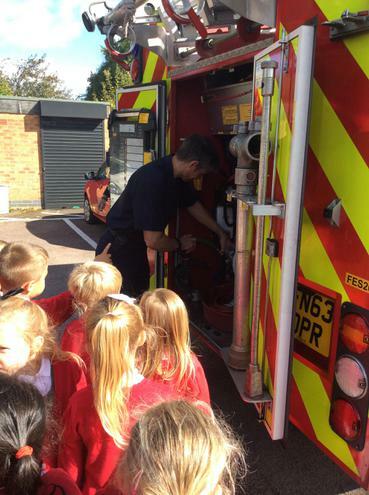 We will also be learning about people who help us and we are very lucky because we have a few visitors coming in to teach us including firefighters, the RNLI and guide dogs. 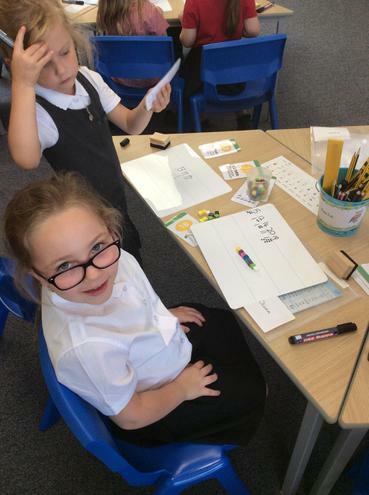 We have been very busy in English on our first week back, we have learnt how to write labels and begin to structure simple sentences. 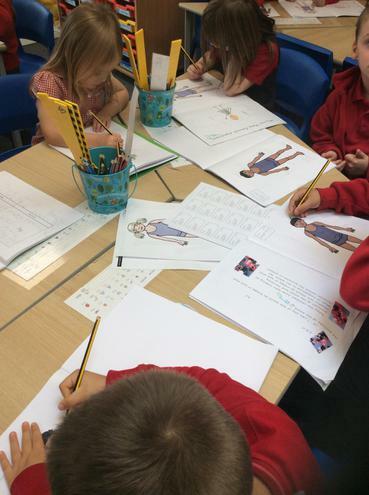 We were so good at writing labels that we even created and designed our very own superhero that we labelled and then wrote sentences about! 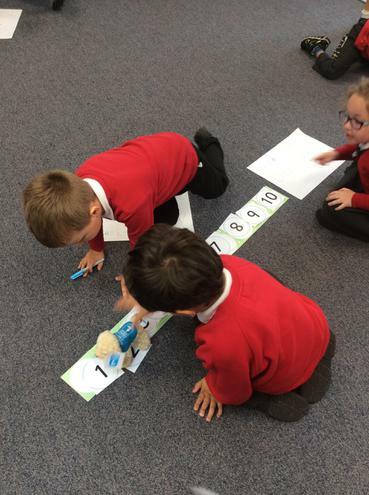 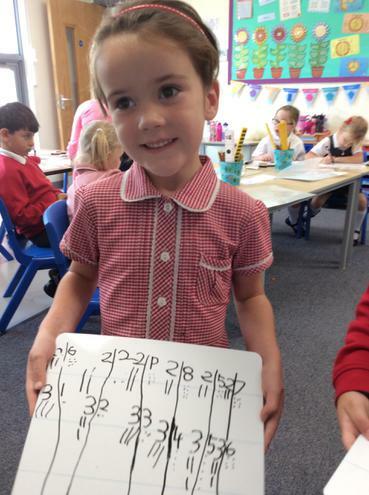 In maths we have been looking at number and place value, we have had lots of fun exploring numbers and practising counting to 20, some of us have even been counting to 100!! 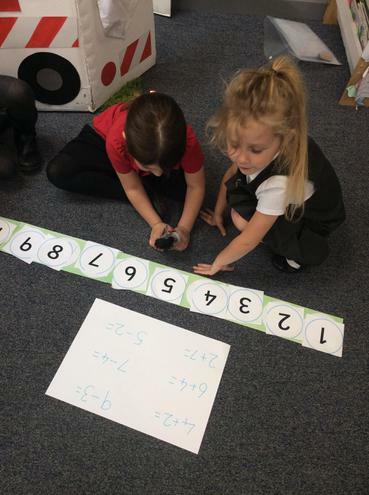 The children had very important jobs because someone made a mistake when they made number lines and number squares, they missed out some of the numbers! 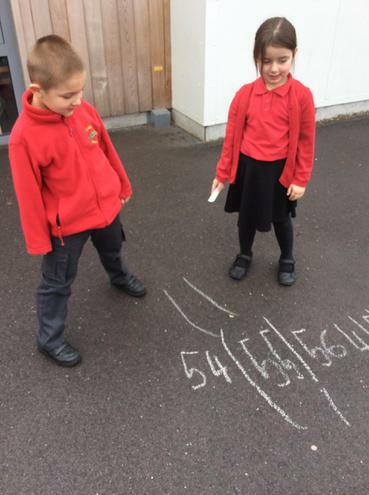 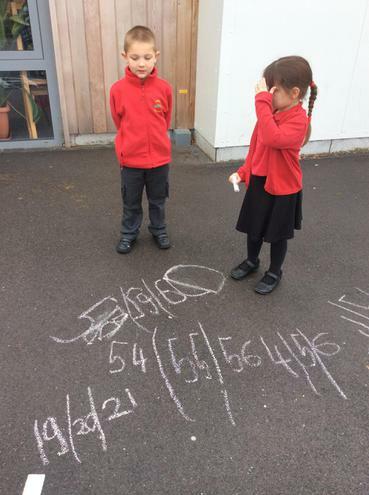 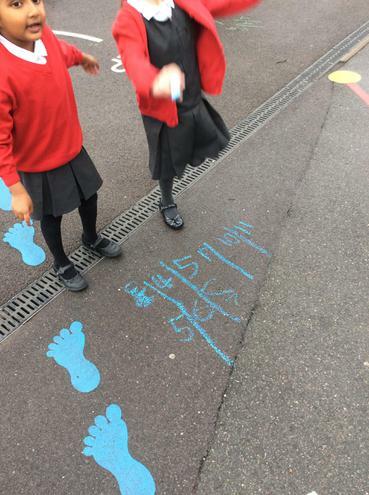 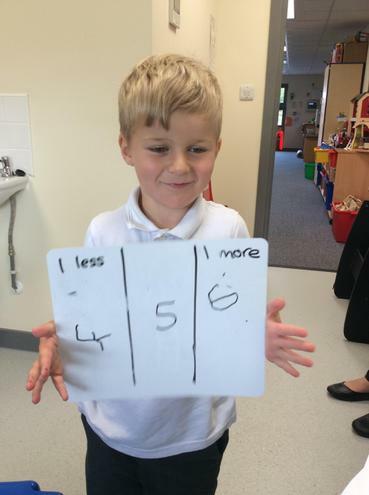 The children worked hard to solve this problem and filled in all of the missing numbers. 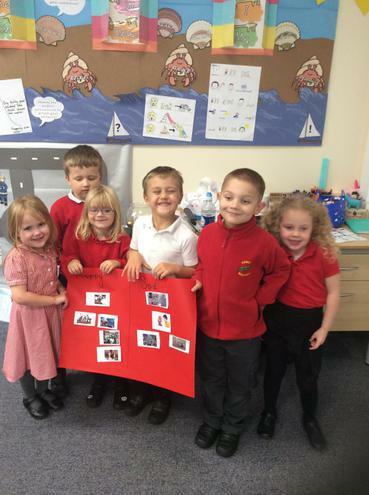 The topic map is attached below which will give you an insight into all of the areas that we will cover this term. 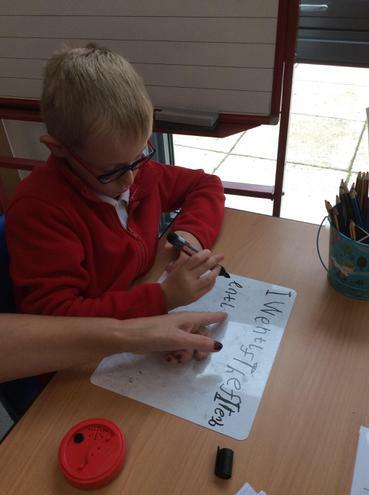 If you have any questions or would like to speak to myself, please pop in for an informal chat after school. 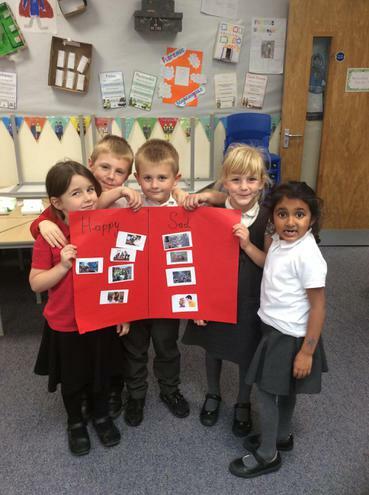 Enjoy looking at the pictures to see all that we have been getting up to this past week!